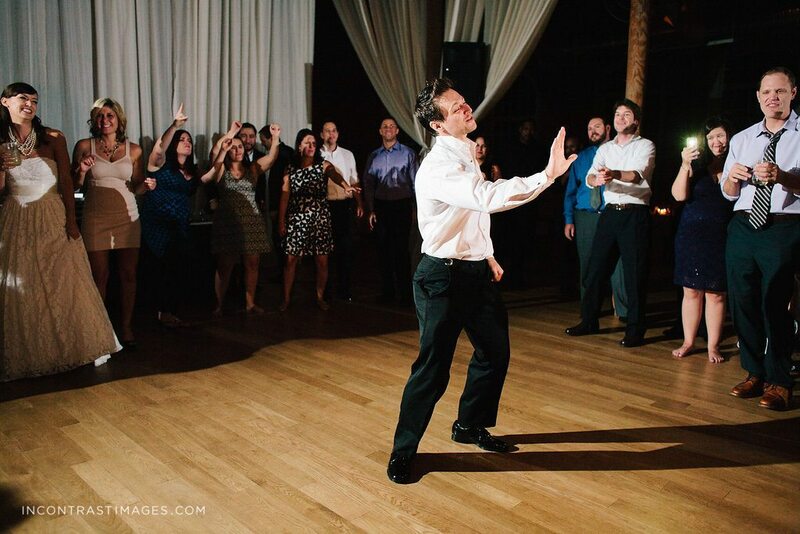 Tag Archives: You’re gonna need a bigger dance floor! 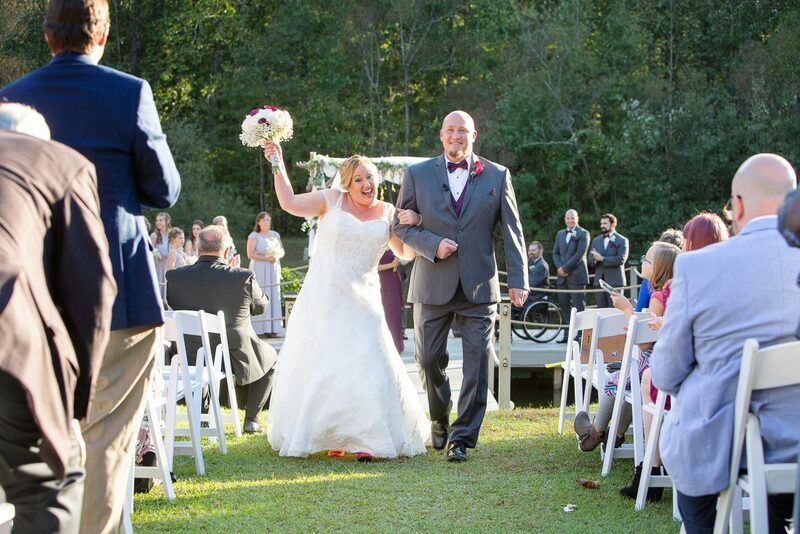 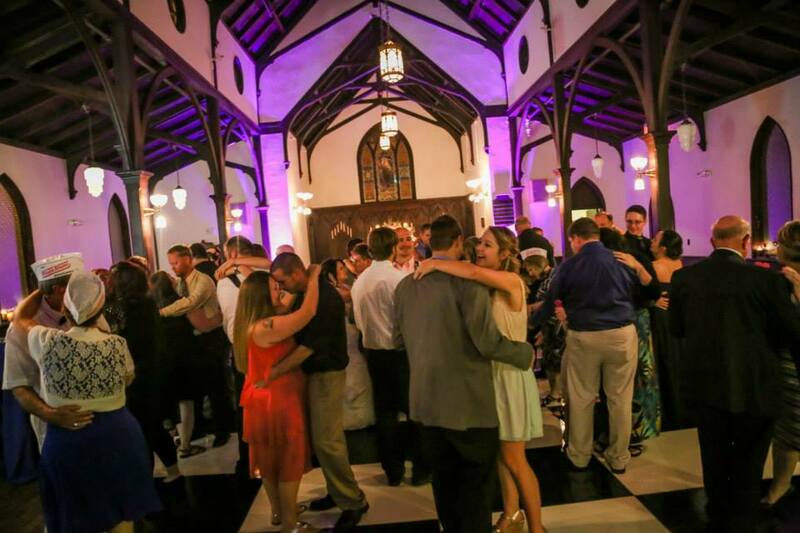 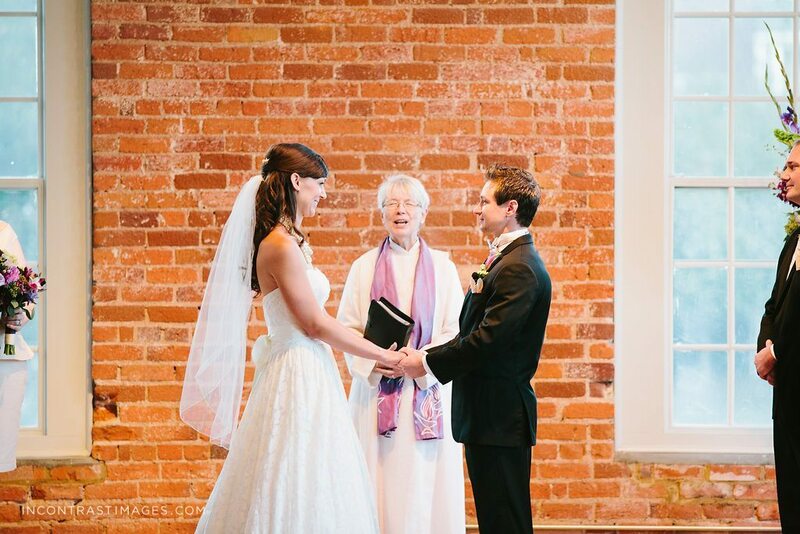 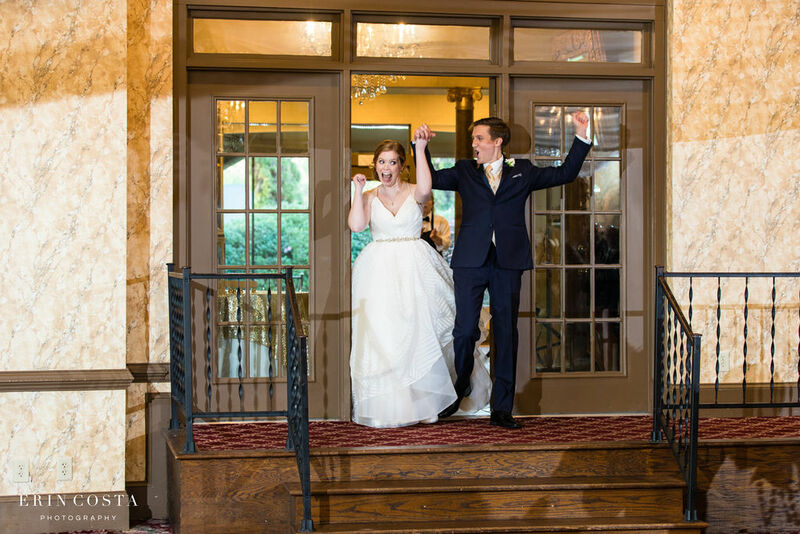 Want to know what we really, truly loved about Barbara & Scott’s wedding? 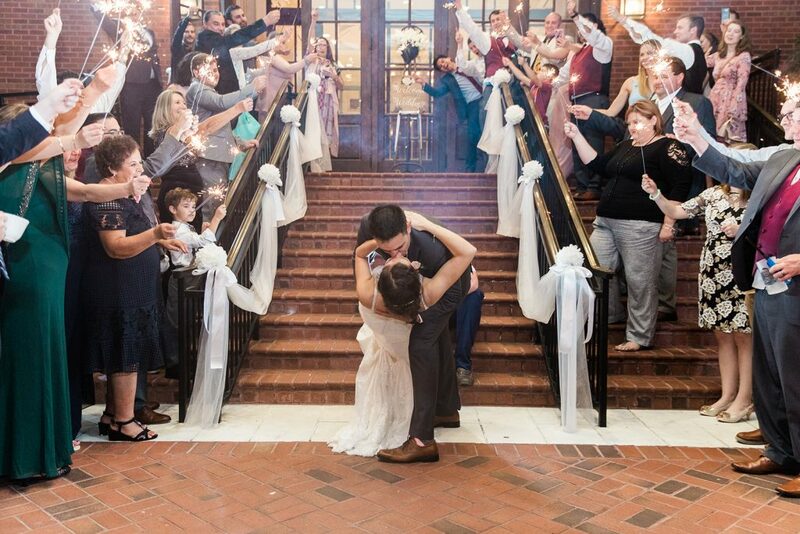 They really did it exactly how they wanted to do it and it turned out perfectly amazing and everything they could have asked for! 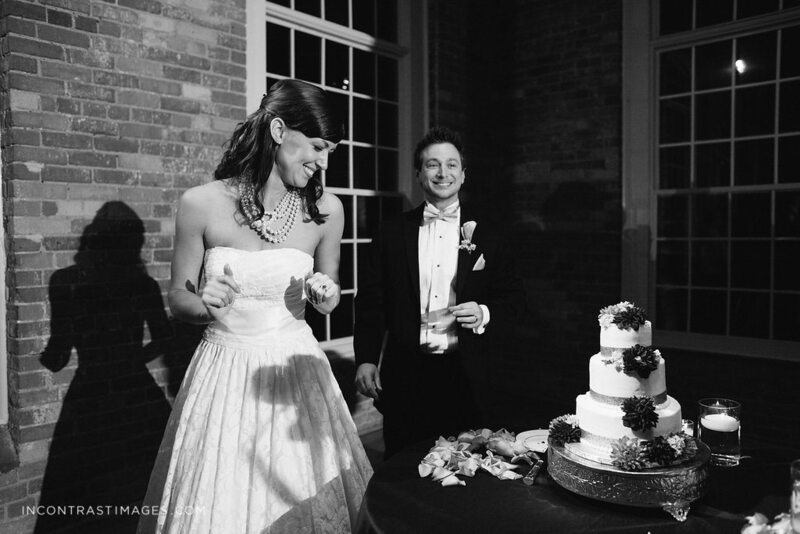 We met Barbara about one year before their wedding date. 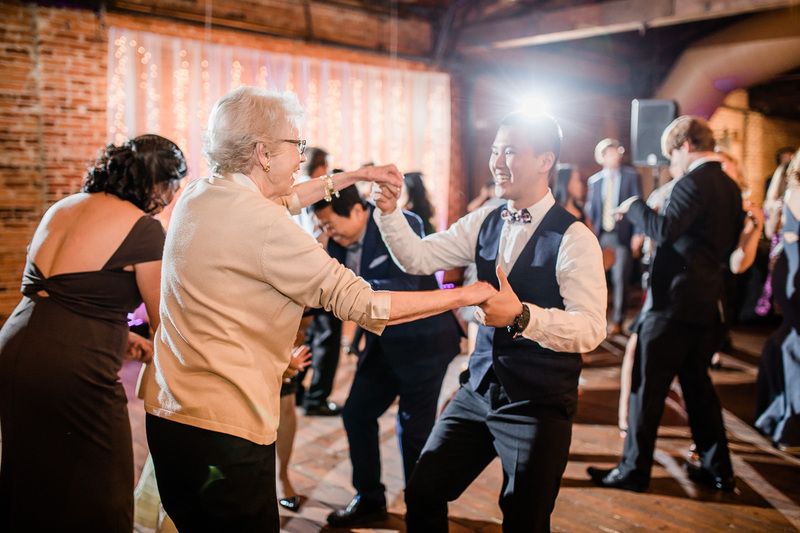 Barbara was a general manager at a local hotel that we do a lot of events at so the pressure was on us! 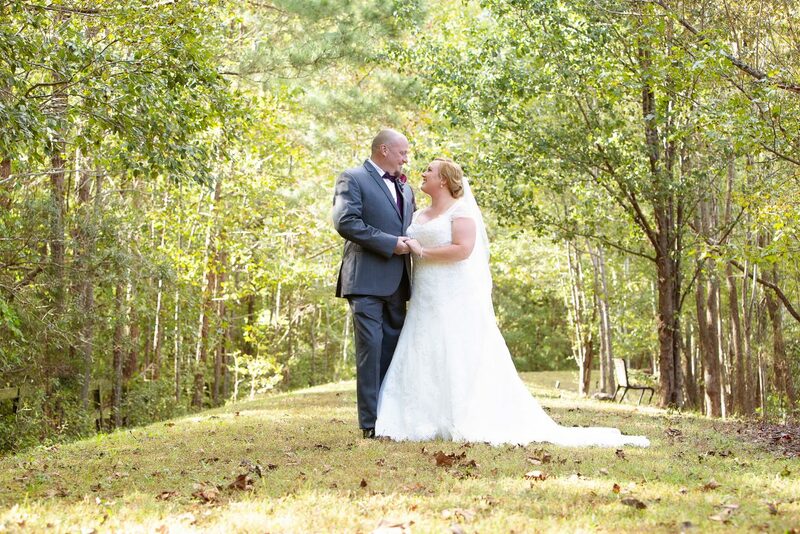 The wedding day was beyond perfect. 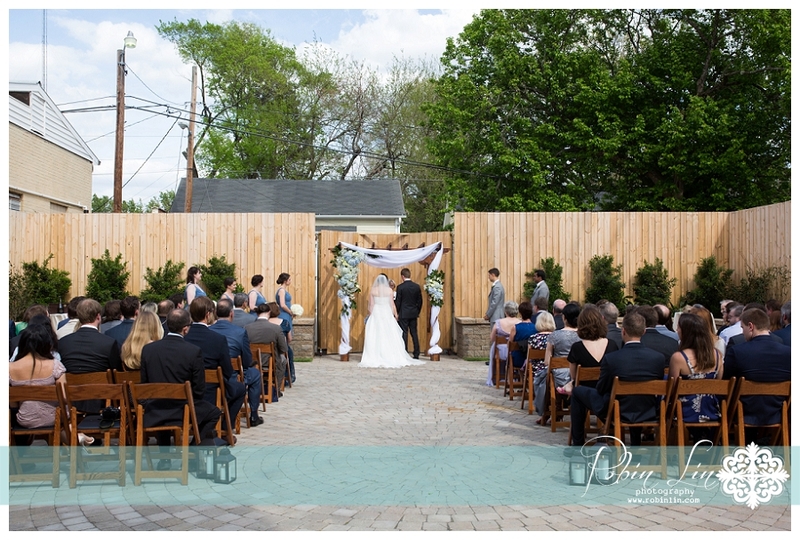 Sunny and dry yet a cool breeze is an amazing wedding day at a venue that really accentuates the outdoor space. 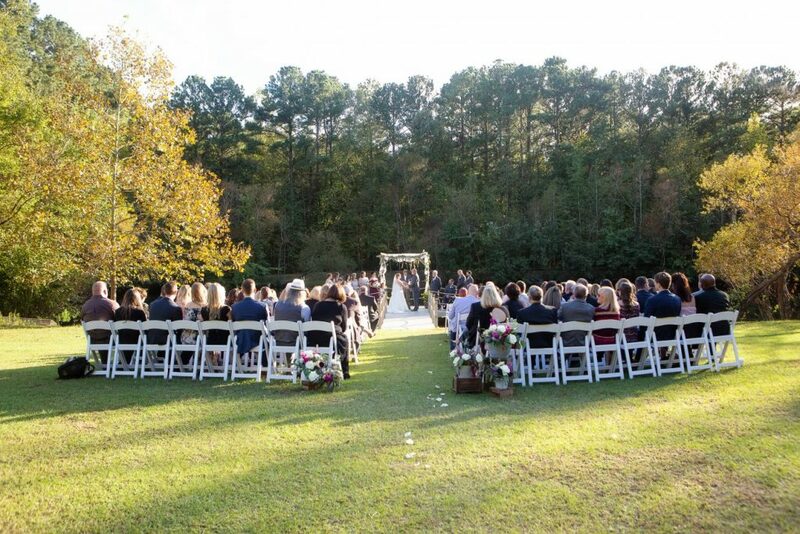 The ceremony setting right by the pond and directly across from the reception site was very picturesque. 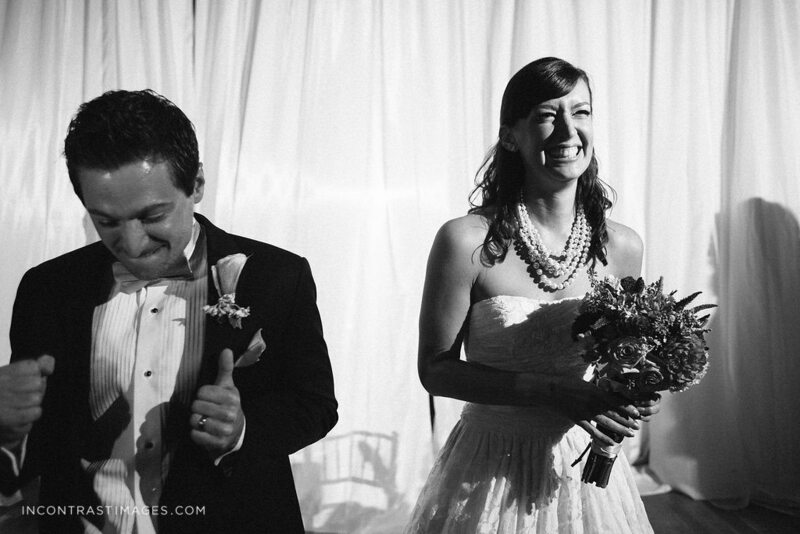 They chose ceremony songs that were traditional but contemporary remakes which is perfect. 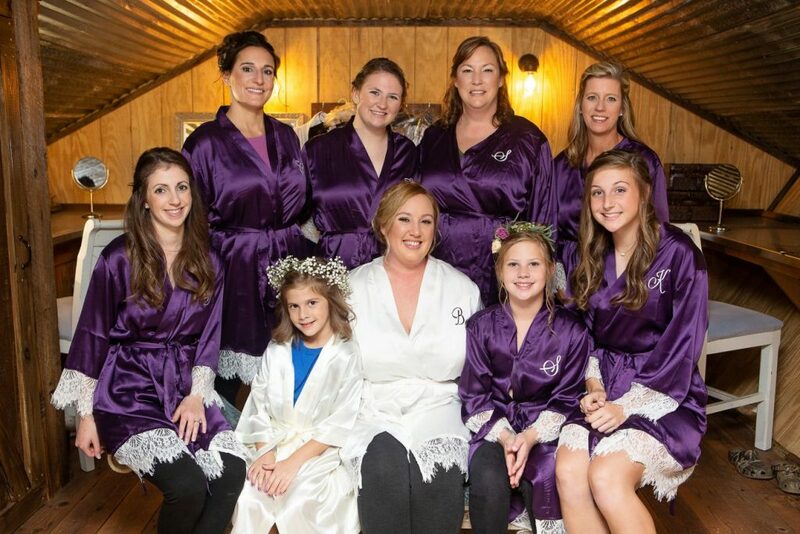 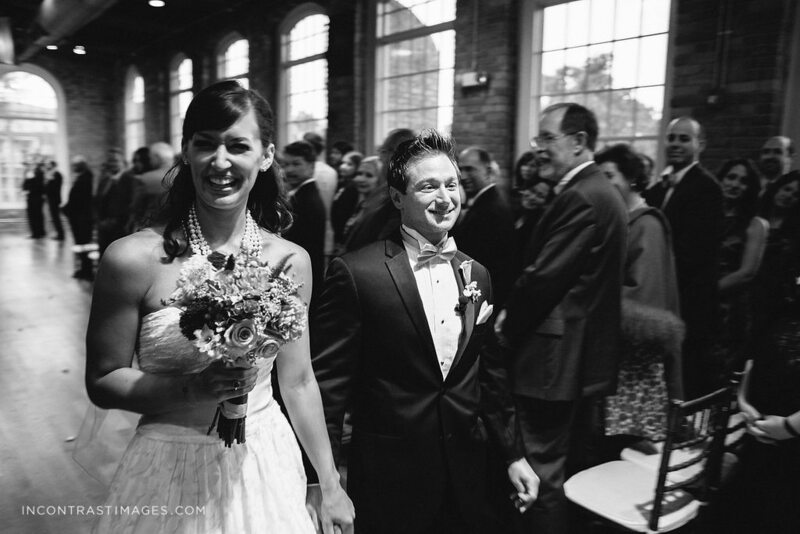 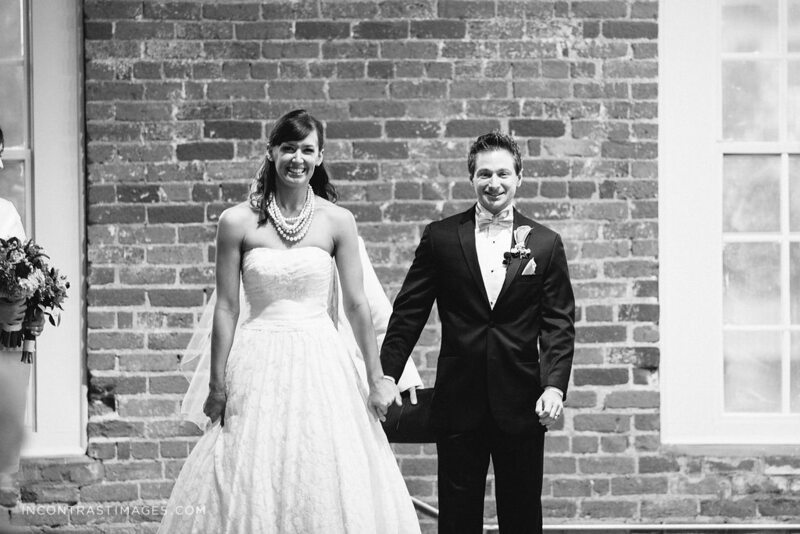 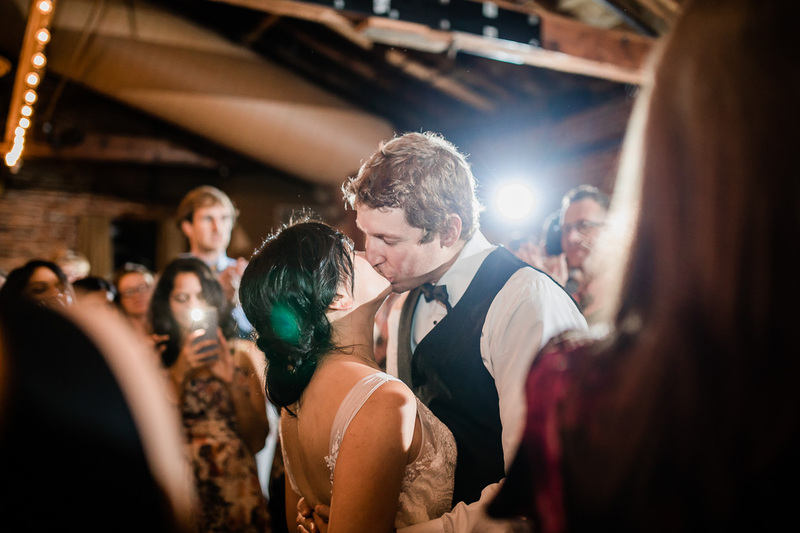 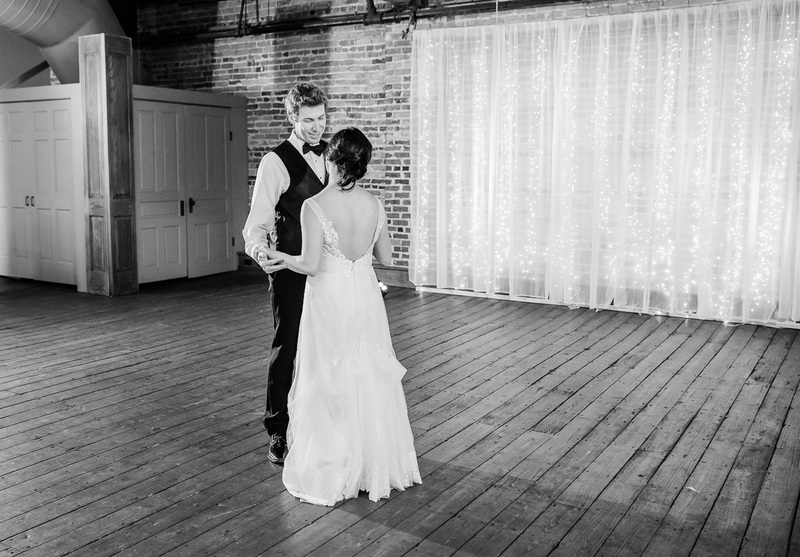 Check out all of the amazing photos by our friend Megan with Megan Kime Photography. Robbi and Kathi at Morris Peaceland Farm are so hands on and wonderful to work with. 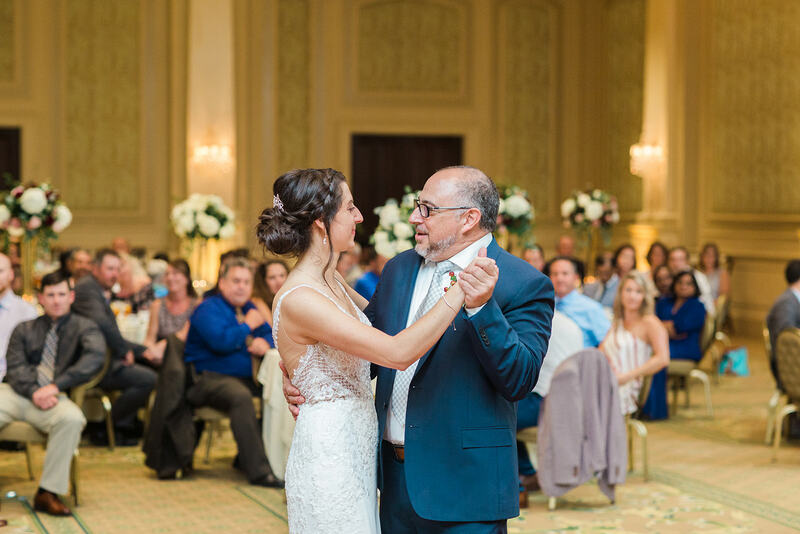 It is so nice to work at a venue where the owners truly put their heart and soul into each event. 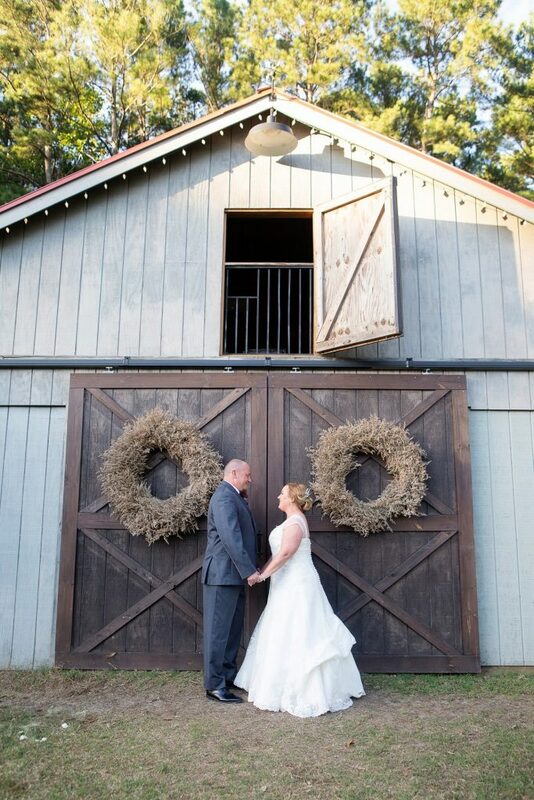 After Scott & Barbara’s ceremony, everyone moved to the barn for cocktails and tunes to upbeat contemporary music like Ray LaMontagne. 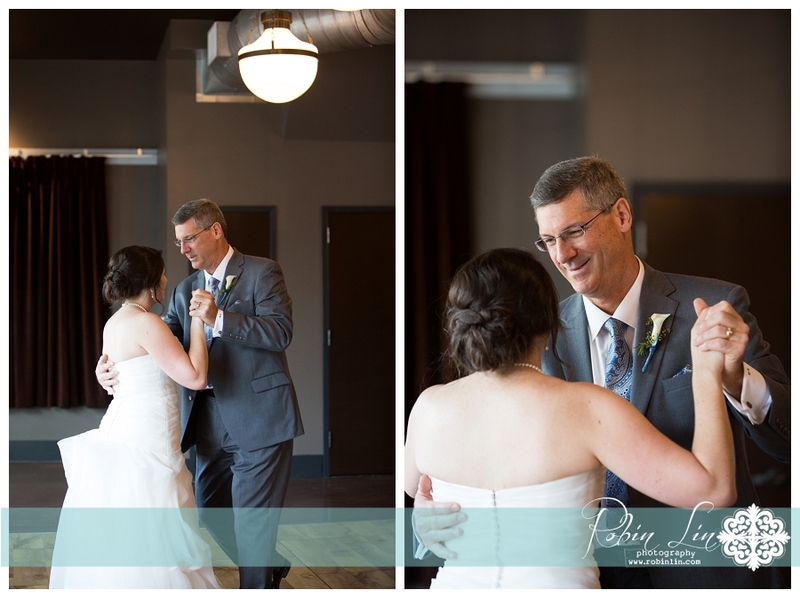 A very funny grand entrance with the ol’ ball and chain was quickly followed by the first dance, father/daughter then mother/son dances. 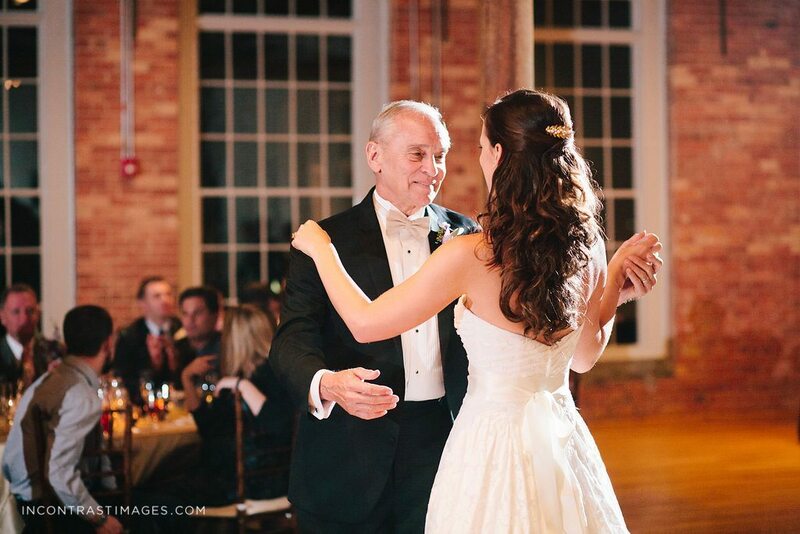 We opened dinner with a welcome by Barbara’s Dad and a blessing by Scott & Barbara’s daughter Savannah. 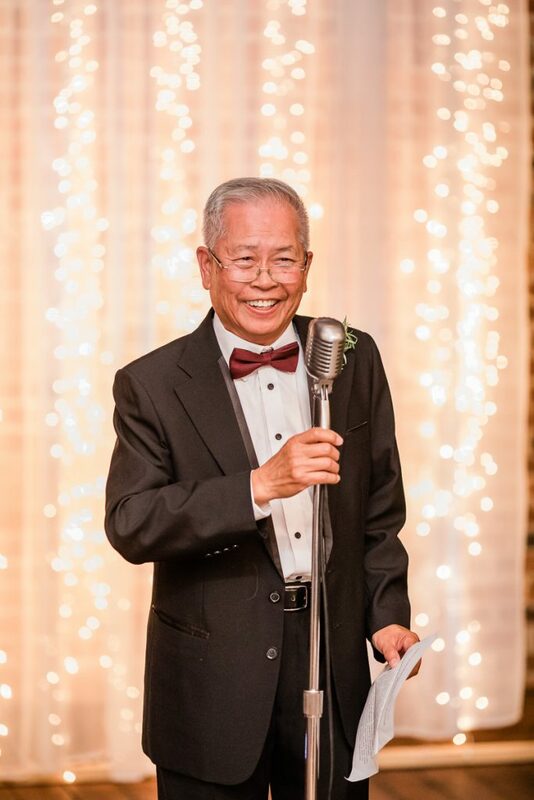 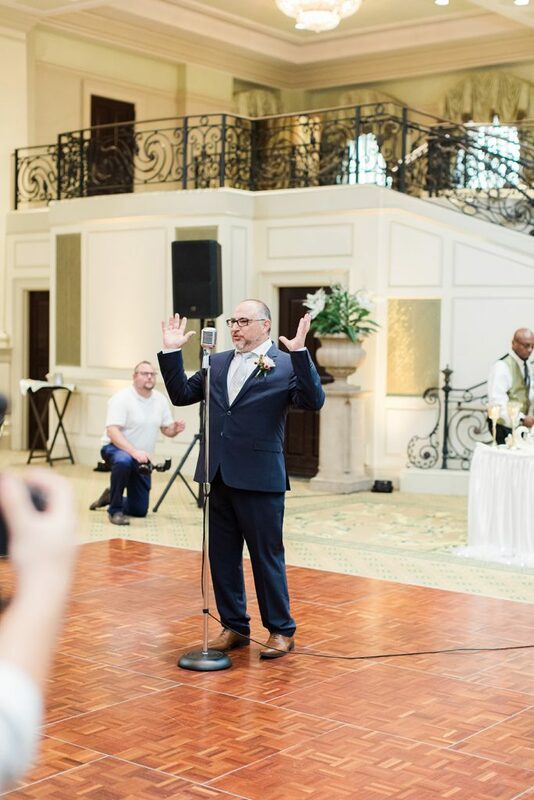 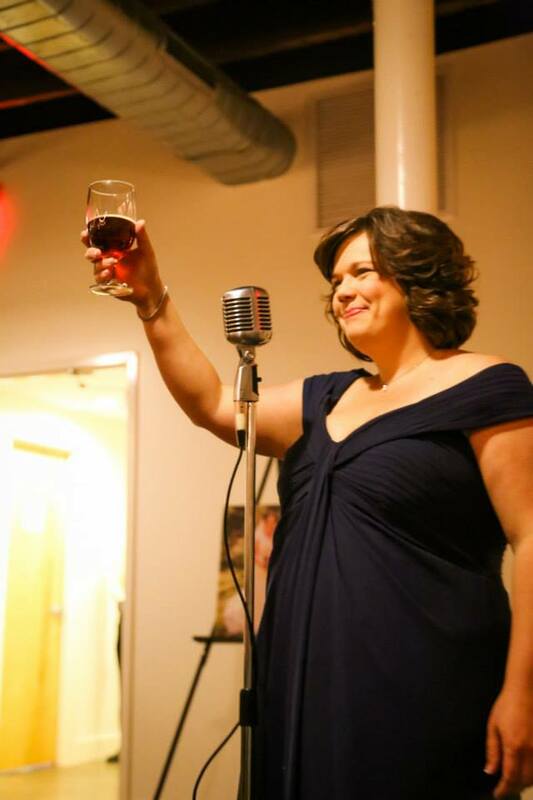 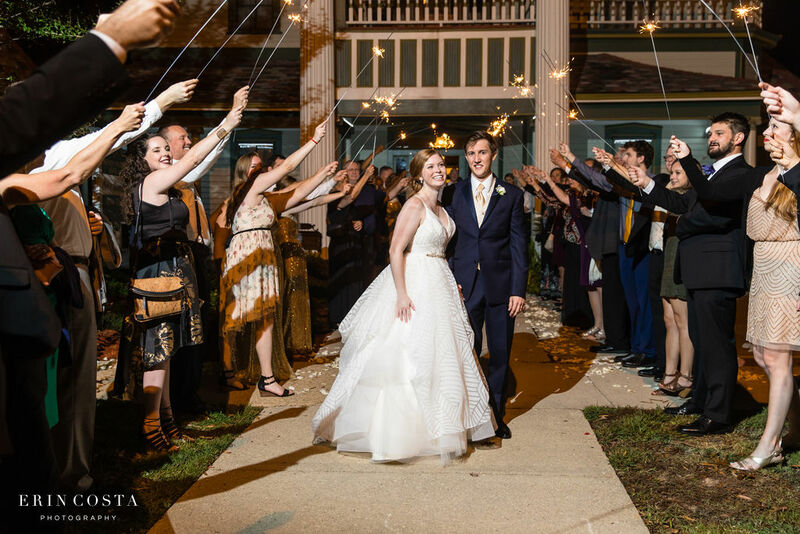 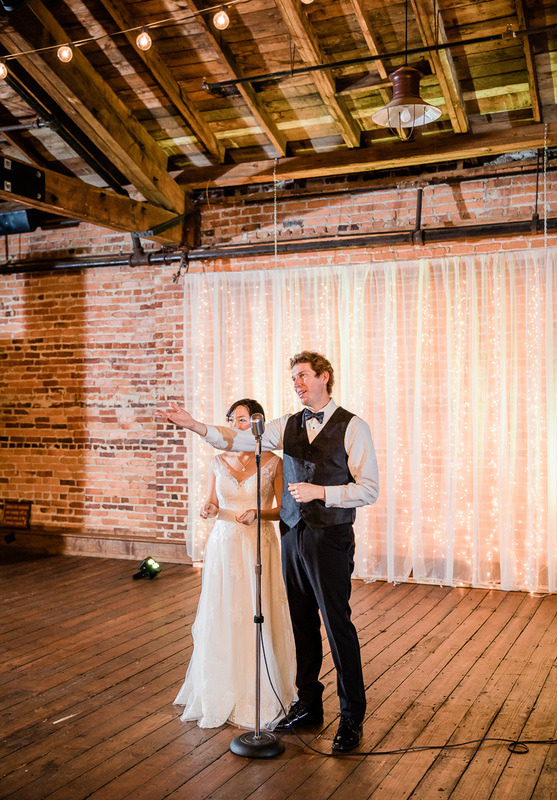 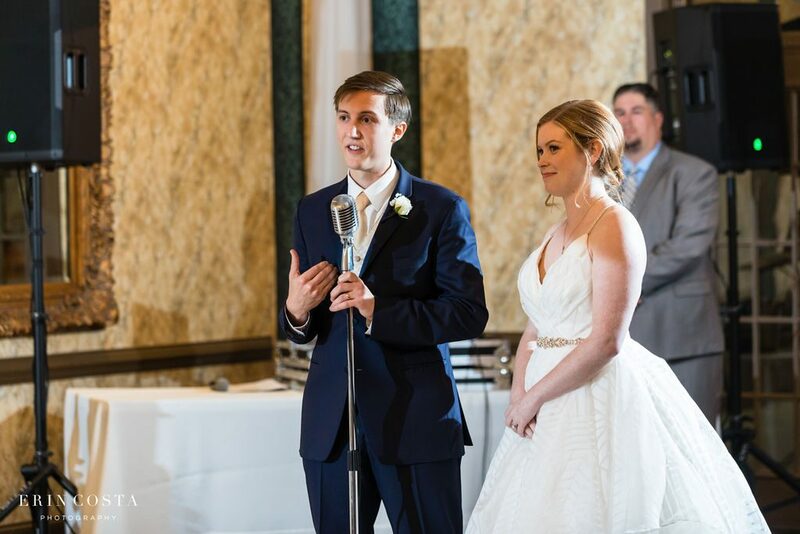 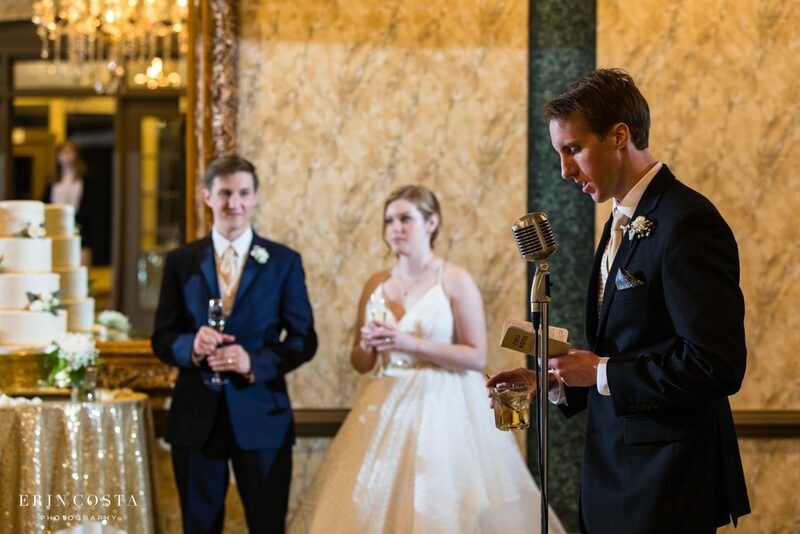 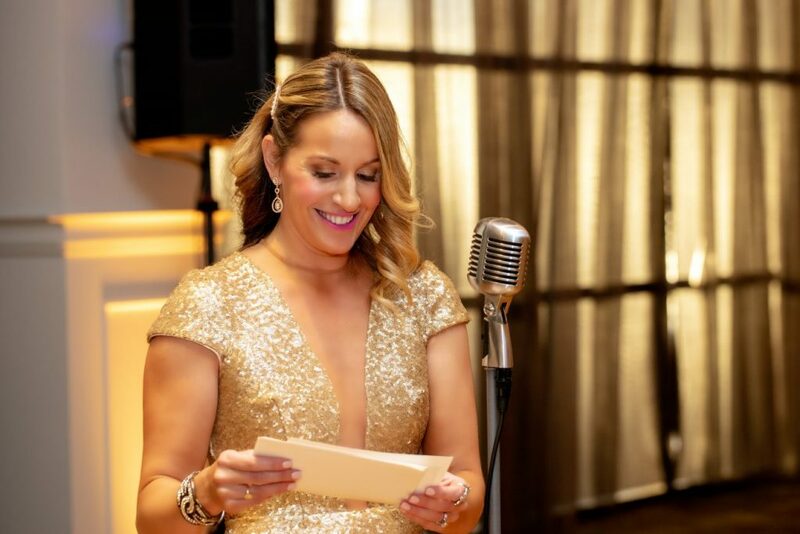 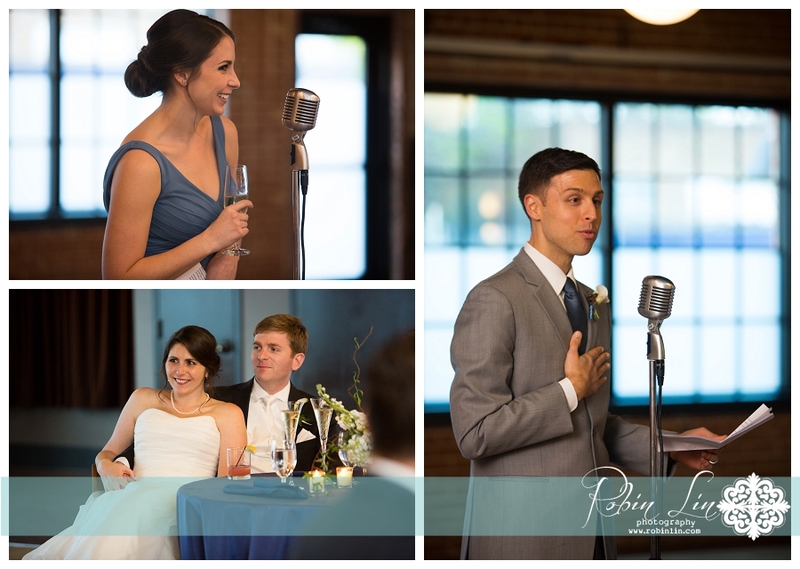 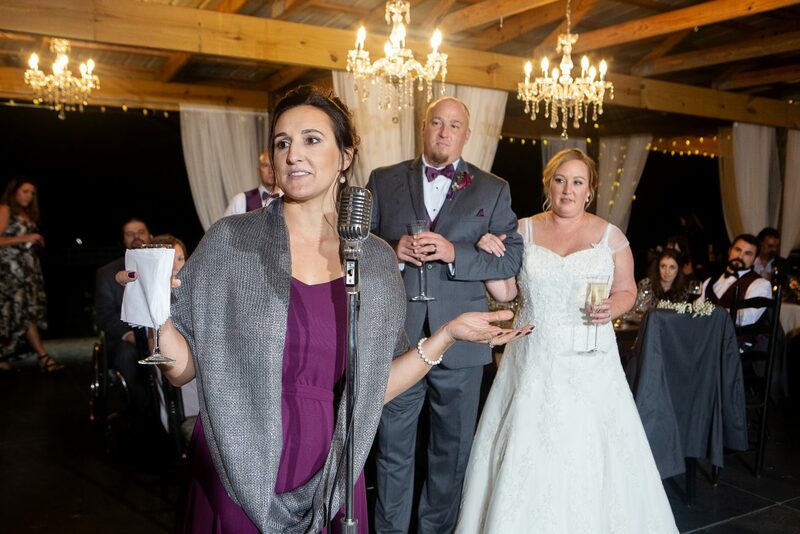 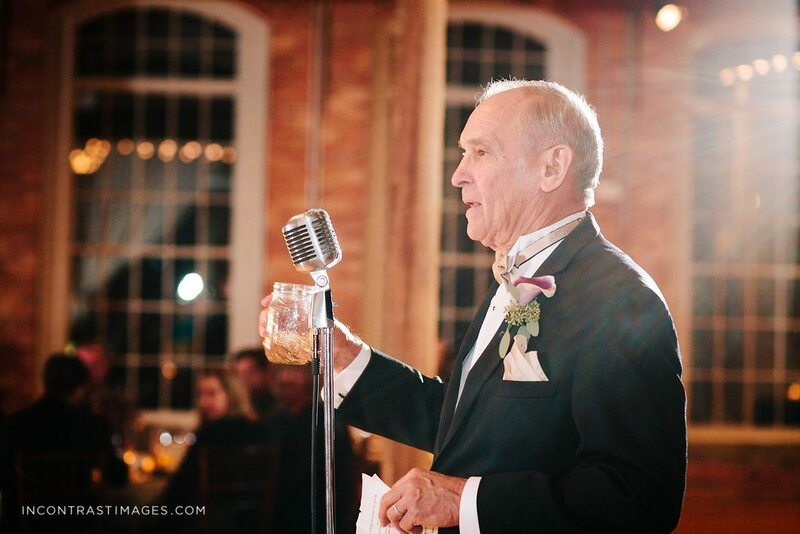 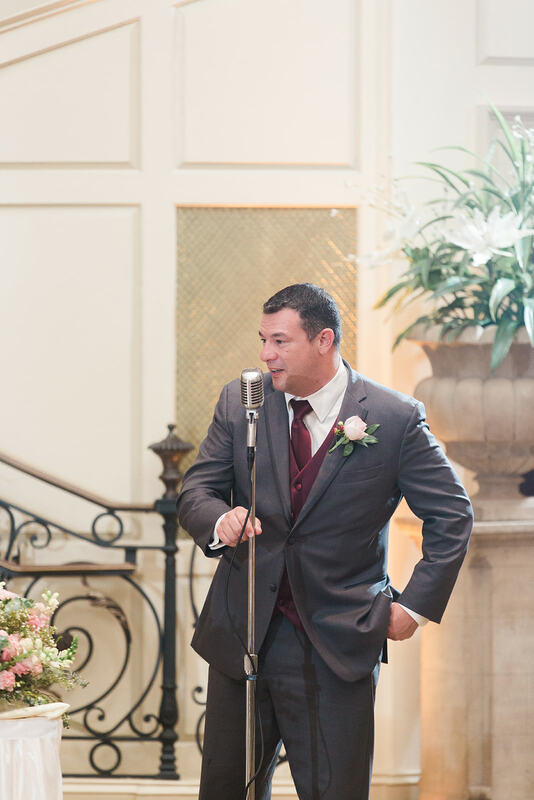 Check out the photos of the welcome, blessing and also the after-dinner speeches using our trademark vintage mic! 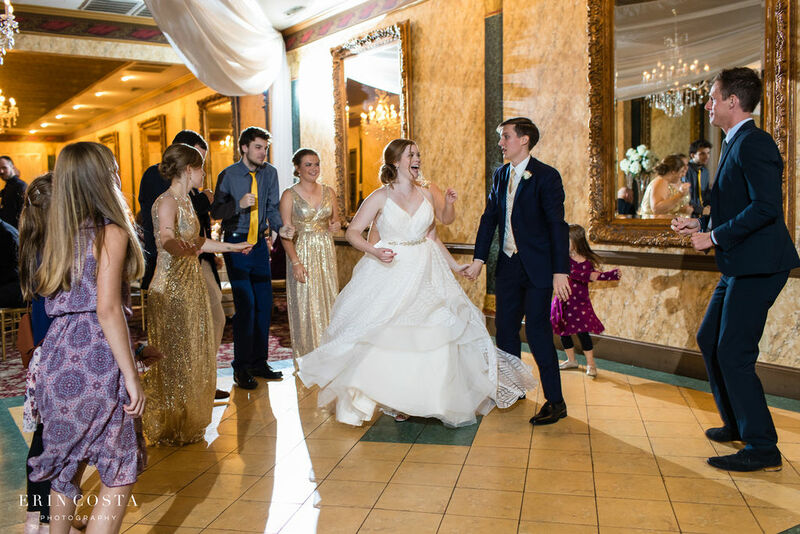 To open up the dance floor, we started with a special dance with Scott and the girls which immediately gave way to a surprise ‘Watch Me Whip’ performance by Scott! 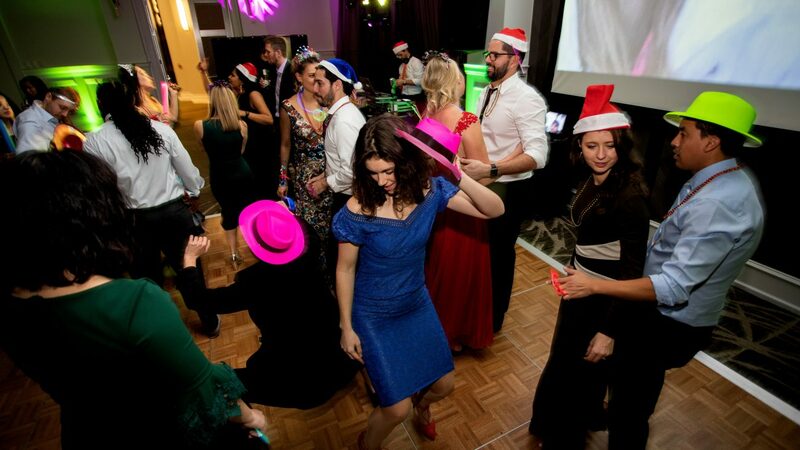 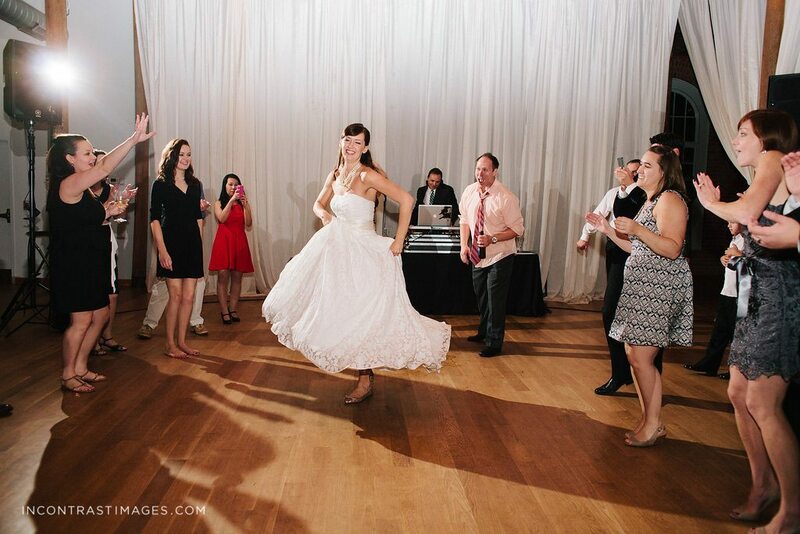 The guests loved it and the dance floor was packed immediately and all night long. 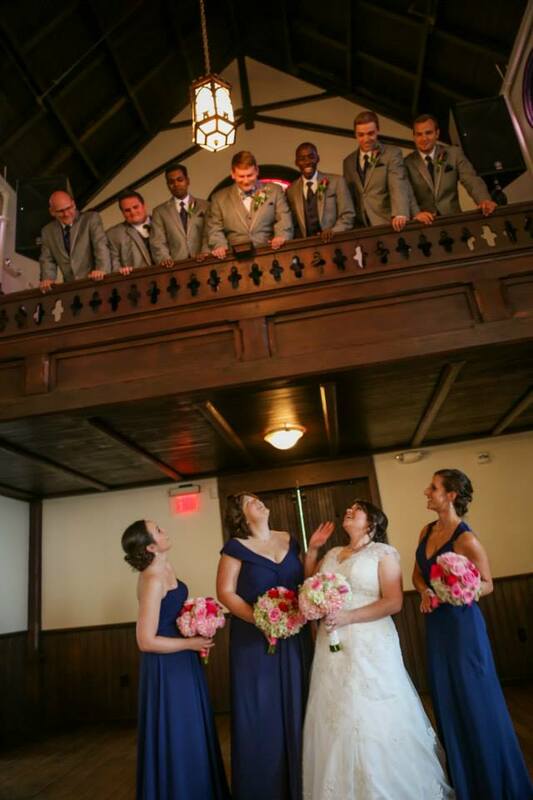 This was such a fun group! 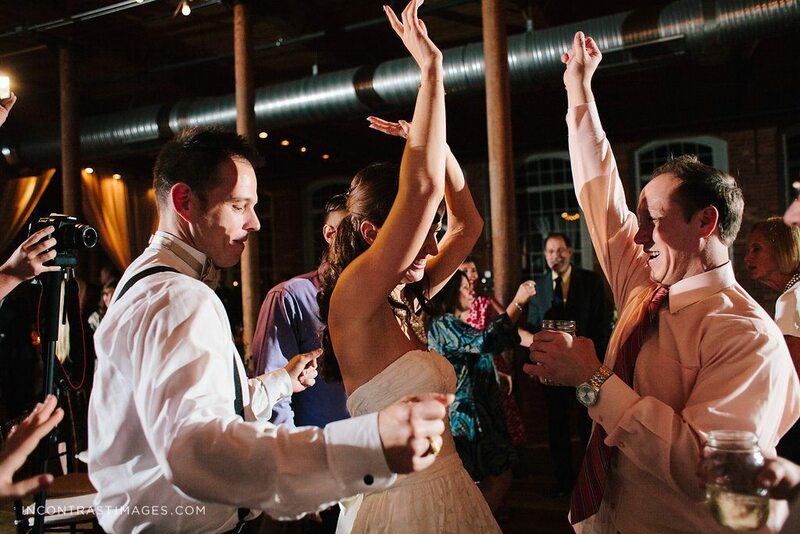 The couple held off on choosing a last song of the night on purpose because they wanted to choose just before. 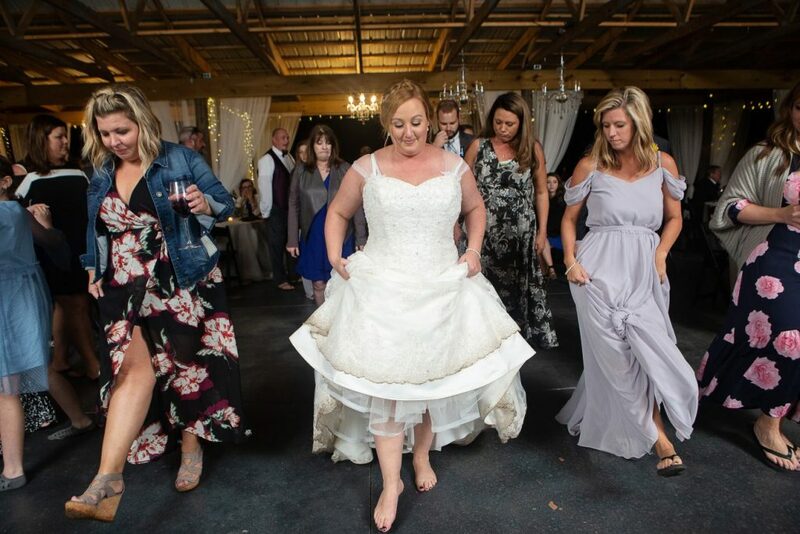 We decided on ‘One’ by Metallica of course. 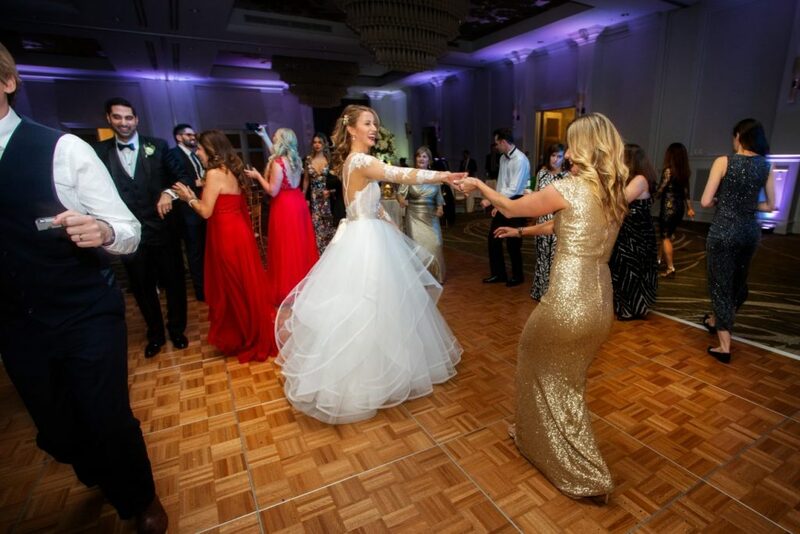 And, of course, you have to play the long version! 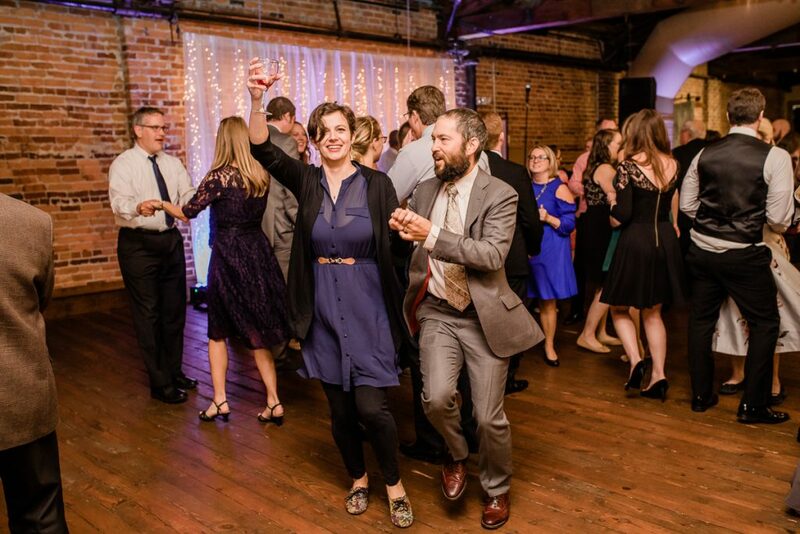 Thanks for letting us rock out your amazing wedding Barbara & Scott! 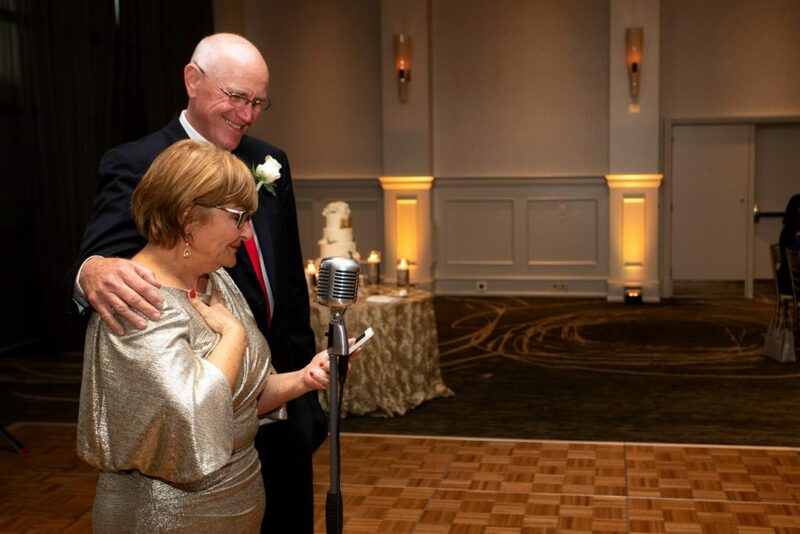 Mr and Mrs Scott and Barbara!! 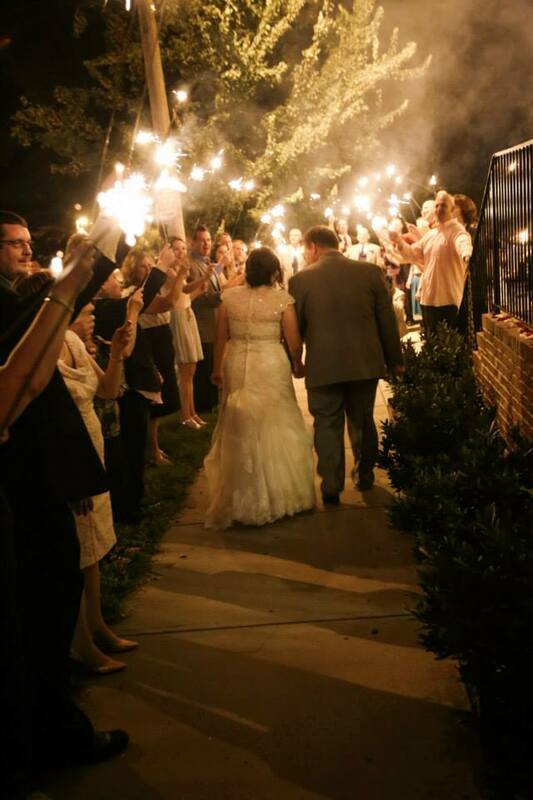 One more amazing wedding this year that we get to brag about! 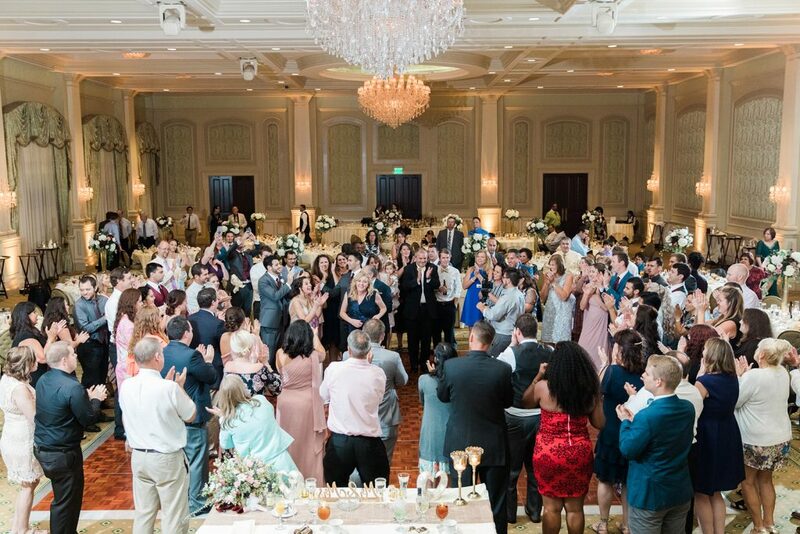 Please enjoy this all-too-short synopsis of an amazing evening that we shared with Casey & Orlando and 150 amazing people. 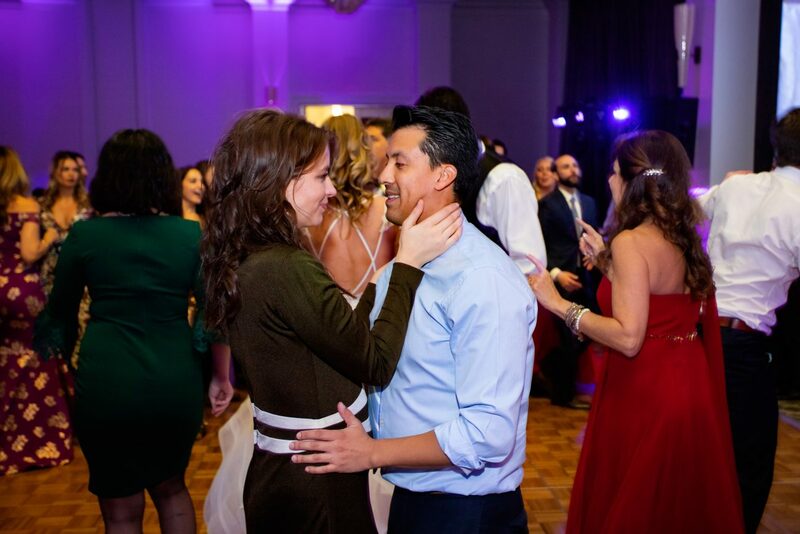 We only got to chat with Orlando & Casey via phone but we got a great feel for this part Colombian wedding. 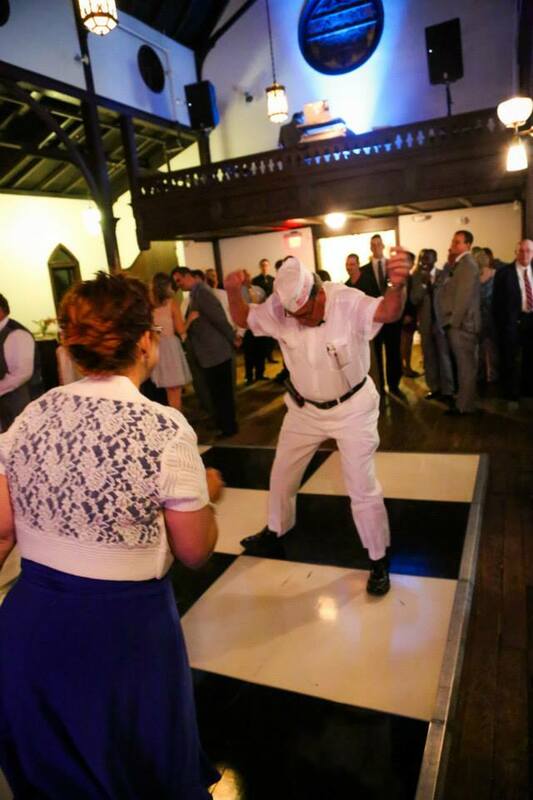 Orlando and his family had a serious taste for fun Latin music and shared it with us. 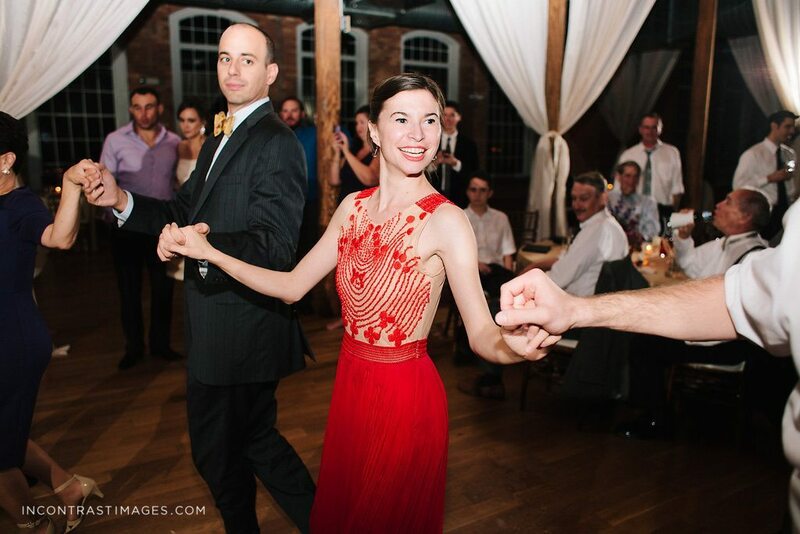 By the time the night was over we felt like we had known Casey & Orlando our whole life! 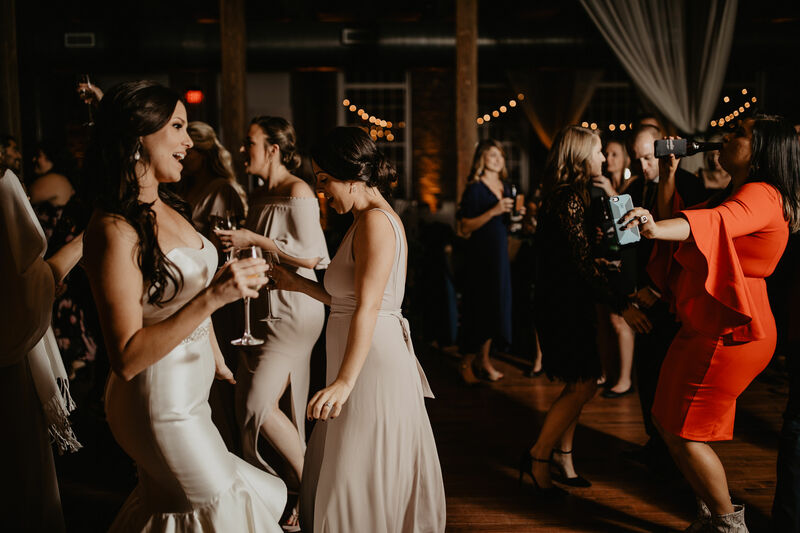 Check out the absolutely amazing photos by Carolina Media Star and pay them a visit if you’re looking for a great photographer. 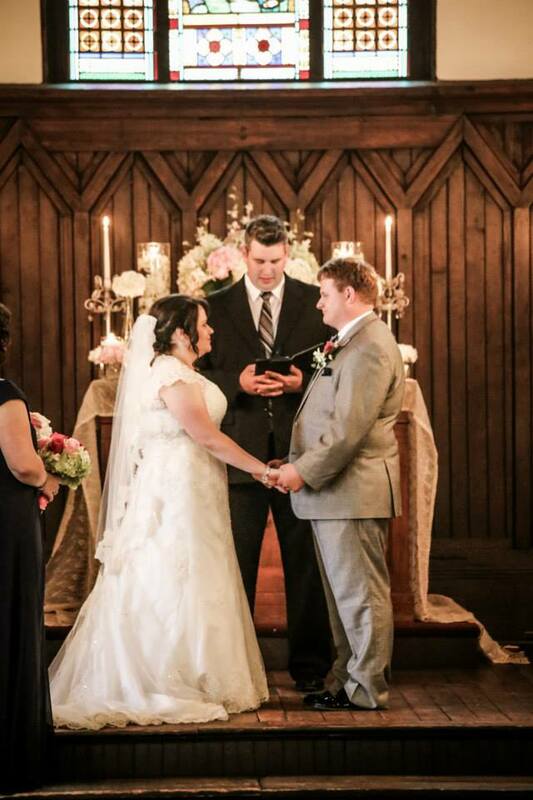 Mr and Mrs Orlando and Casey!! 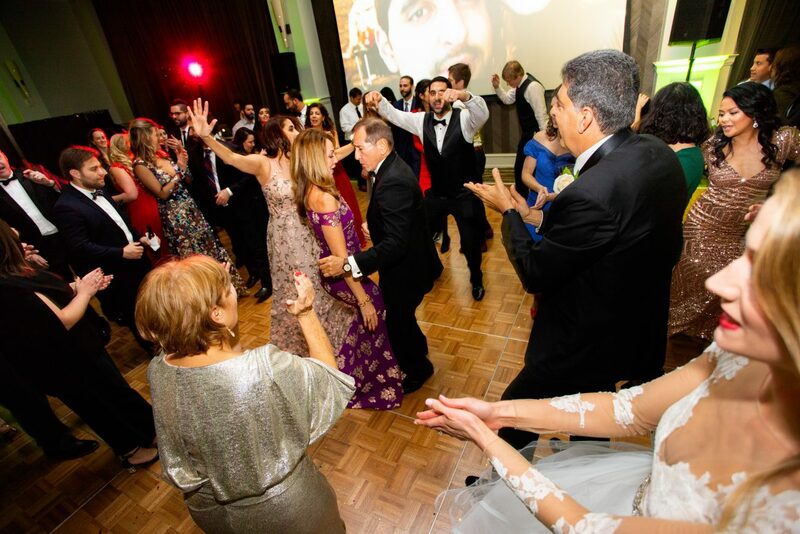 8:30 – La Hora Loca time! 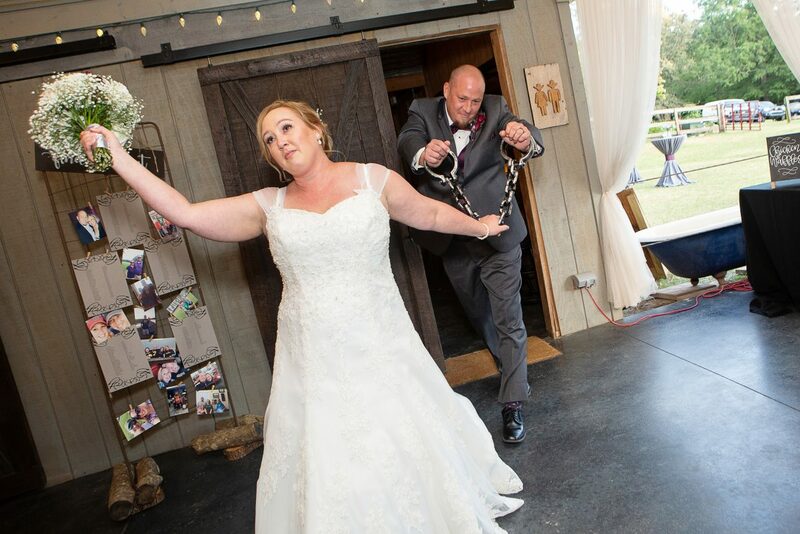 Admission time! Emily & Mike are two of our very best friends and we are so incredibly lucky to share our passion on their wedding day. 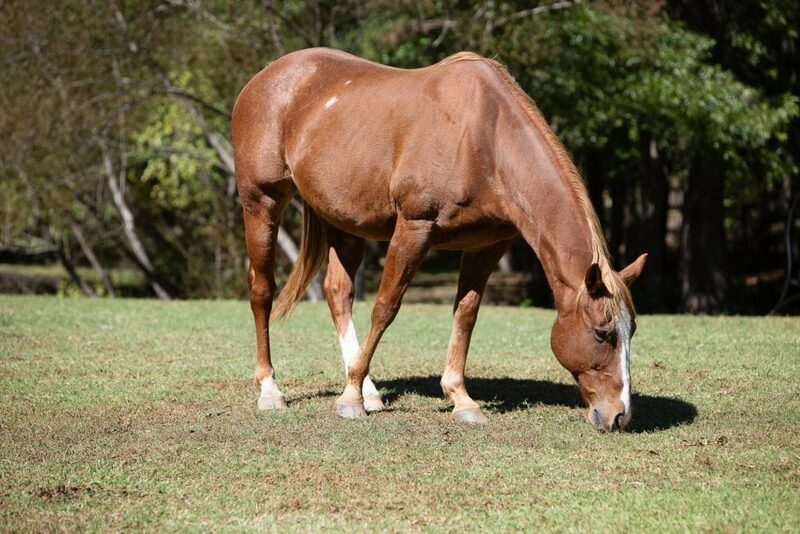 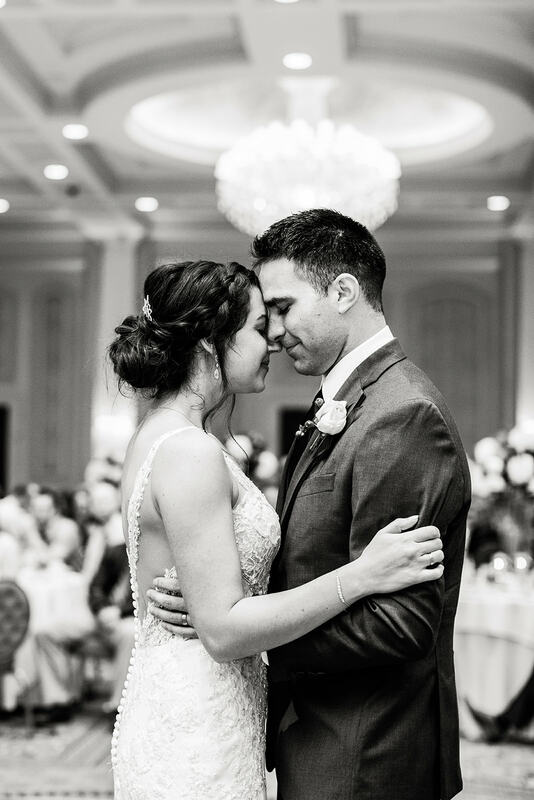 Enjoy the photos below from Becca’s Pics who gets a huge shoutout from us for being great to work with and for the beautiful photos of our friends. 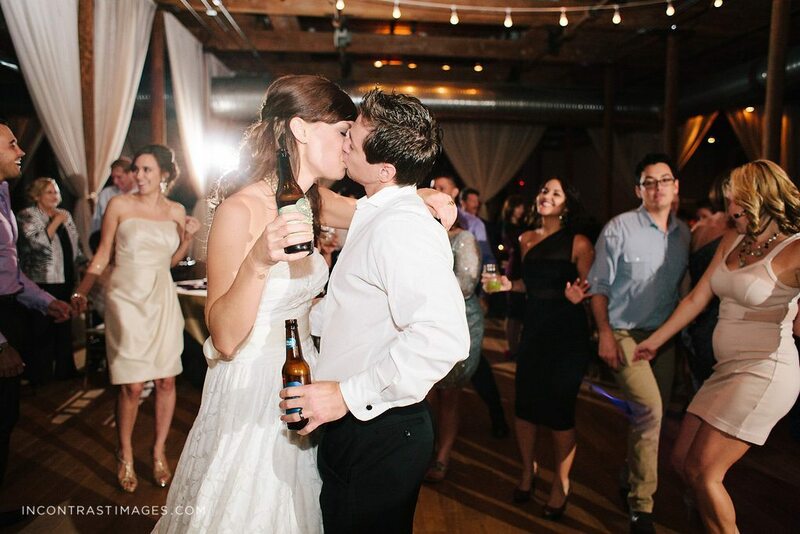 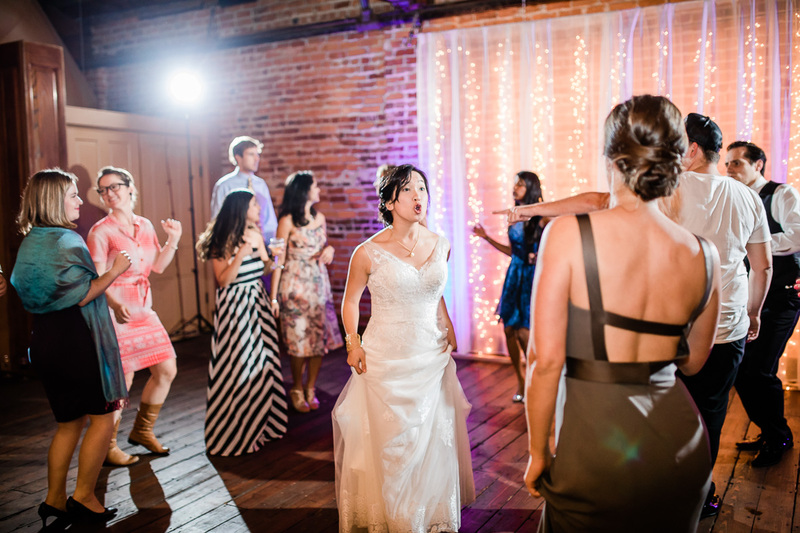 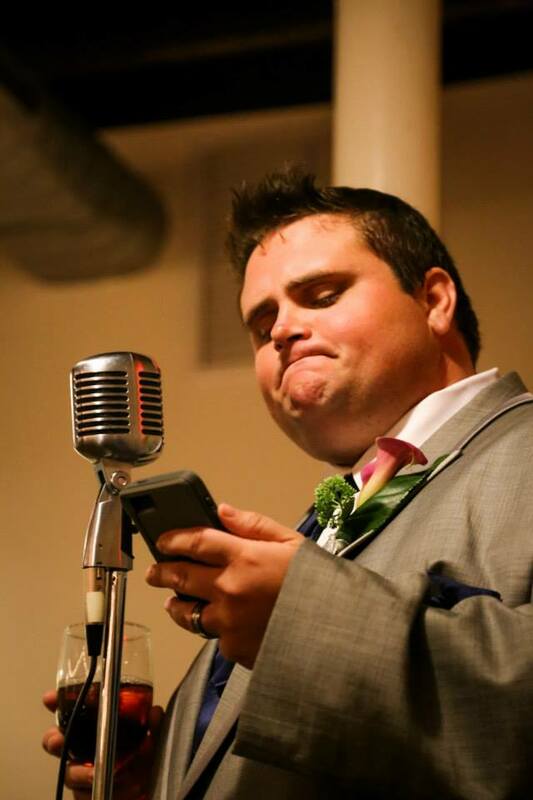 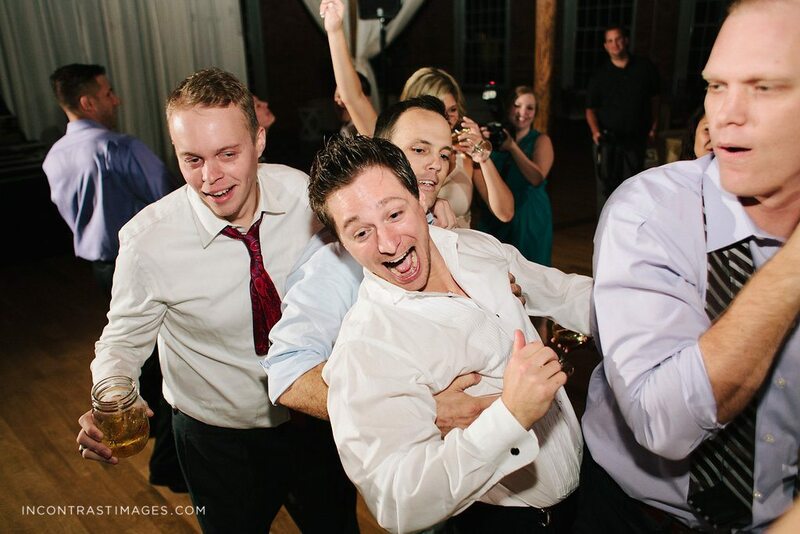 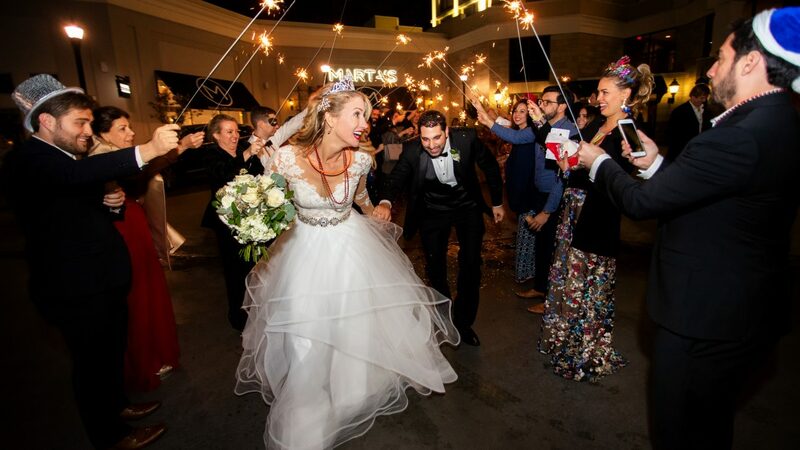 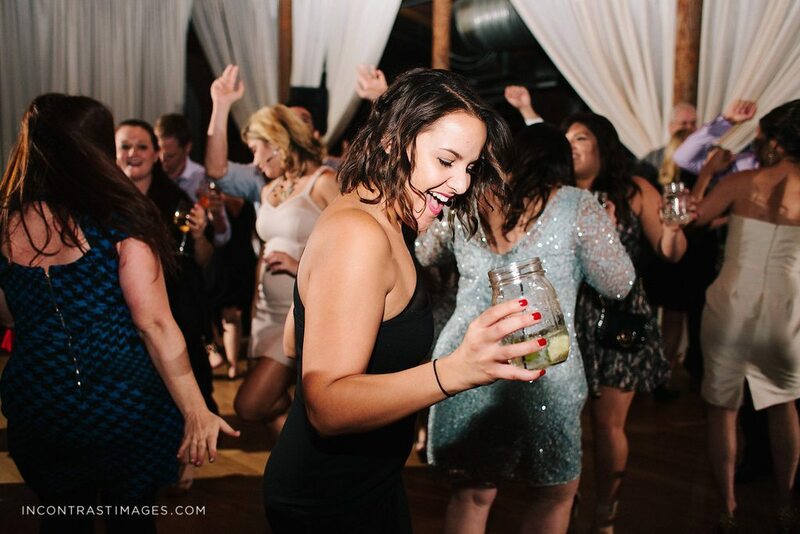 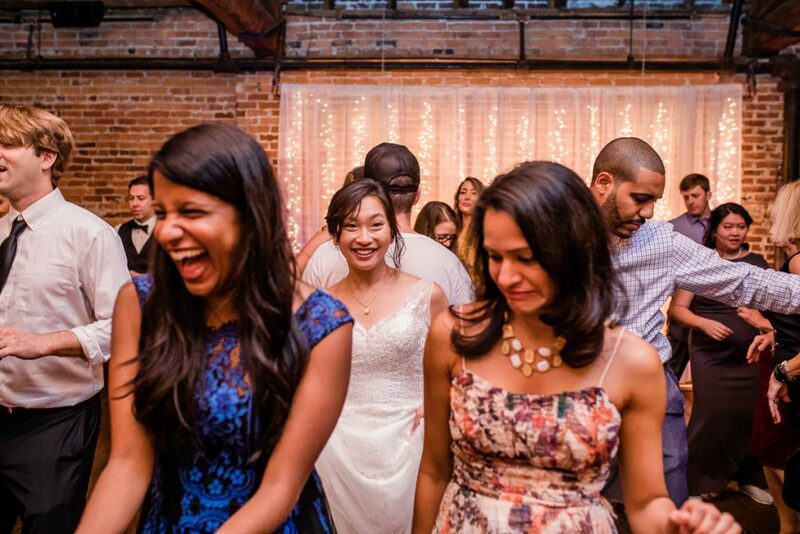 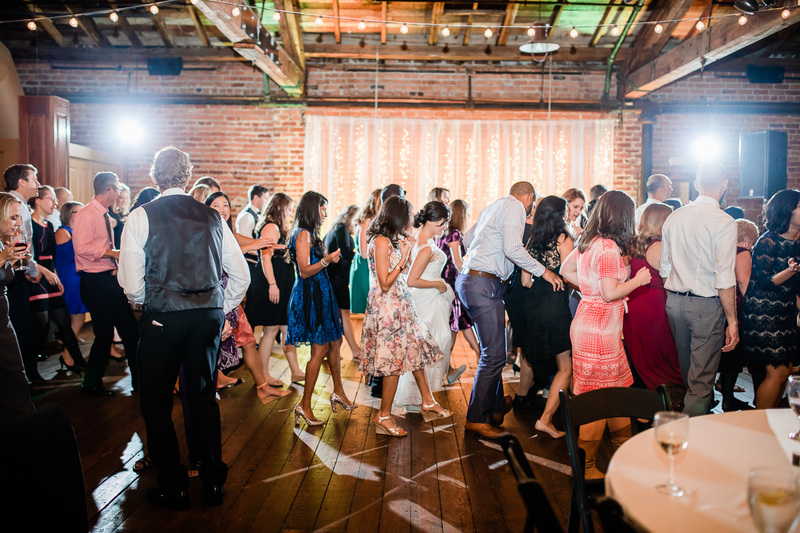 Emily & Mike’s wedding was … really … fun! 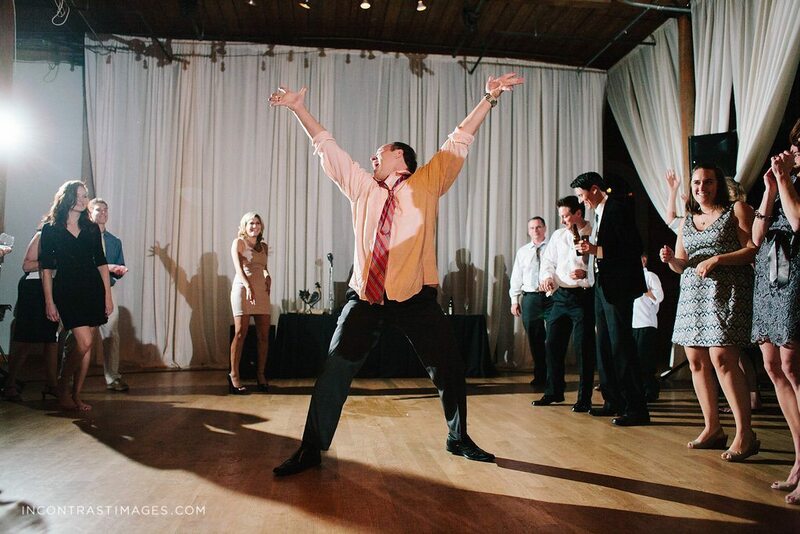 Mike’s big moment came during the grand entrance where the bridal and the newlyweds came in 90s Chicago Bulls style. 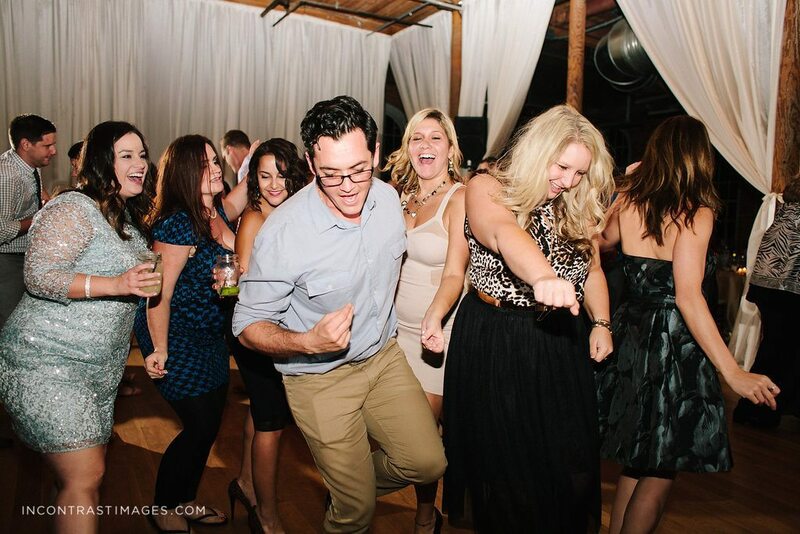 We brought the energy up for the entrance and it stayed upbeat all night. 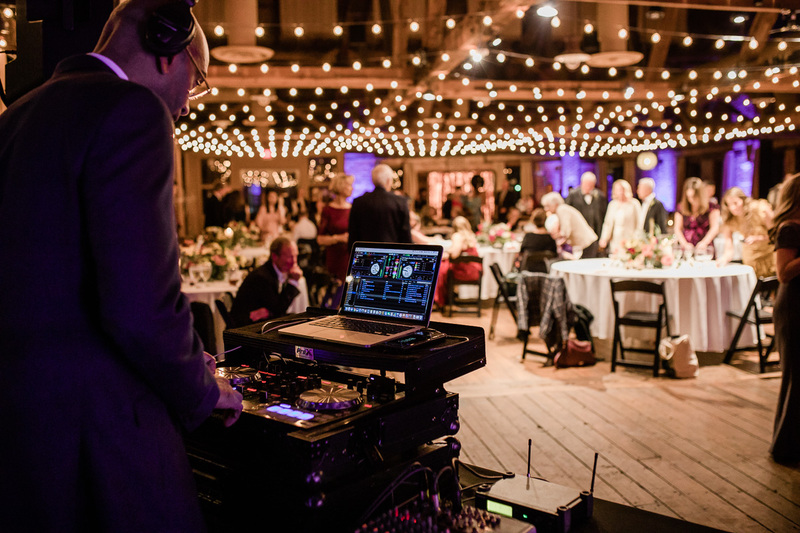 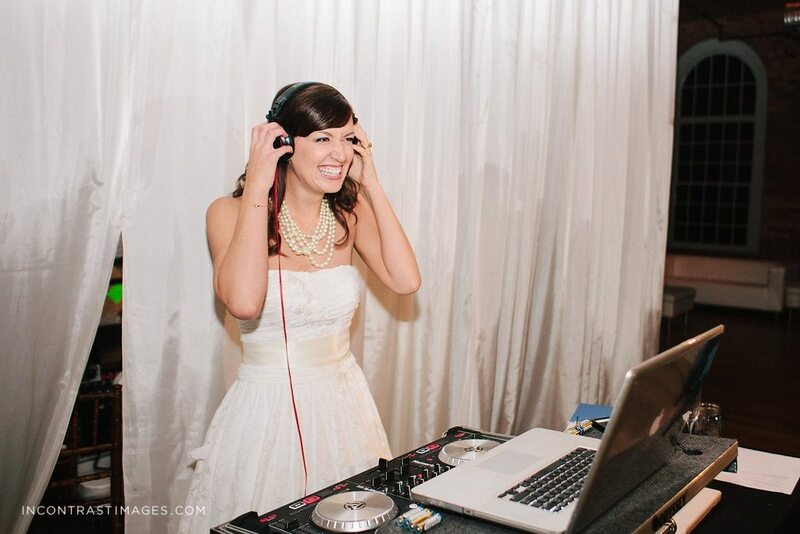 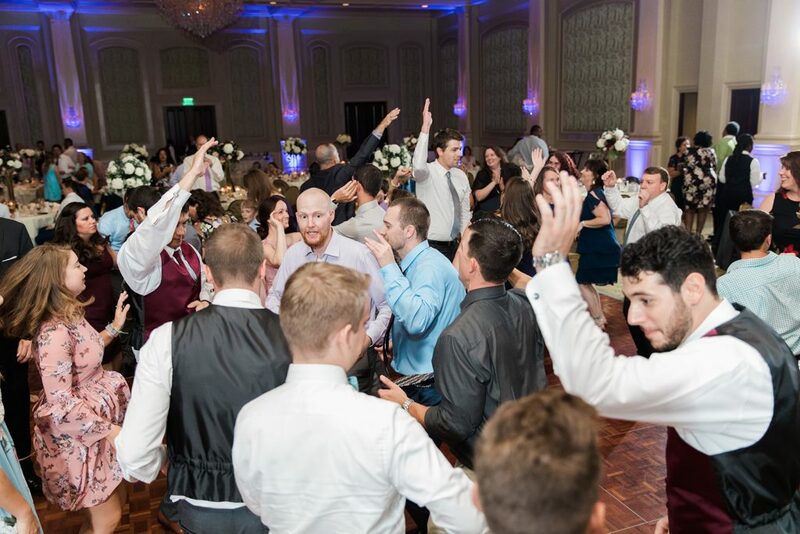 After a few nice toasts and family dances, DJ Brian took over and rocked their wedding reception for hours! 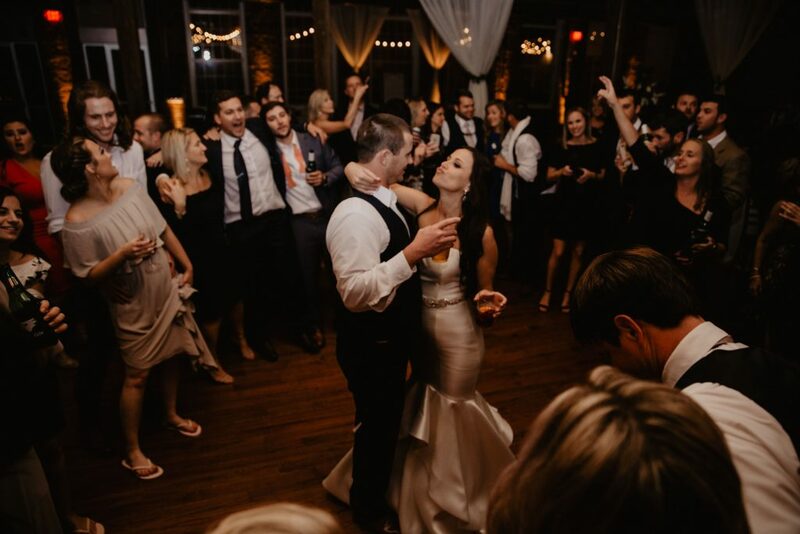 To many more years of friendship and congrats to Emily & Mike! 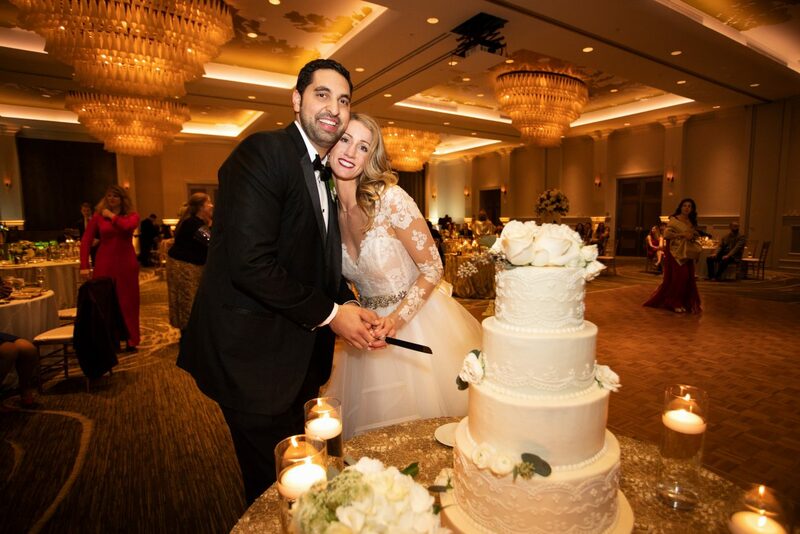 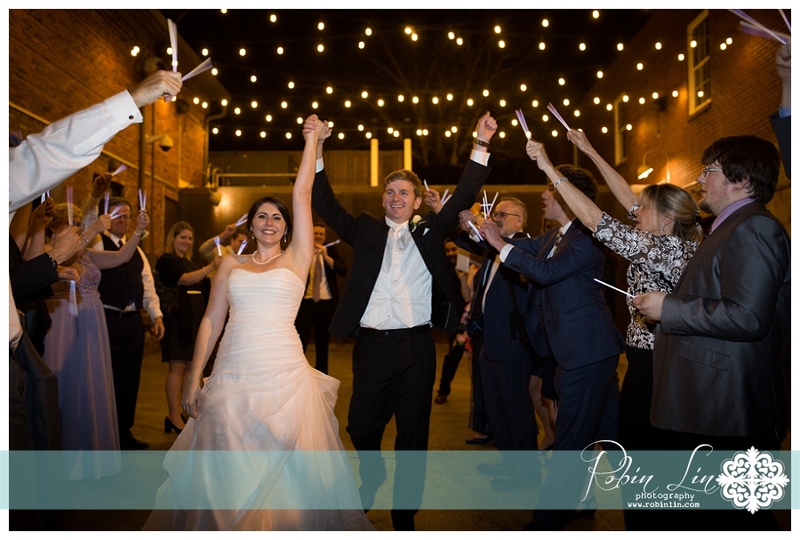 Chris & Evi were married and had their wedding reception at Prestonwood Country Club in Cary, NC and it was A LOT OF FUN! 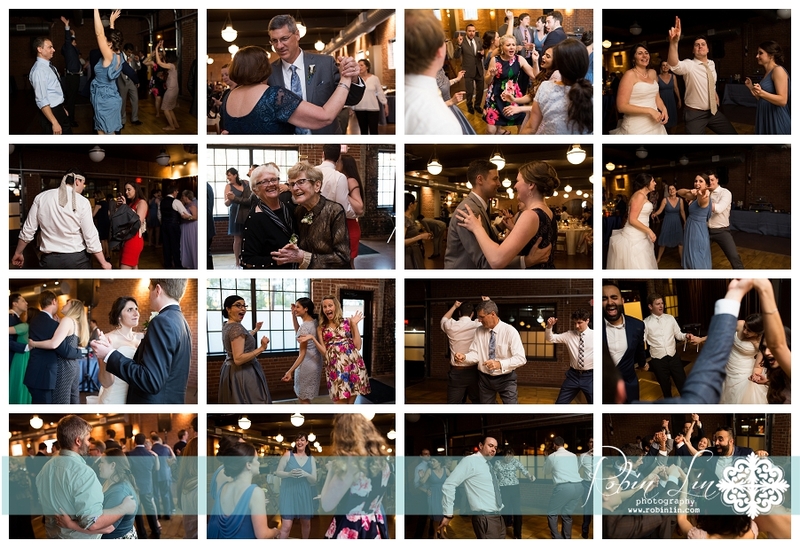 Check out the great shots from Bowtie Collaborative below as well as Evi & Chris’s review of our service, their other wonderful vendors and their timeline. 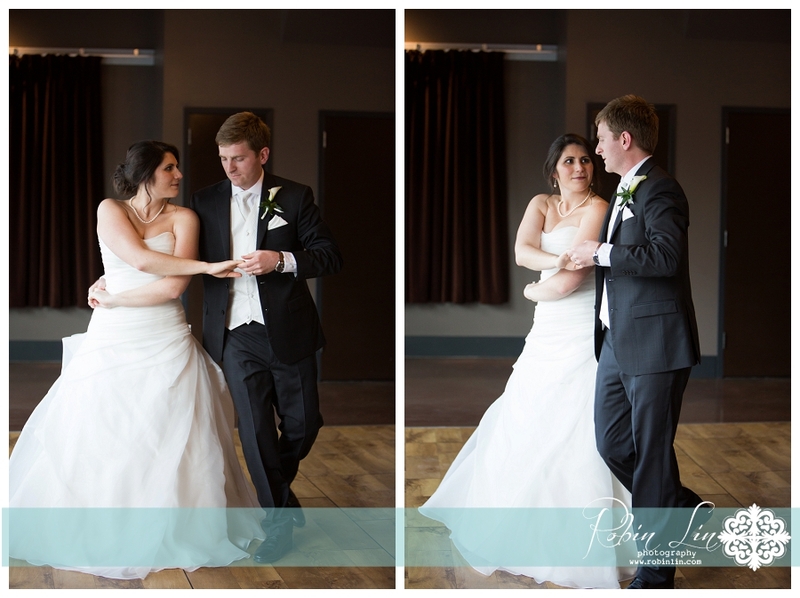 We had such a fun time working with and getting to know these two. 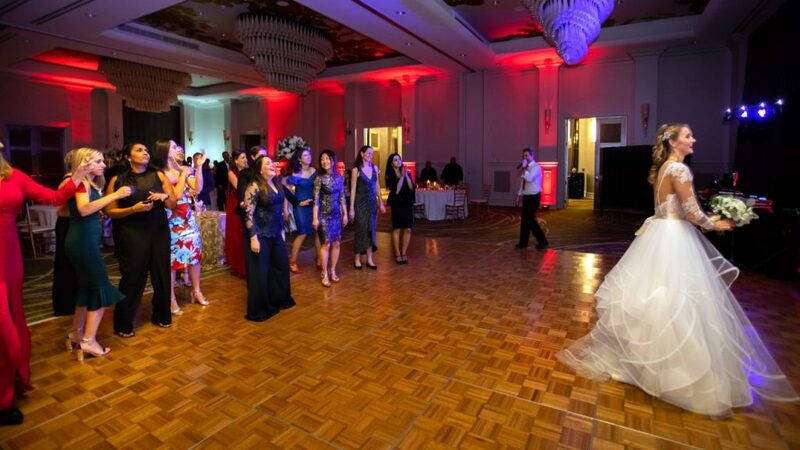 We provided them with our uplighting, dance floor lighting, photo booth and ceremony service. 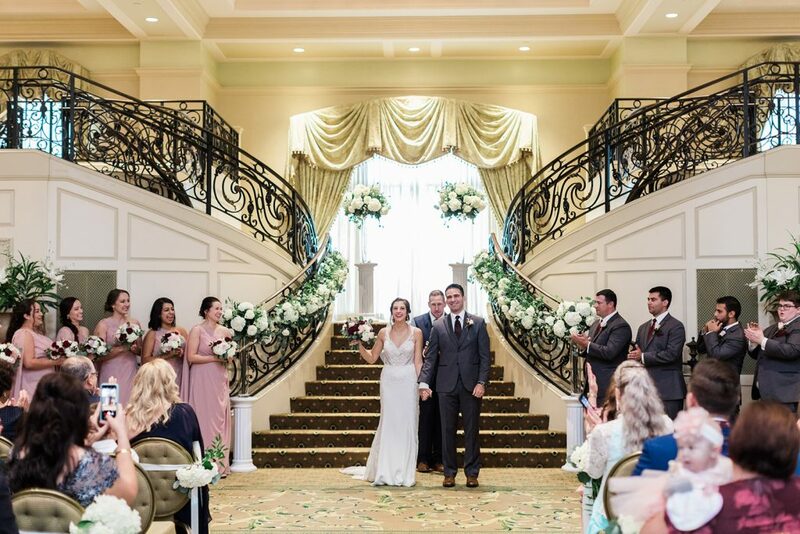 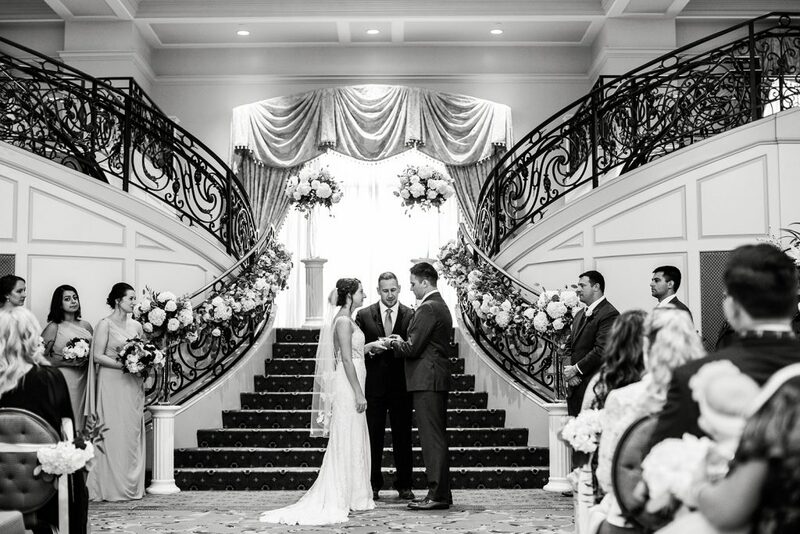 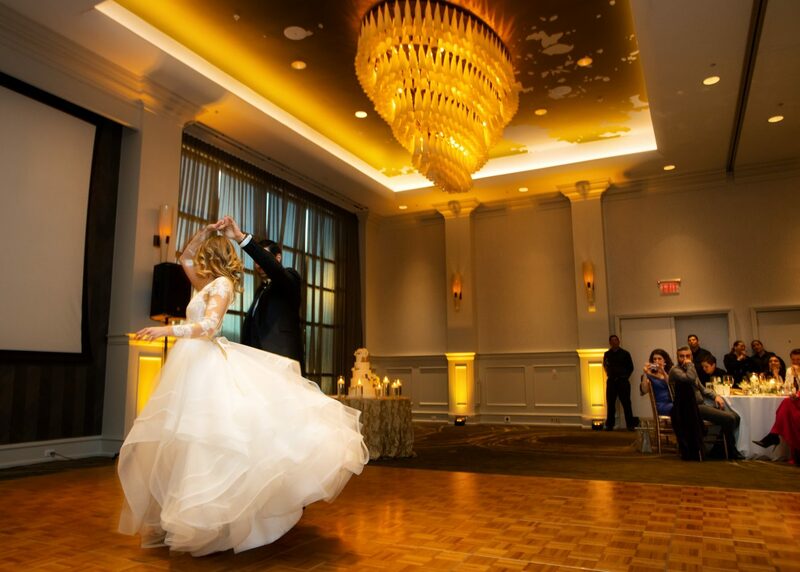 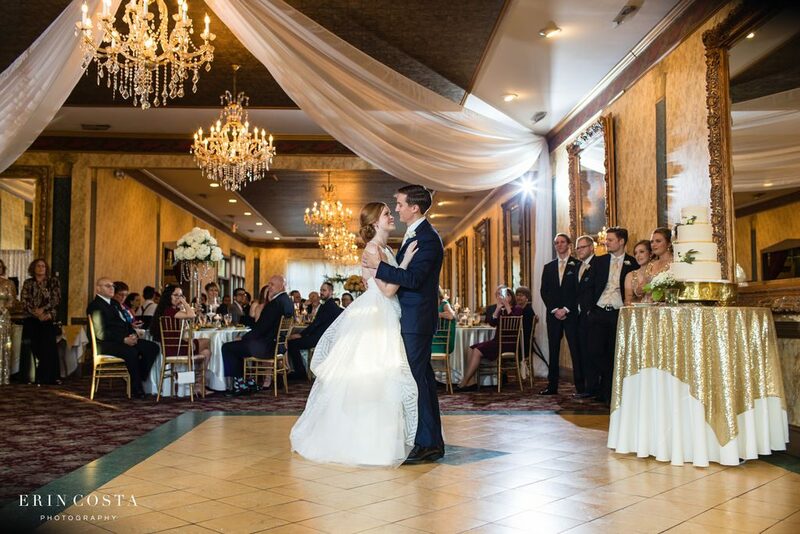 You can see how good the lighting looked in the beautiful ballroom at Prestonwood. 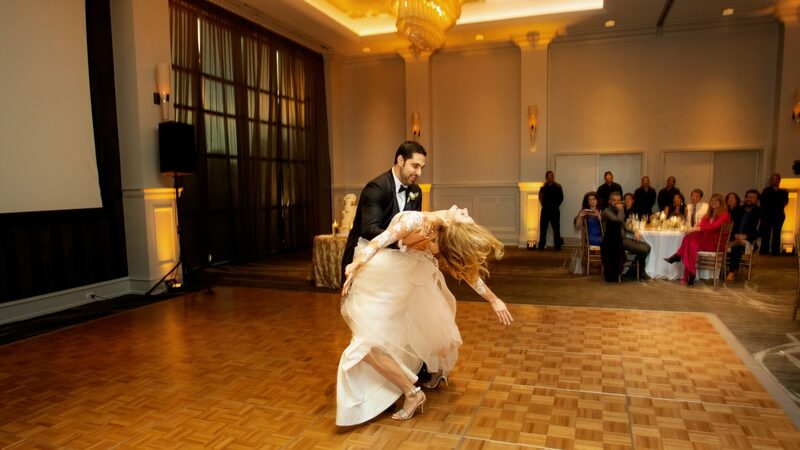 We kept it a classy candlelight color through dinner and then once dancing started we made it change to the beat of the music and added set up the dance floor lighting too. 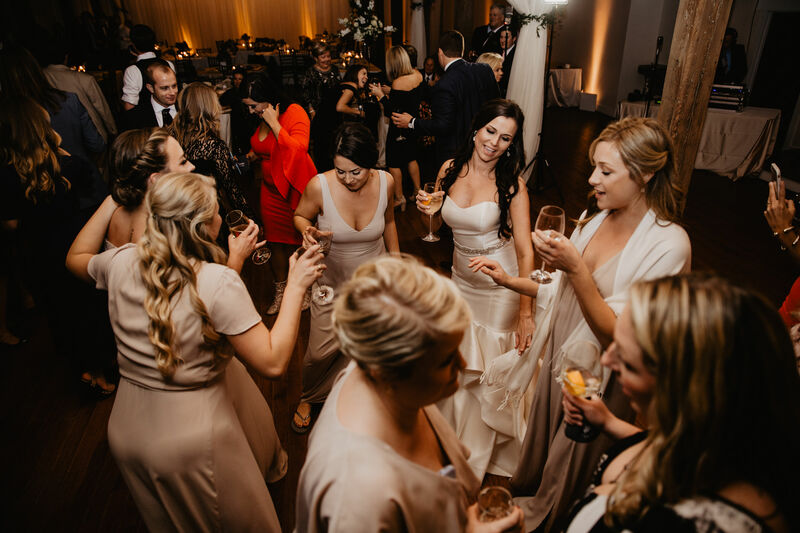 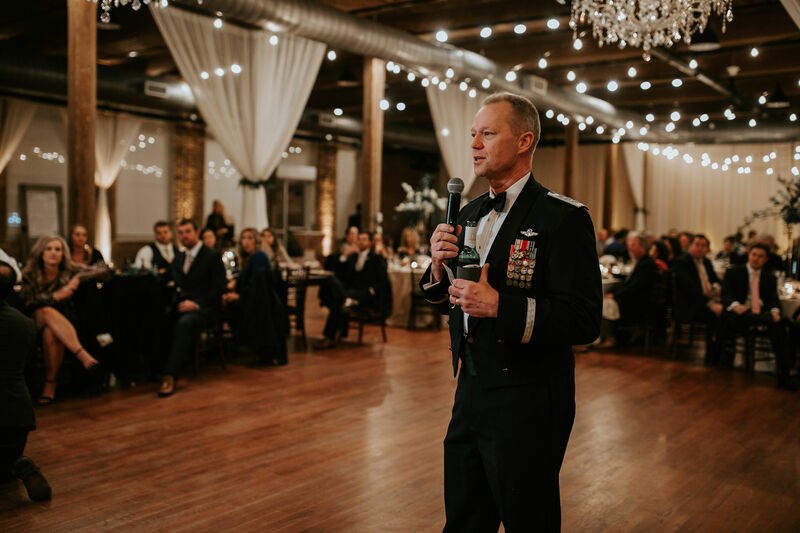 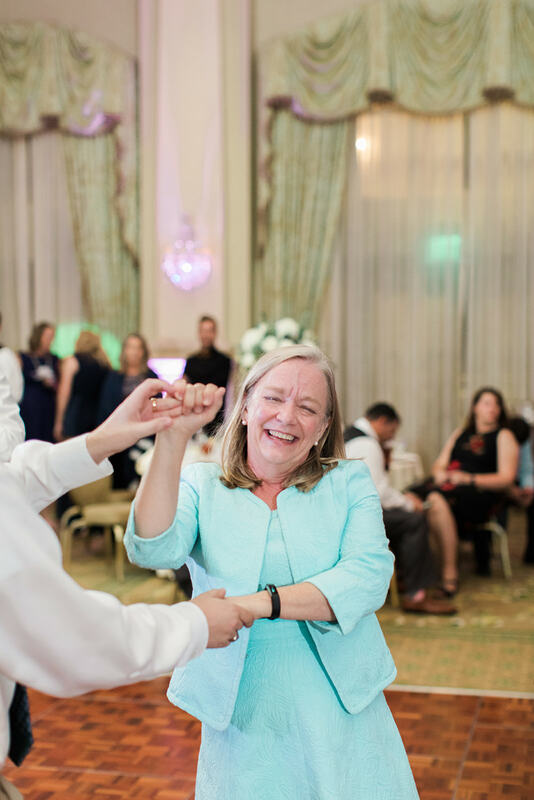 This was truly one of the most fun and smoothest weddings ever thanks to the hard work of Kathy with Sally Oakley Events. Having a pro like Kathy running the wedding always means it will be more fun because everything runs better! 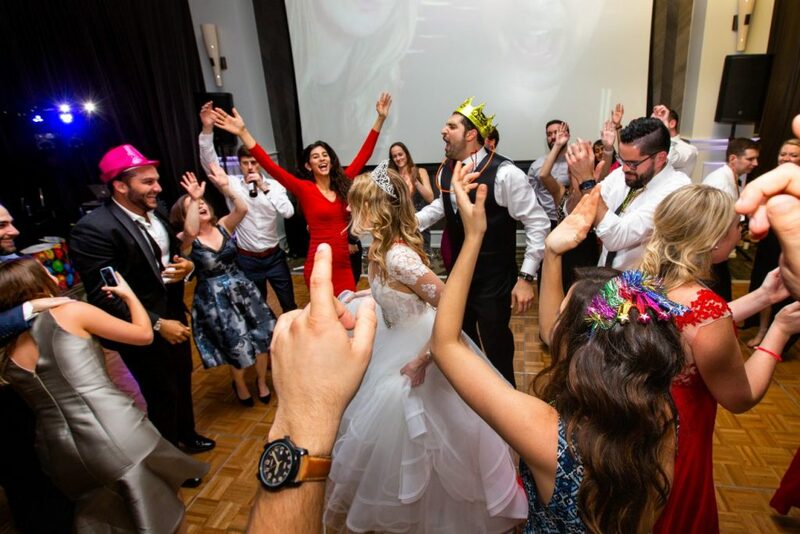 It was really an amazing wedding filled with beauty, fun and celebrating not too much some fun Greek music to celebrate Evi’s culture. 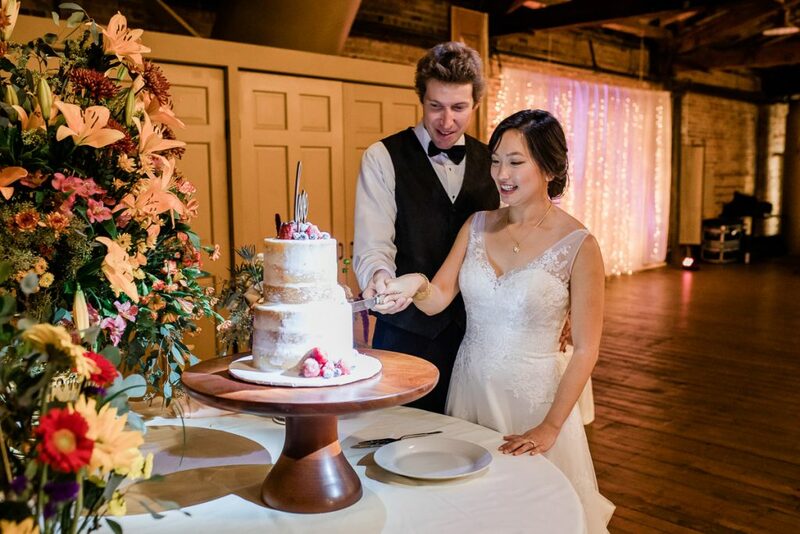 Thanks for letting us celebrate with you and best wishes! 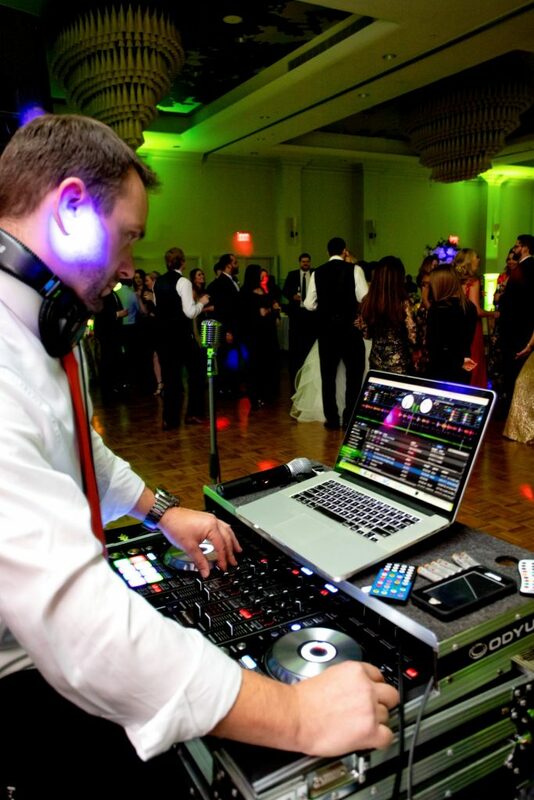 “5.0/5.0 Great experience and music all around! 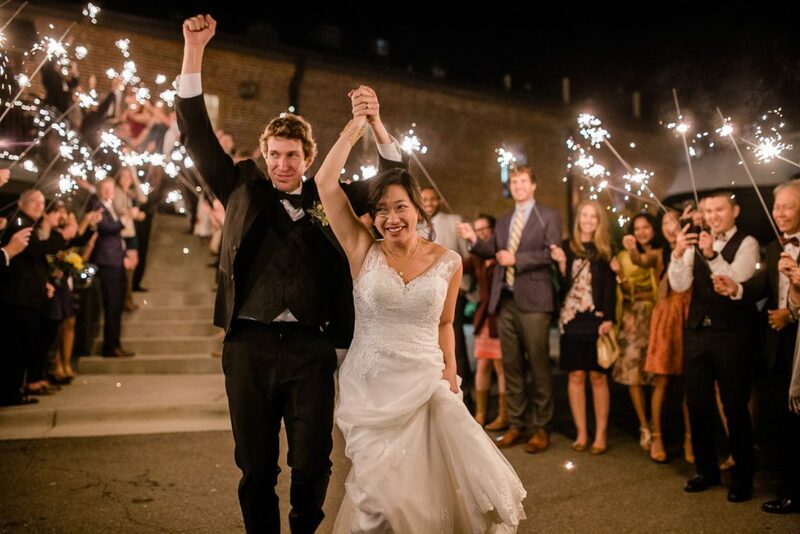 Mr & Mrs Chris & Evi!! 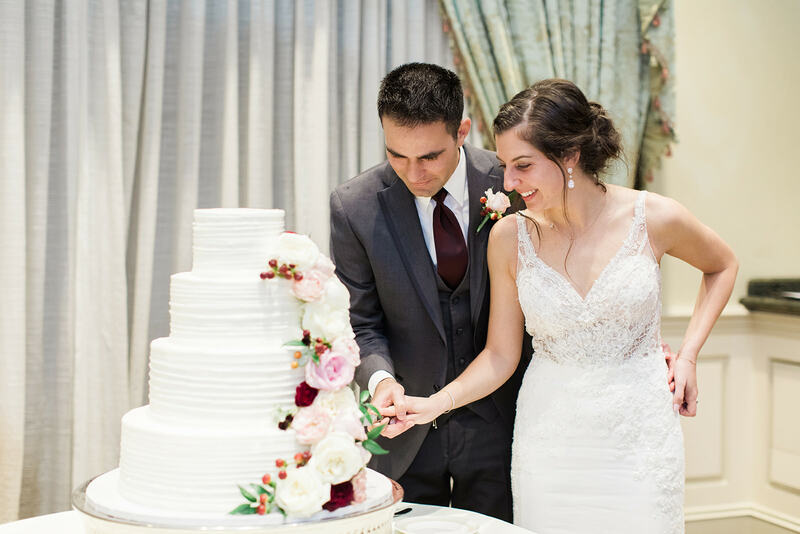 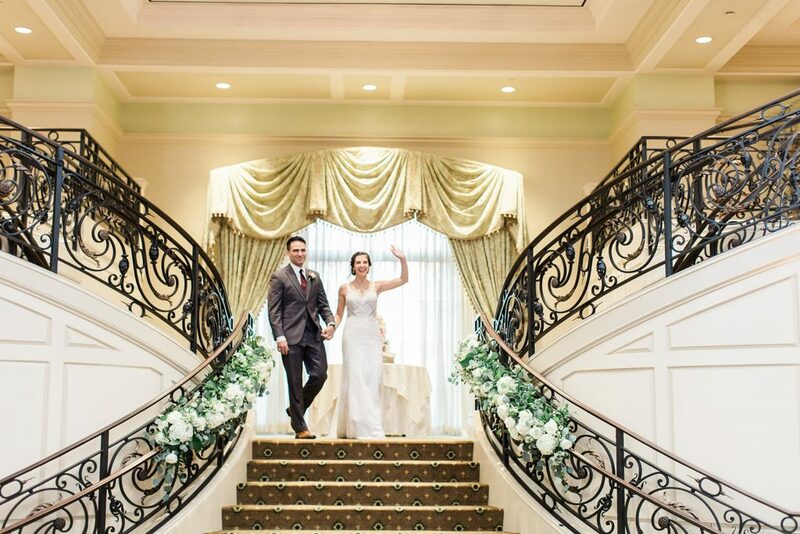 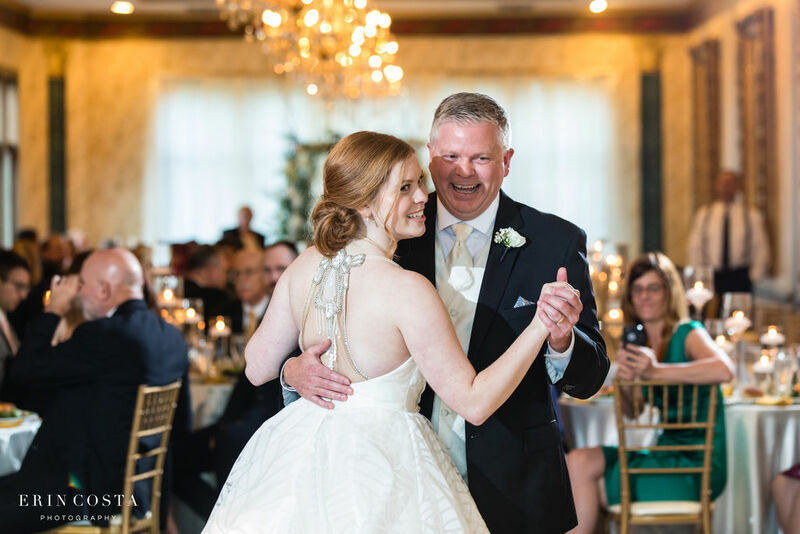 We first met Shannon & Patrick at a bridal show about 16 months before their wedding and got to know them really well leading up to their wedding day. 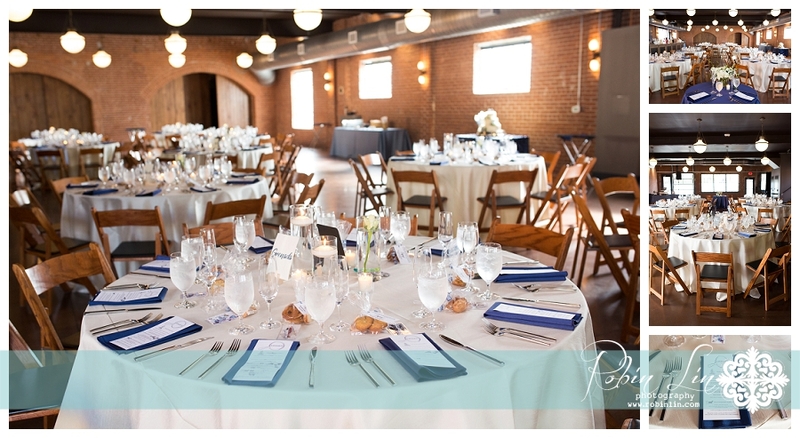 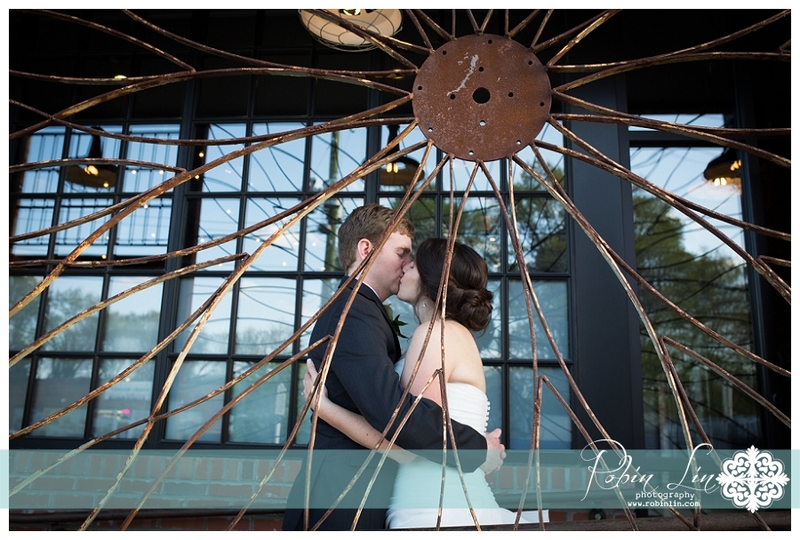 They absolutely loved the history and textures at their amazing wedding venue, The Cookery. 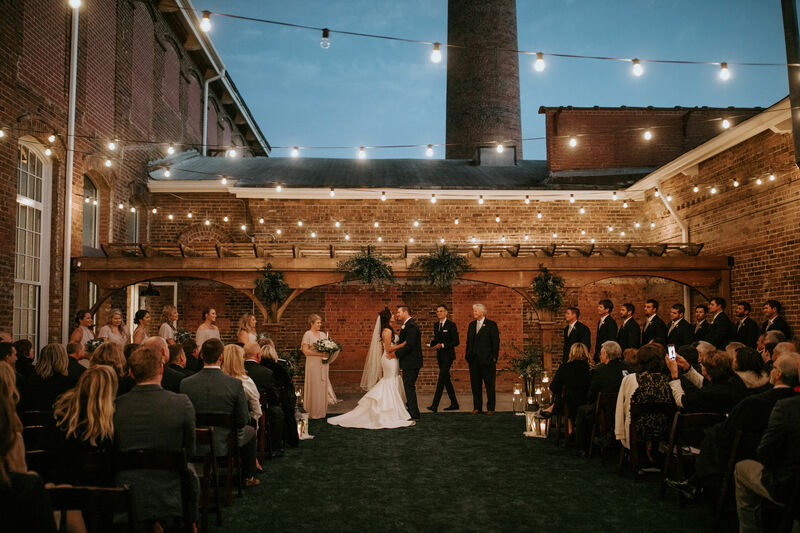 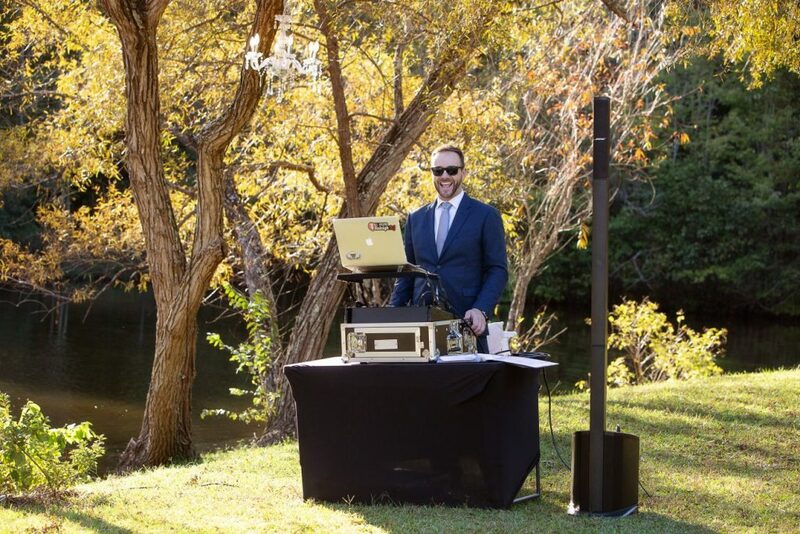 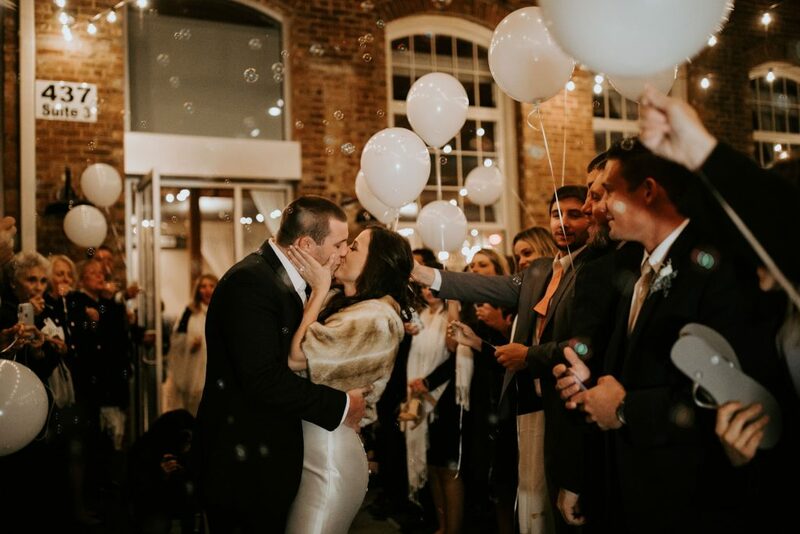 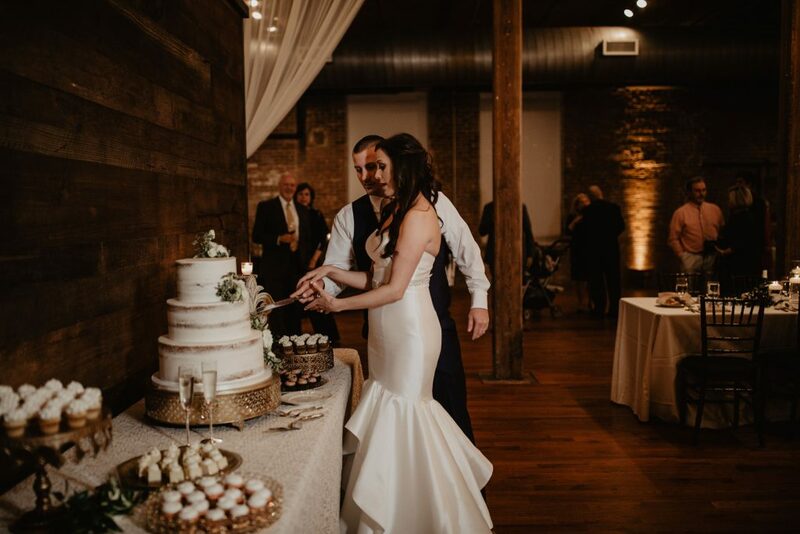 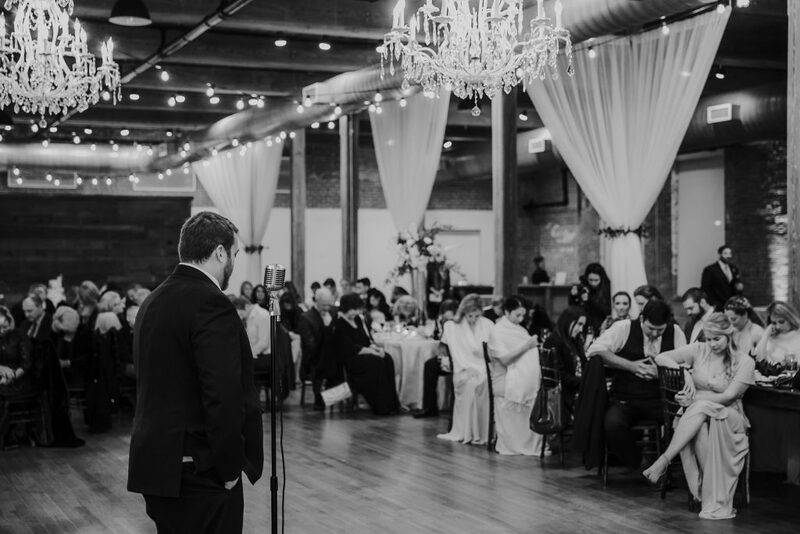 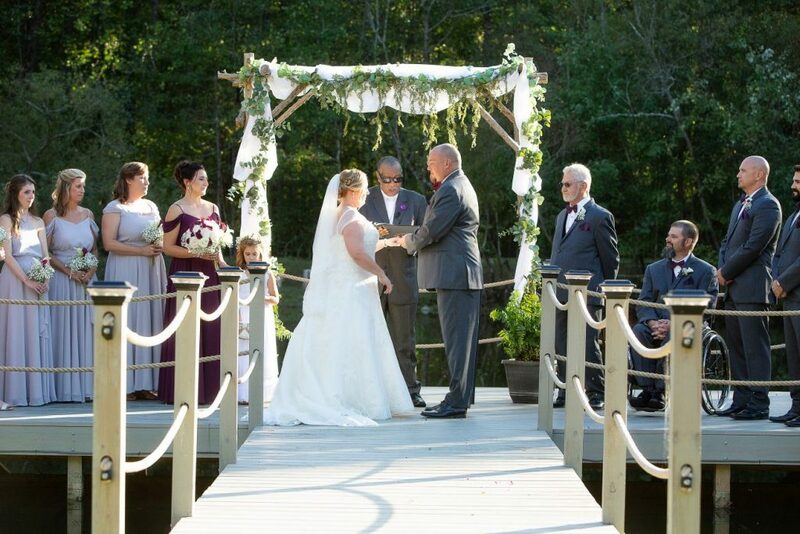 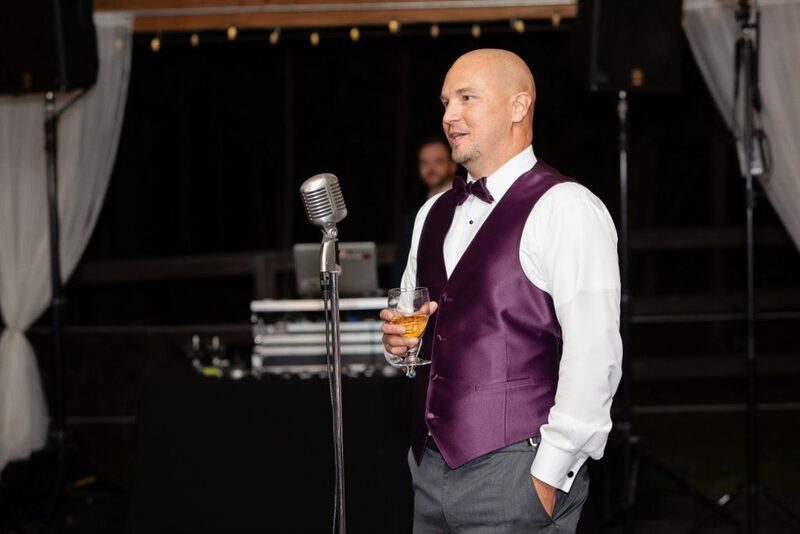 We got to provide audio for their ceremony in the courtyard then we fired up the main system for the reception while providing a wireless speaker in the courtyard and cocktail room. 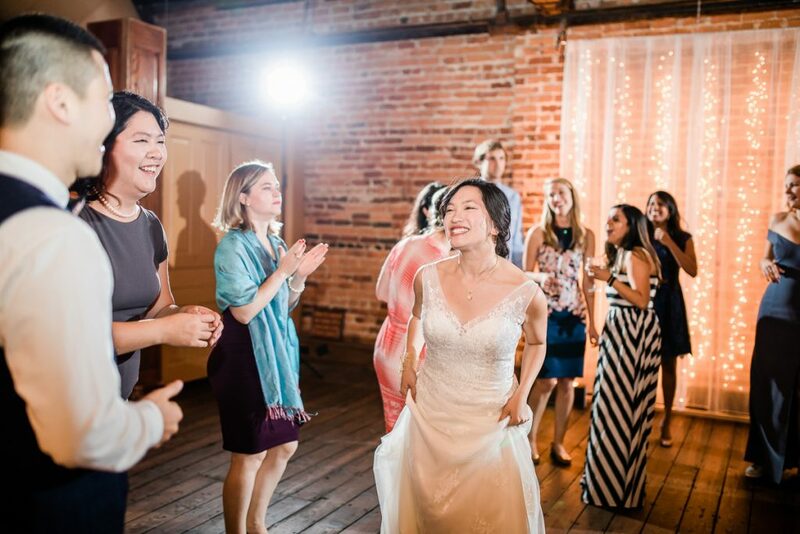 Check out Robin Lin Photography‘s great work in the photos below! 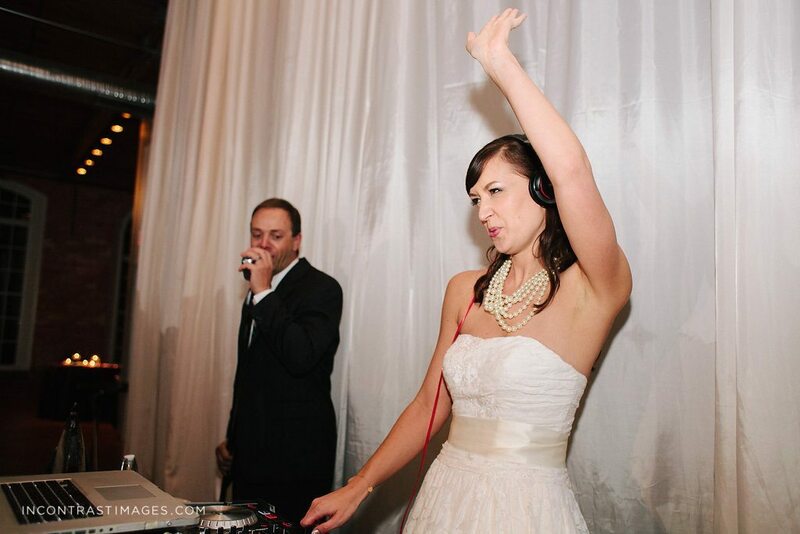 They instructed us to “do what we do” and make sure everyone has an amazing time but keep it clean and no hard rap. 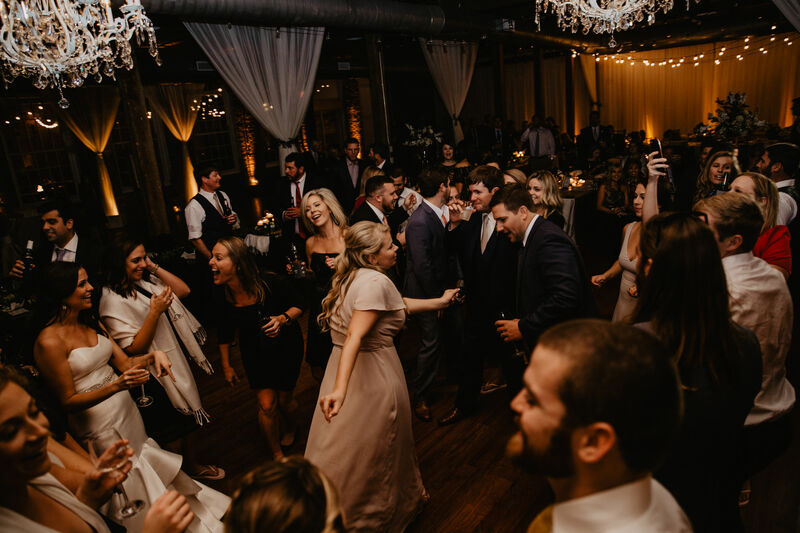 We introduced them to ‘Can’t Stop the Feeling’ by Justin Timberlake for the bridal party then ‘Happy’ by Pharrell for bride and groom. 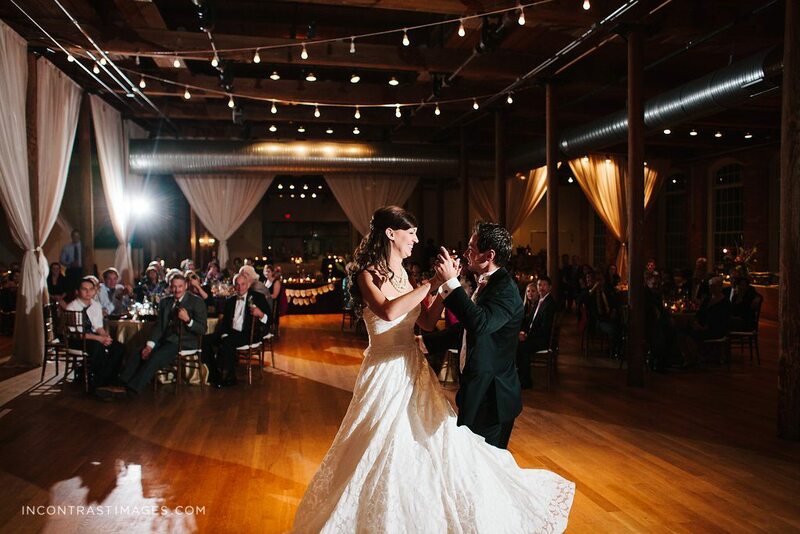 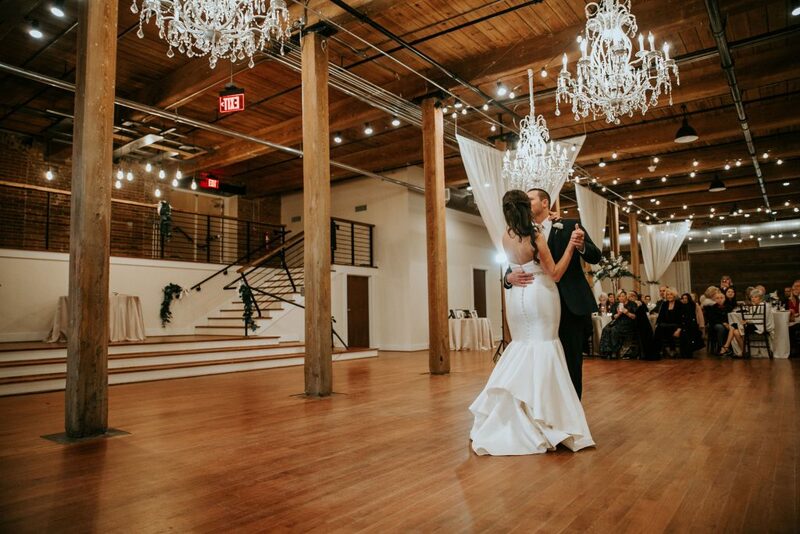 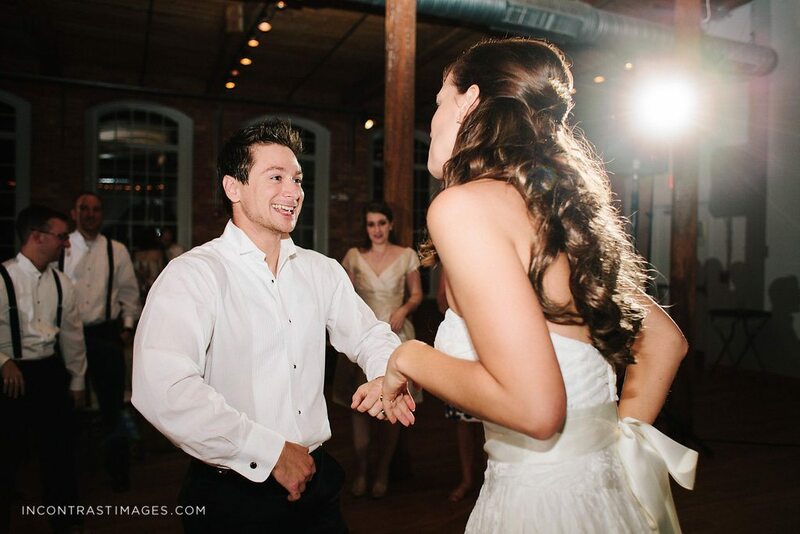 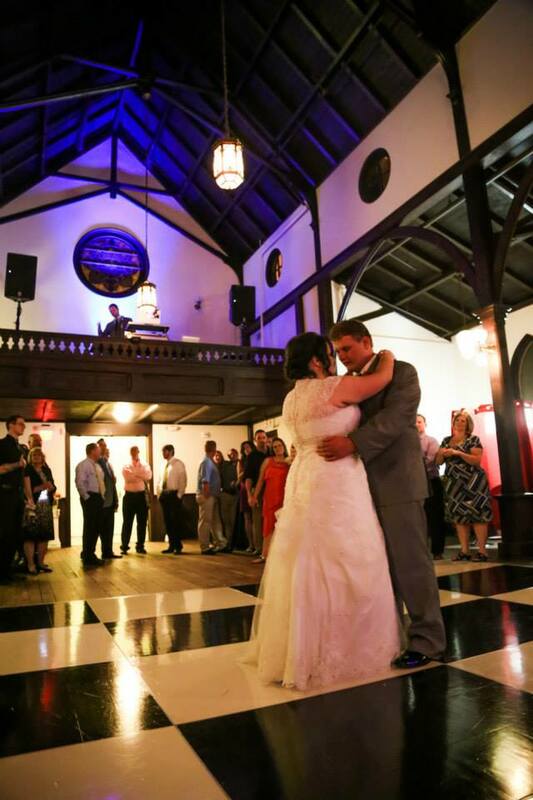 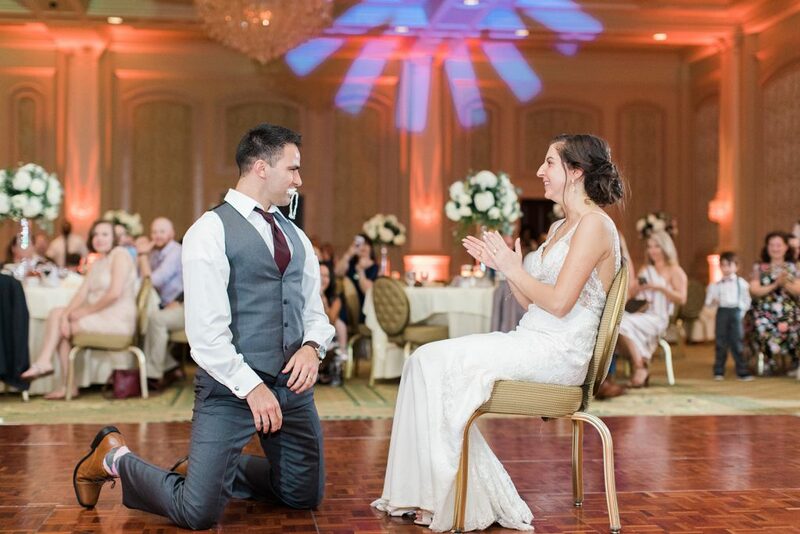 Shannon & Patrick then had their first dance to ‘Better Place’ by Rachel Platten. 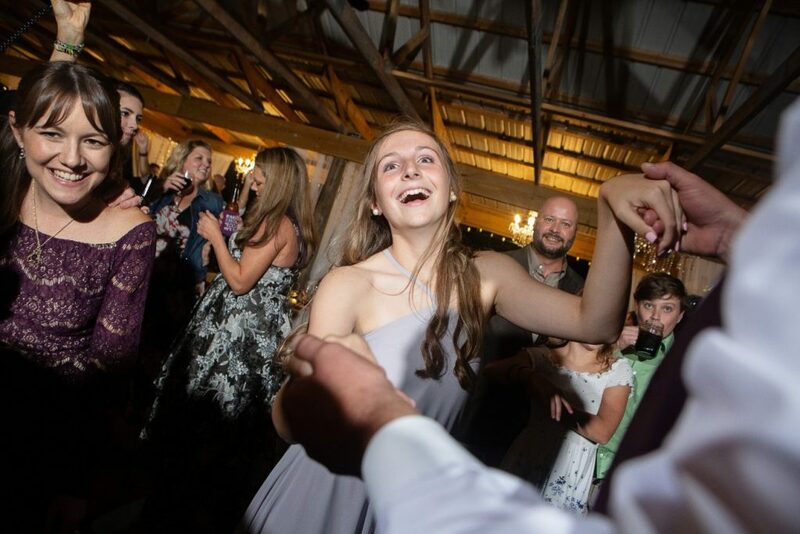 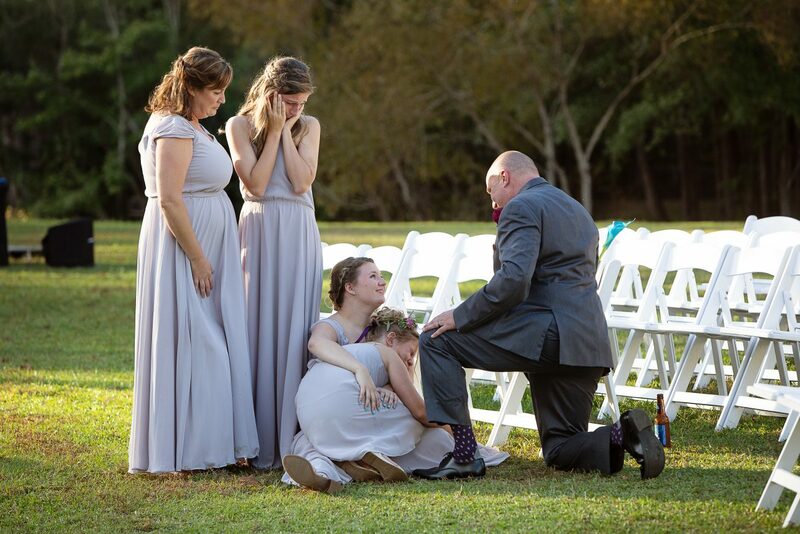 The Father/Daughter dance song was to ‘Daughters’ by John Mayer and the Mother/Son dance song was ‘Humble and Kind’ by Tim McGraw. 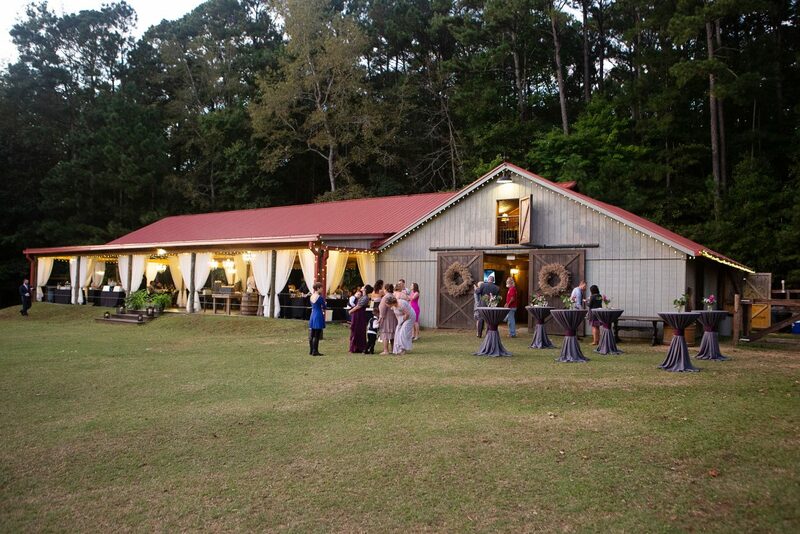 Dinner was amazing as always at The Cookery. After the toasts by the best man and the maid of honor we opened up the dance floor. 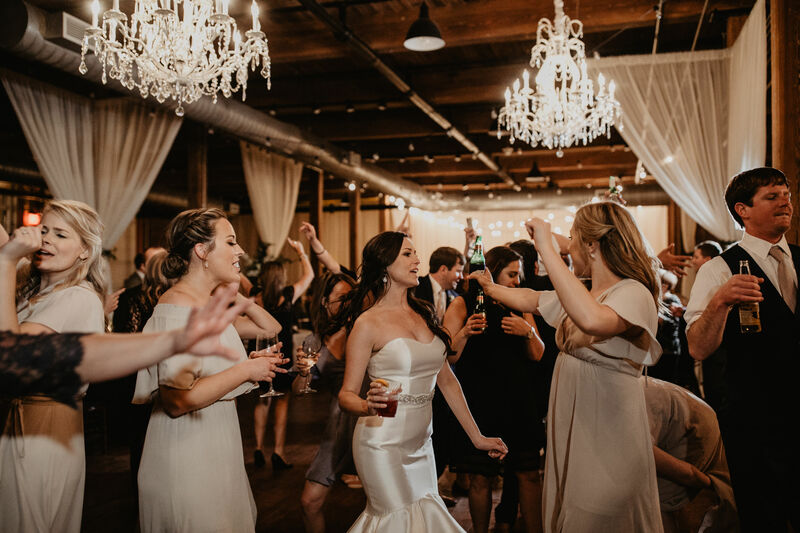 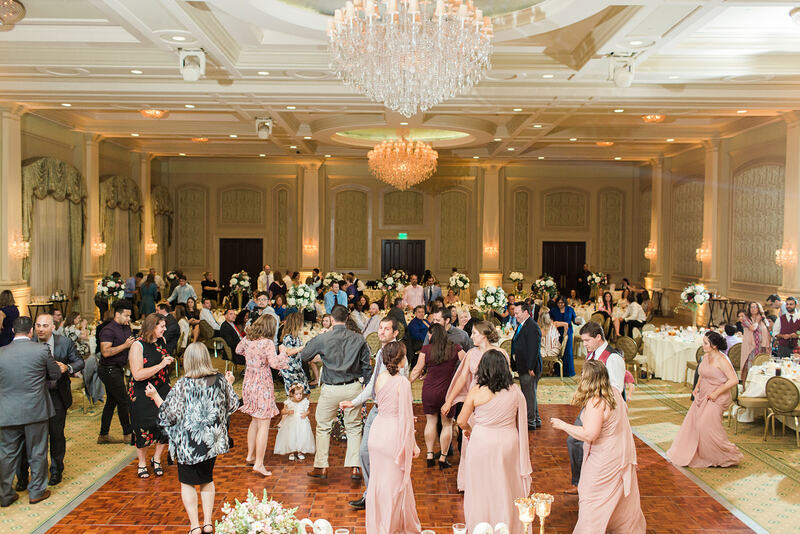 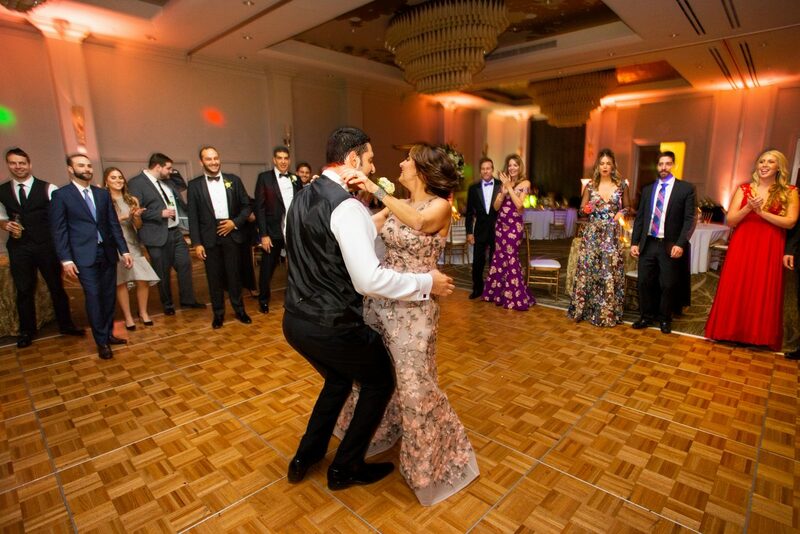 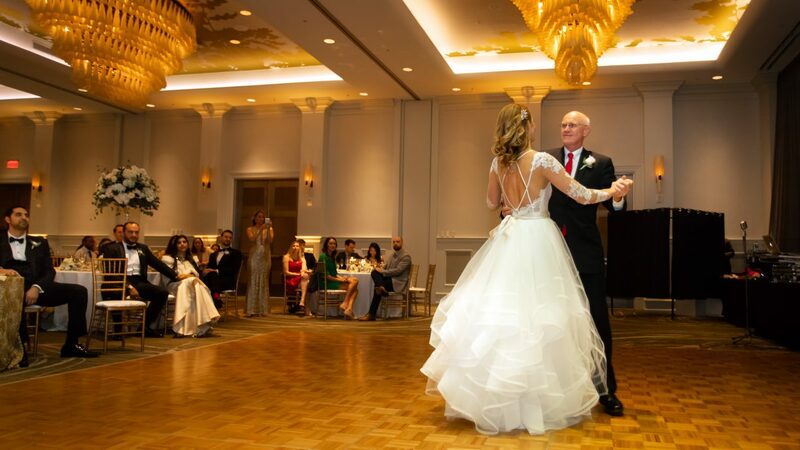 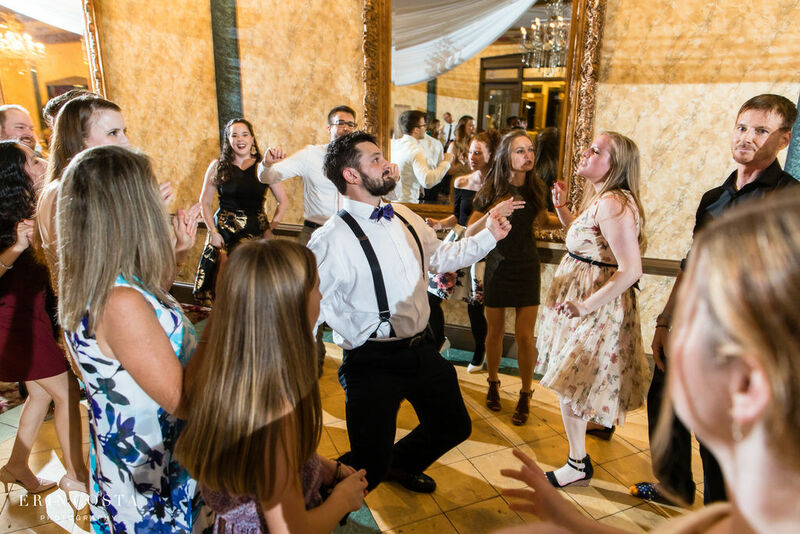 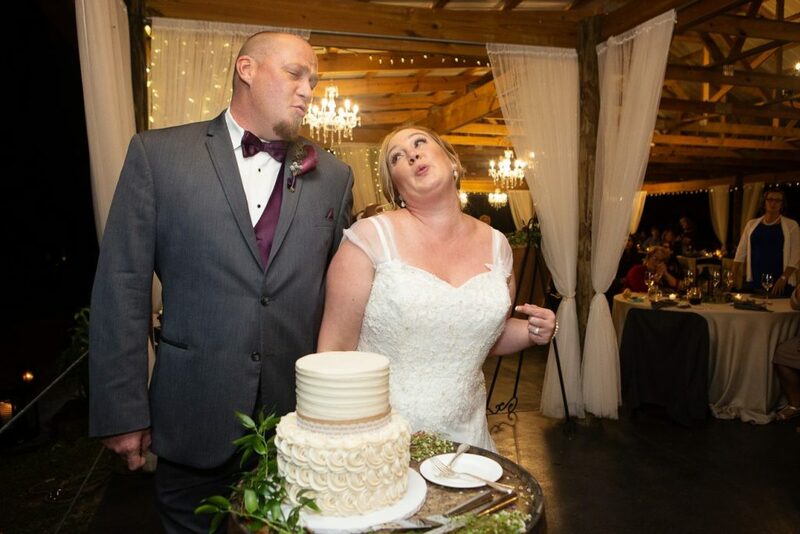 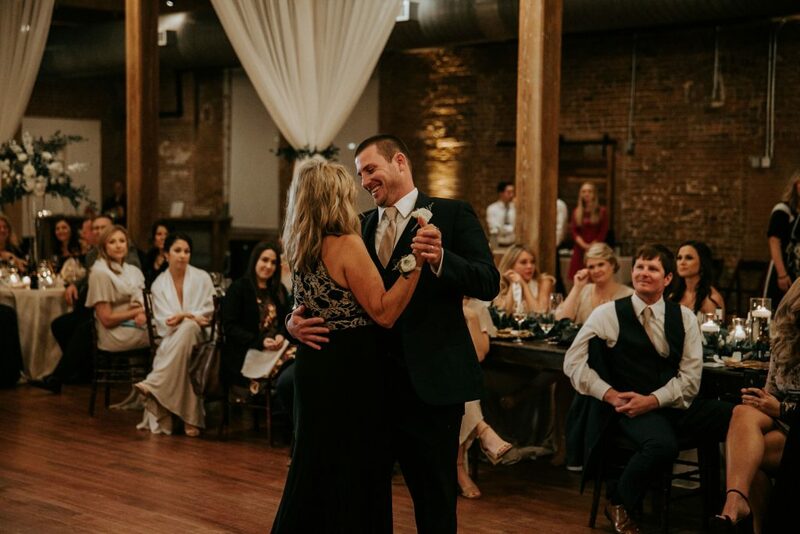 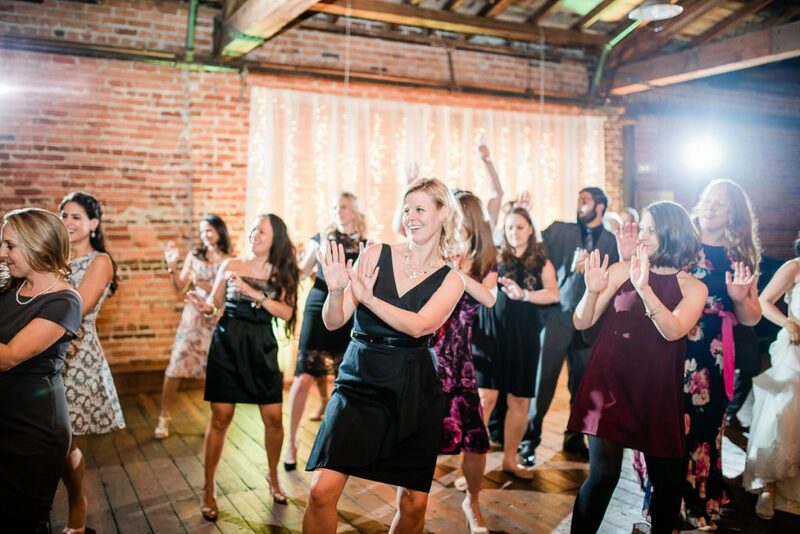 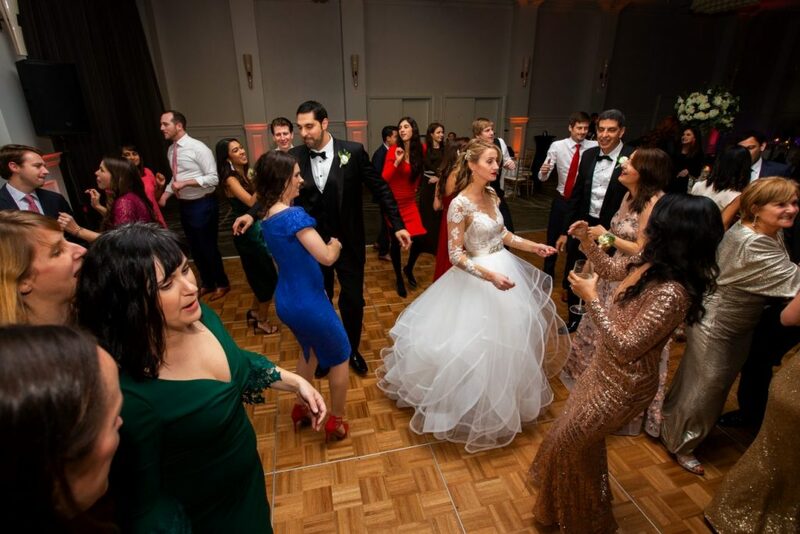 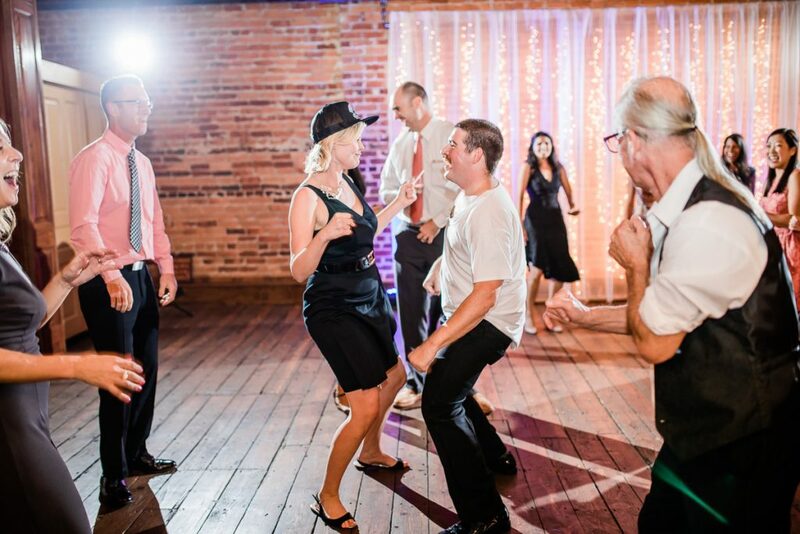 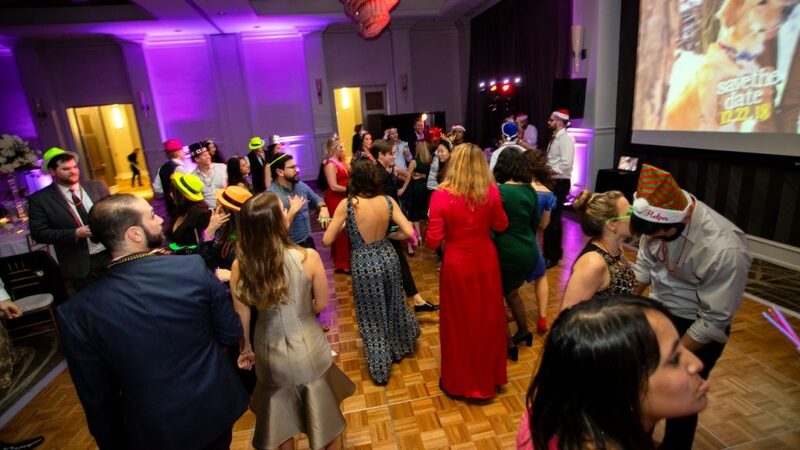 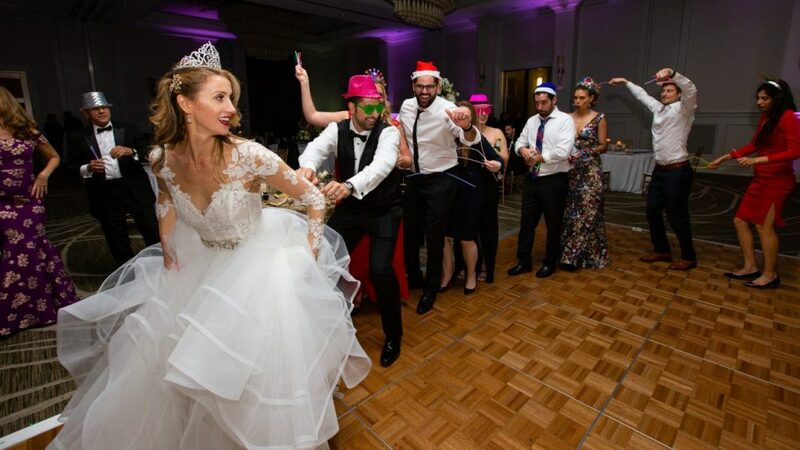 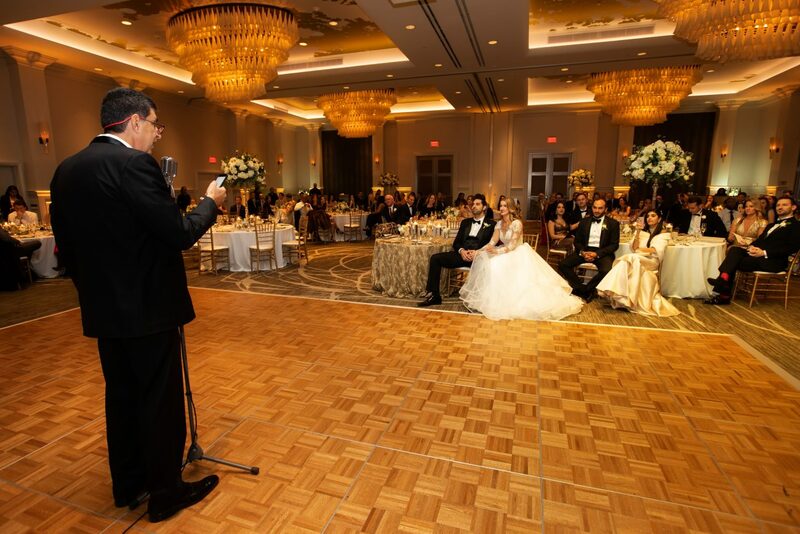 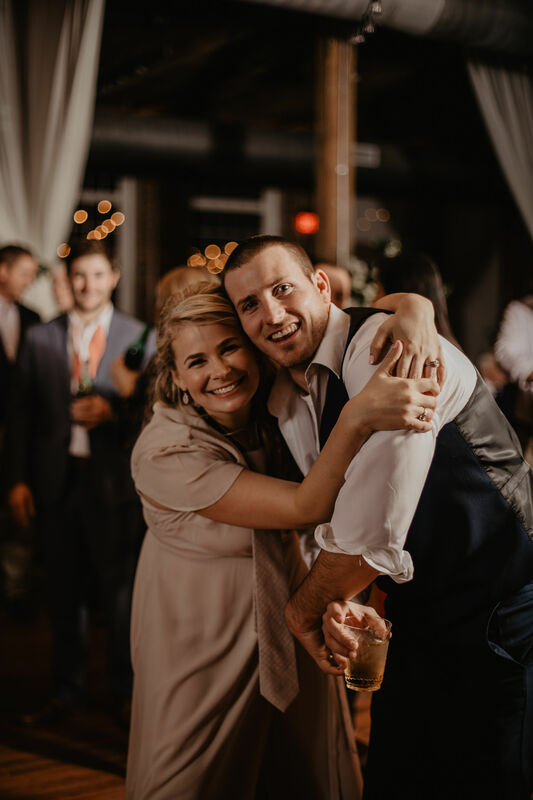 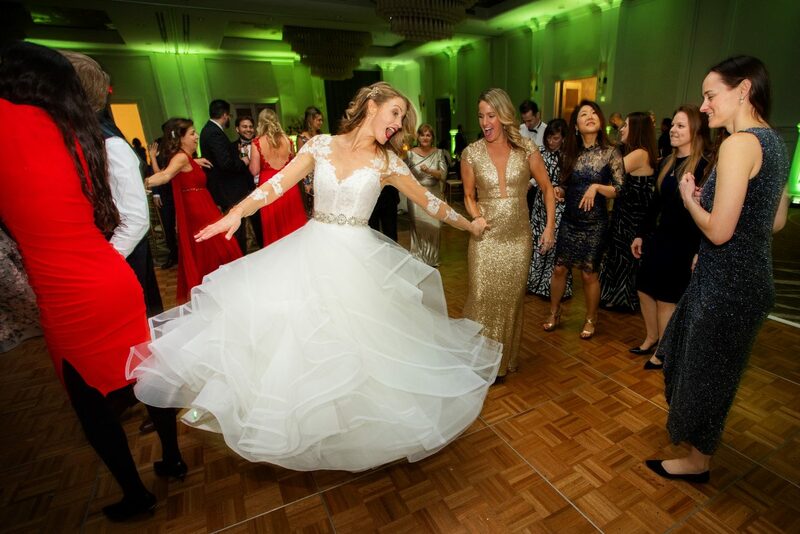 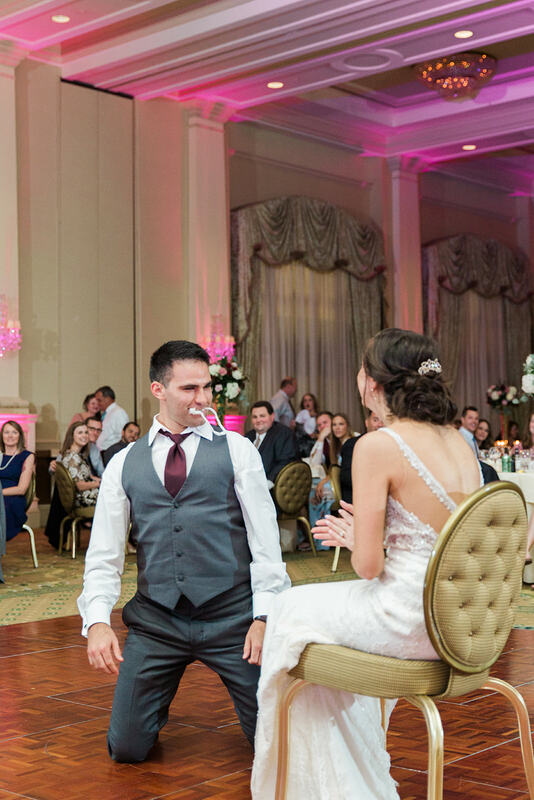 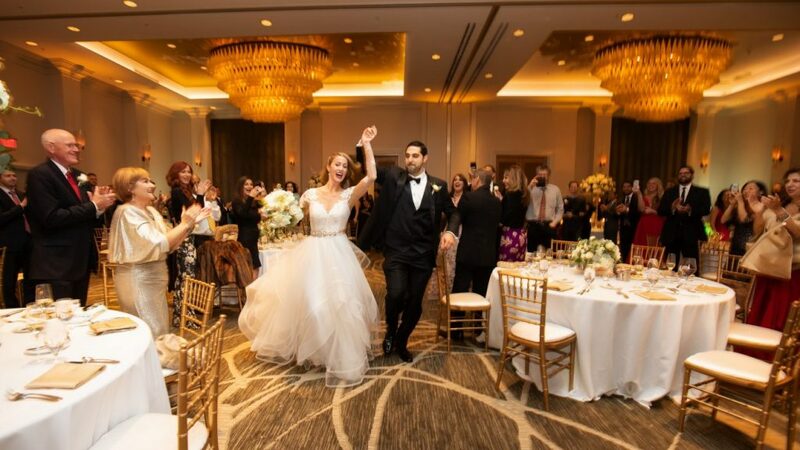 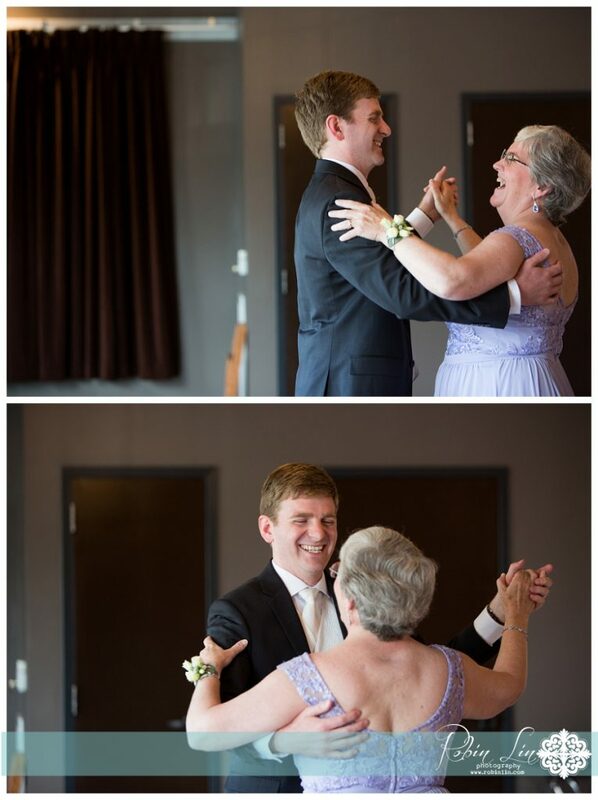 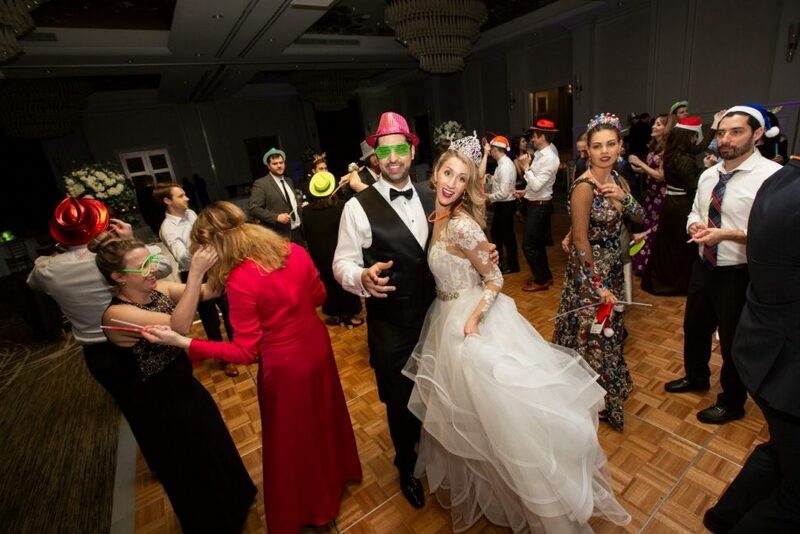 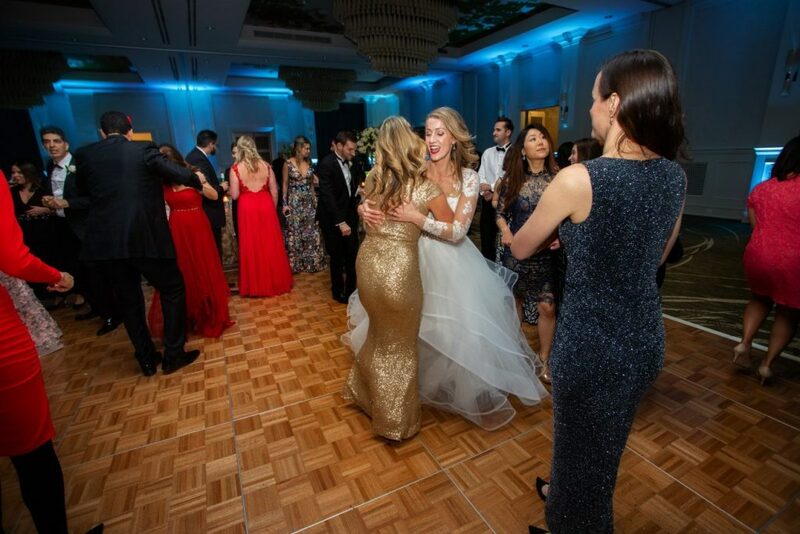 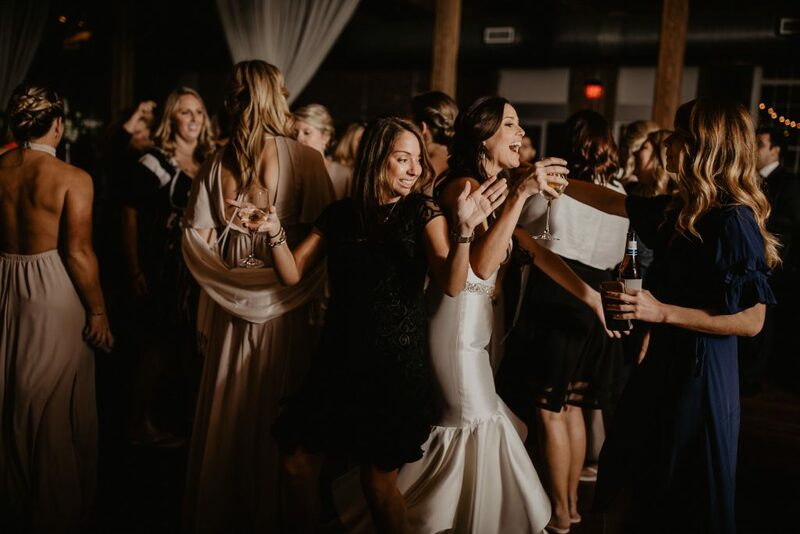 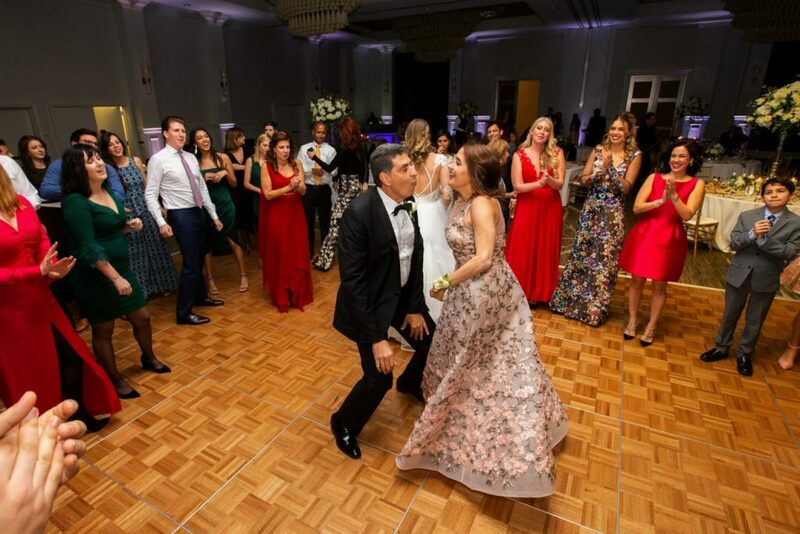 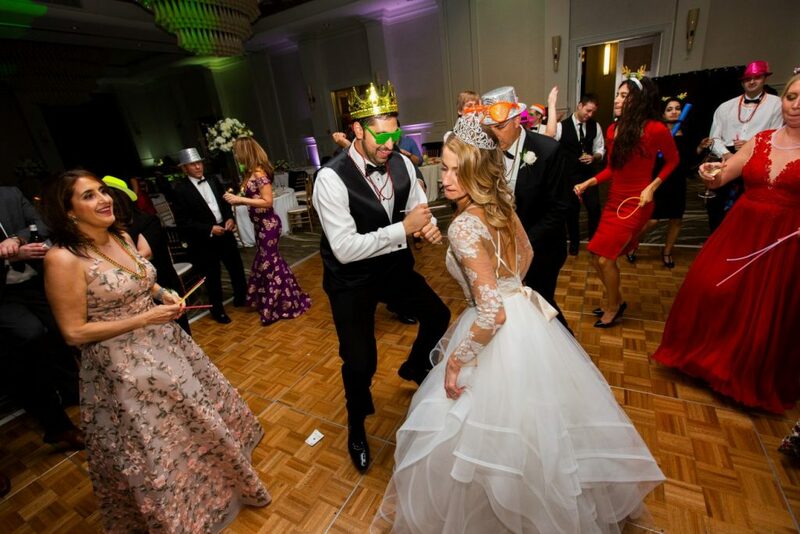 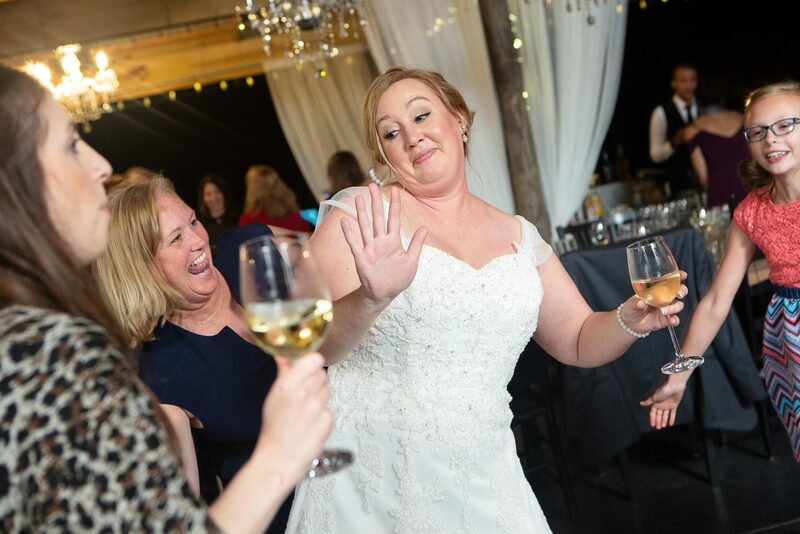 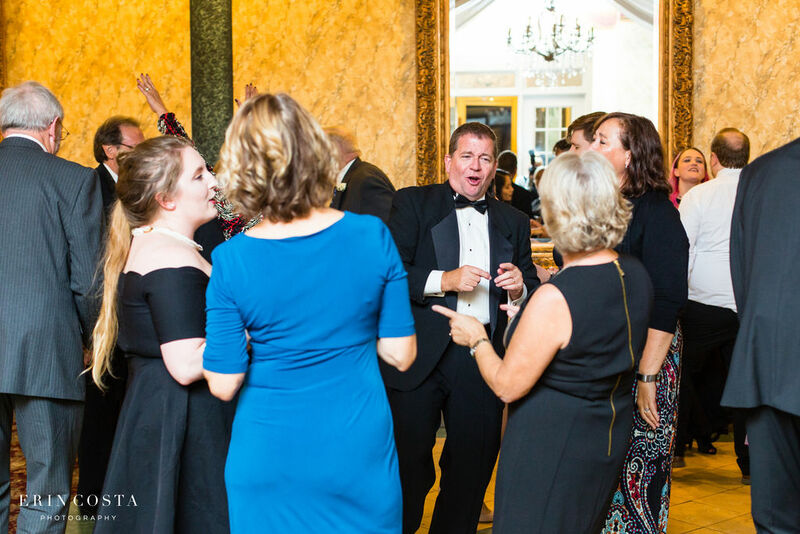 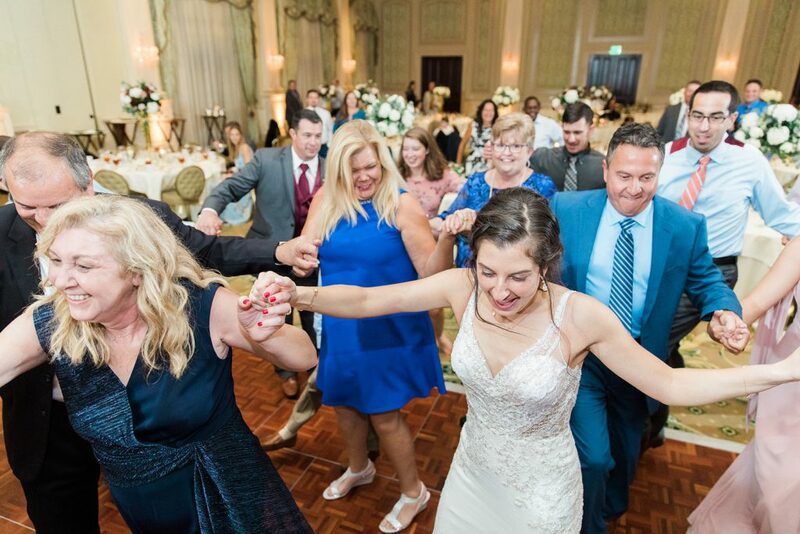 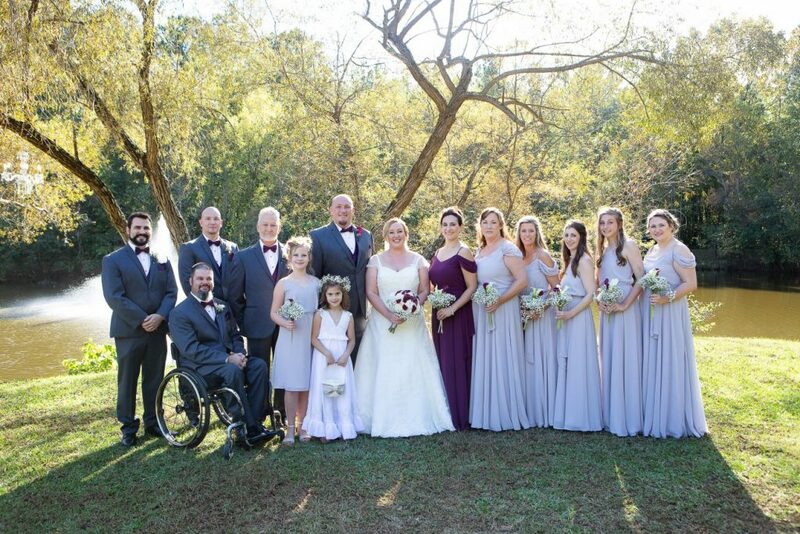 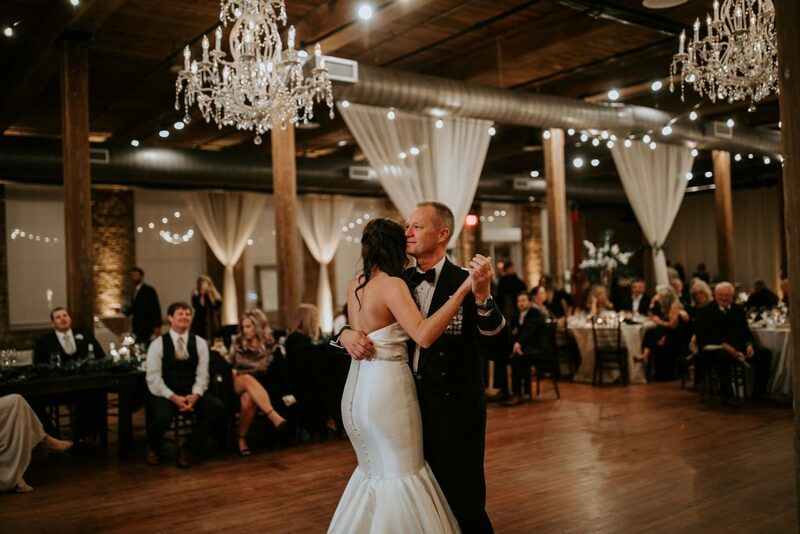 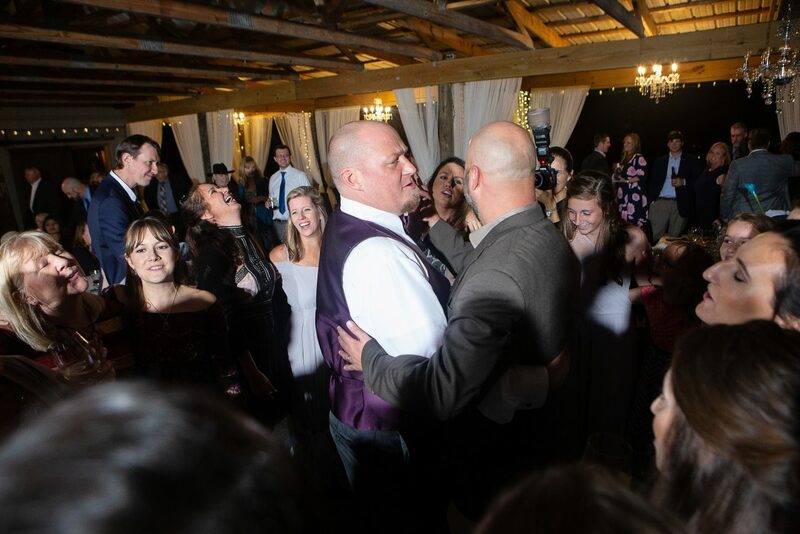 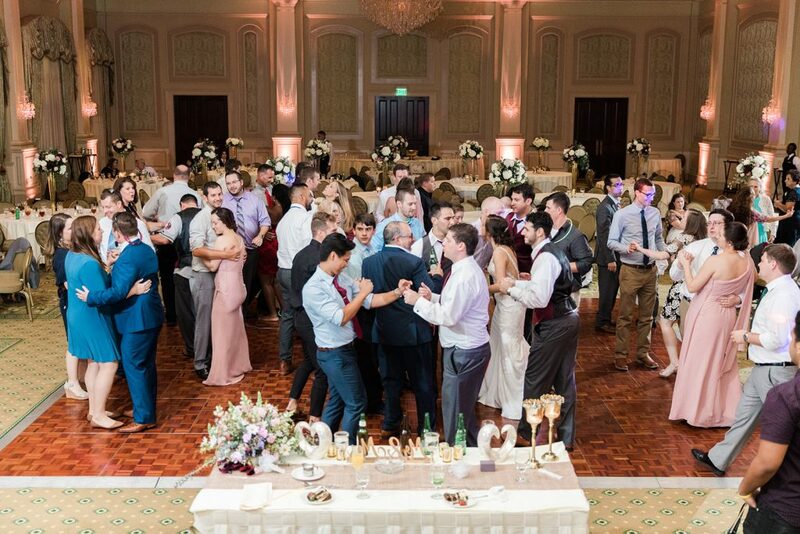 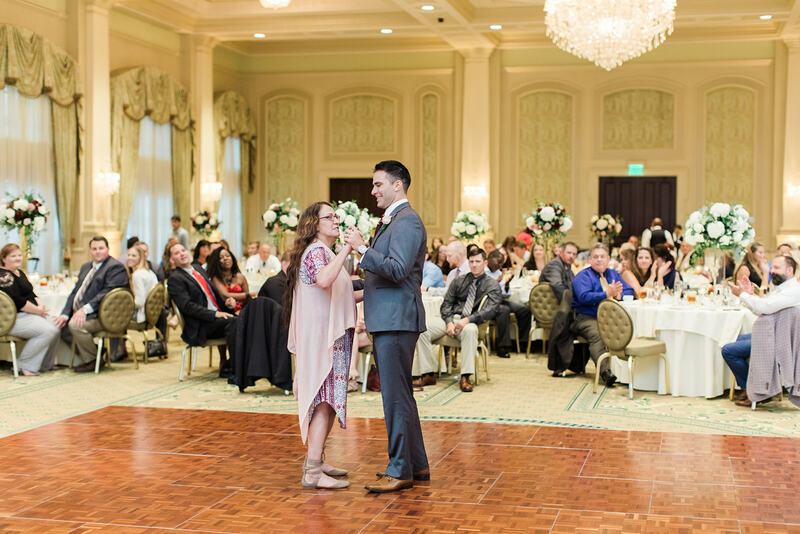 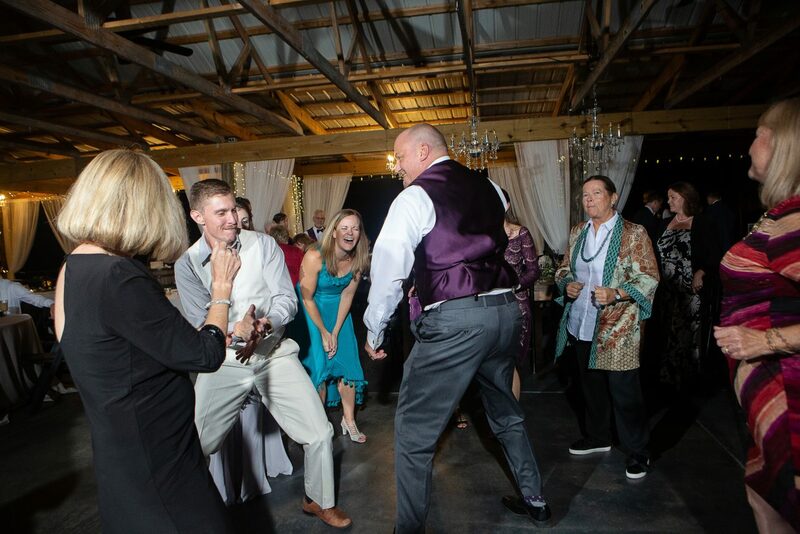 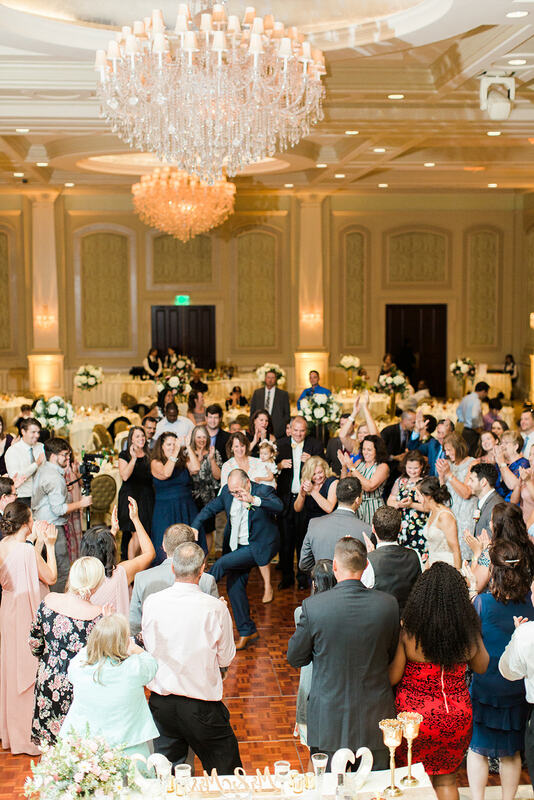 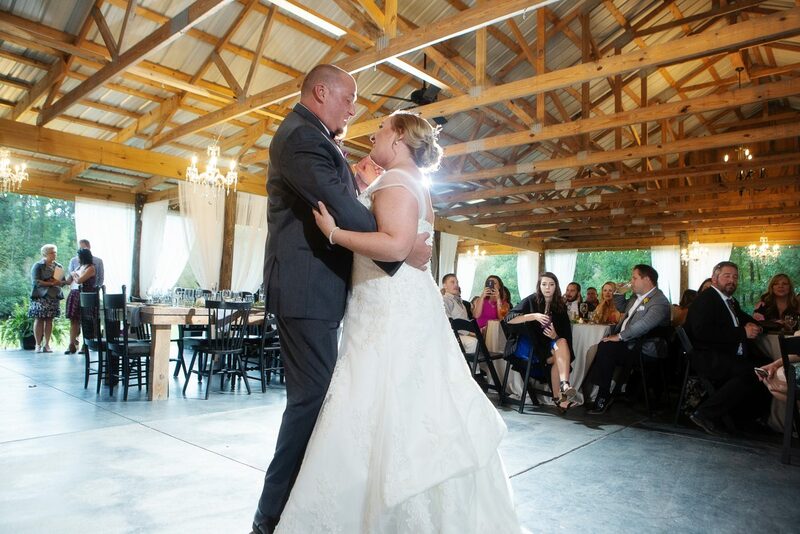 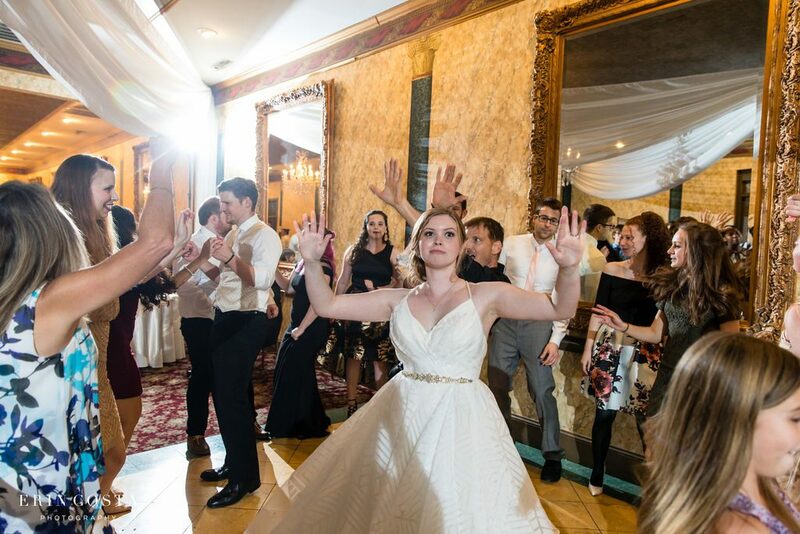 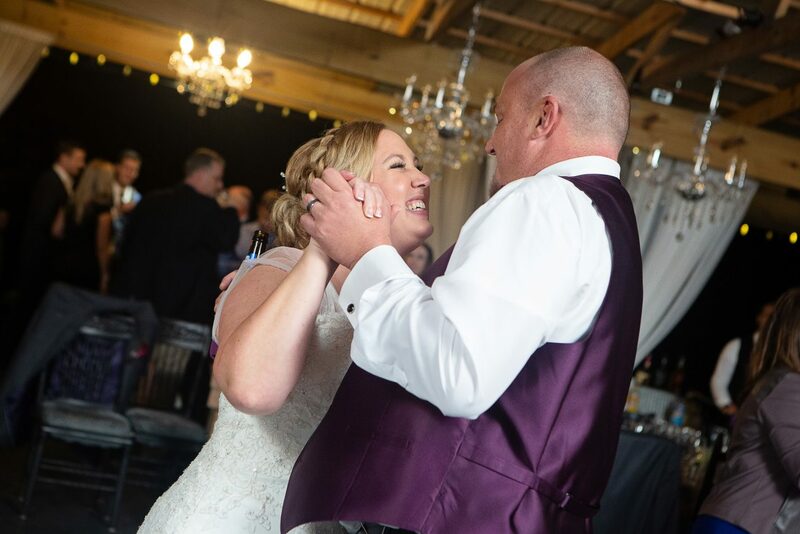 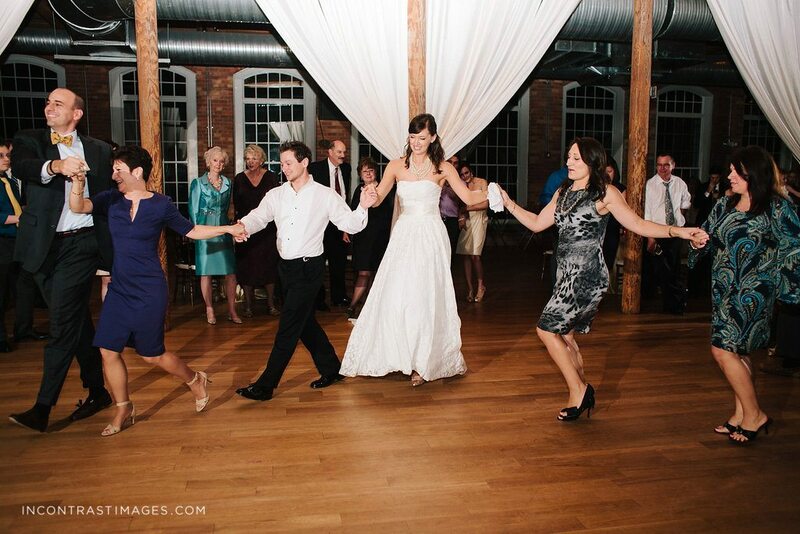 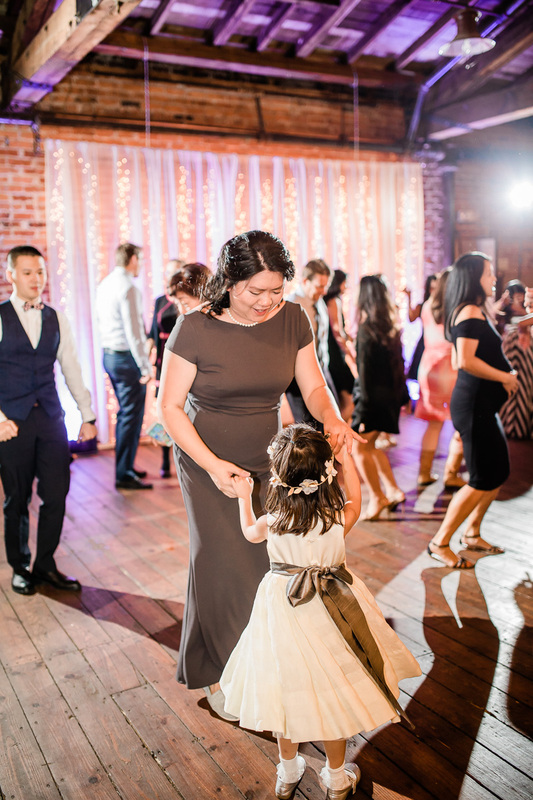 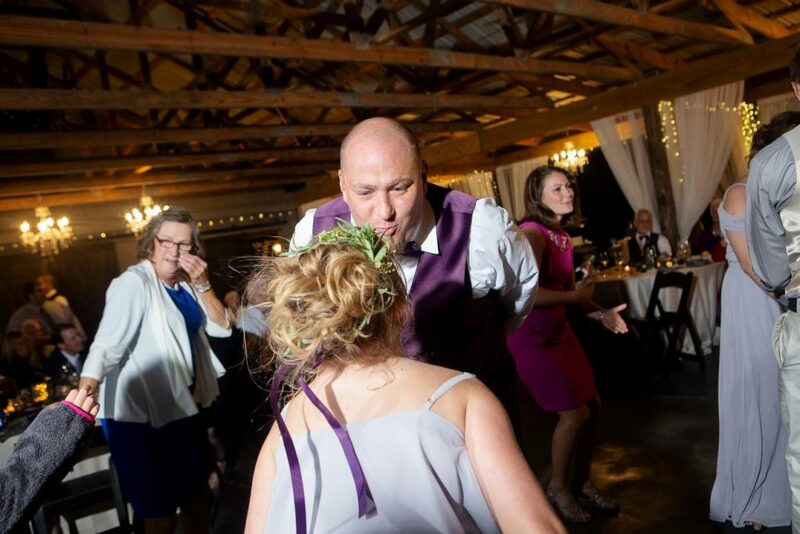 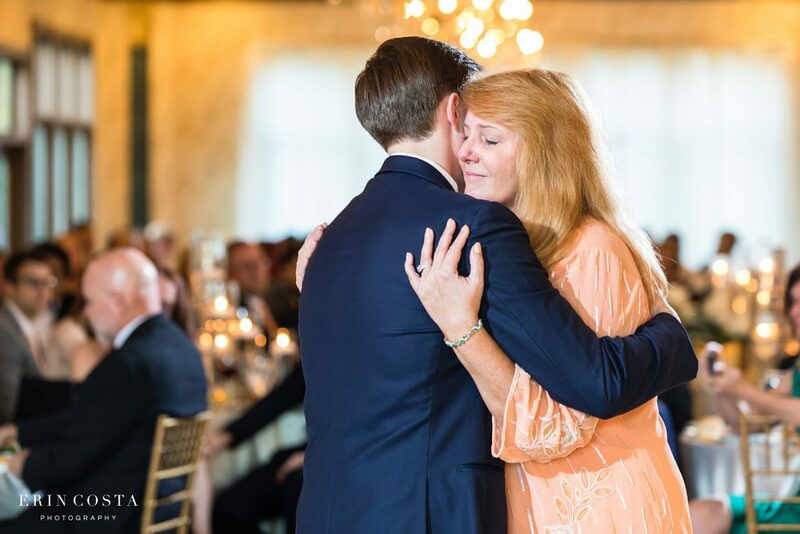 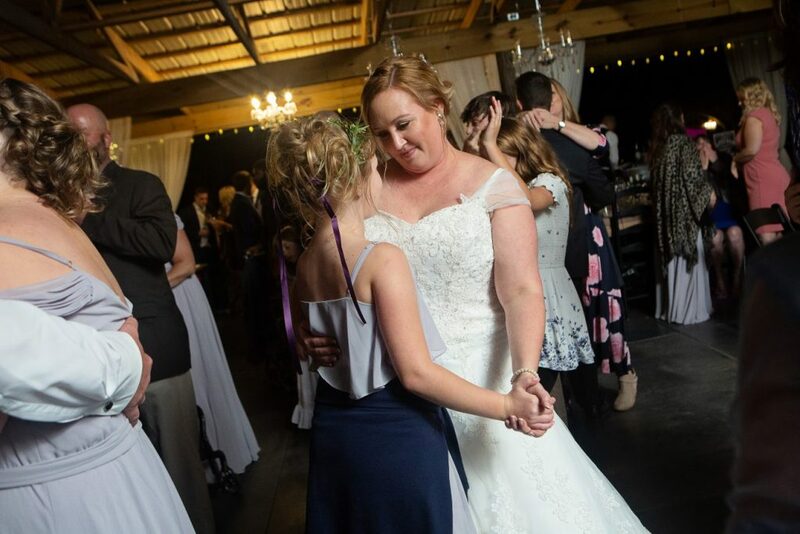 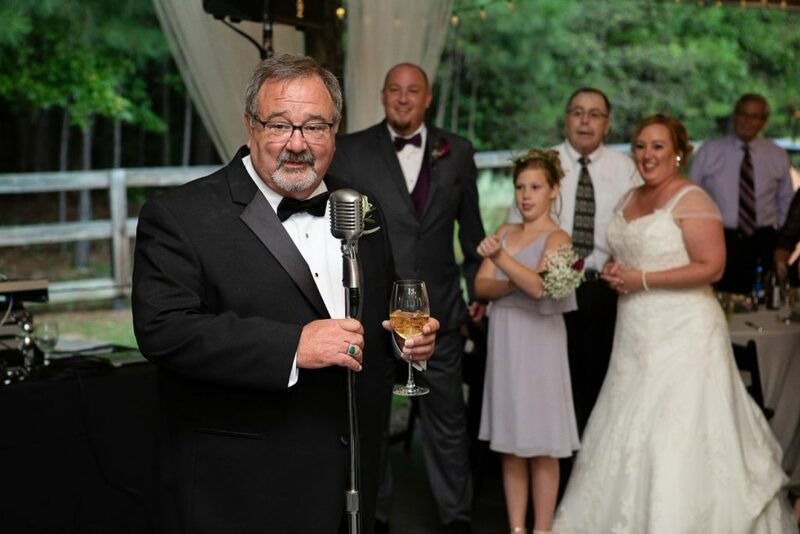 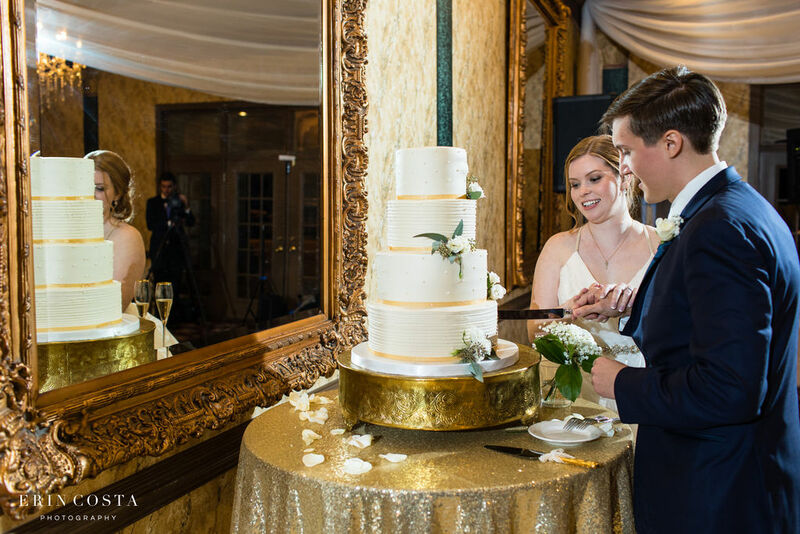 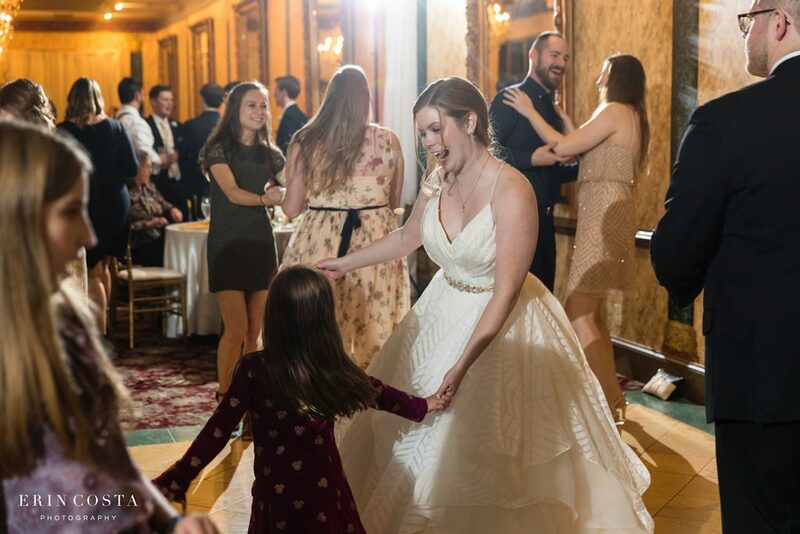 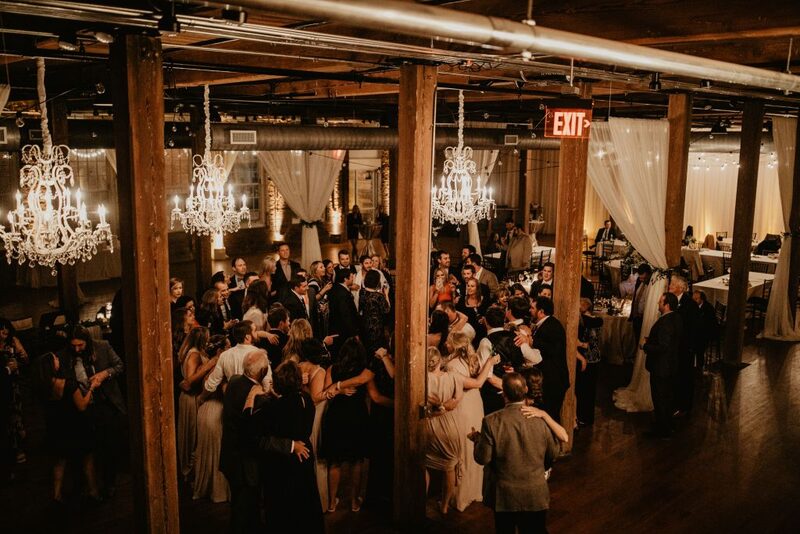 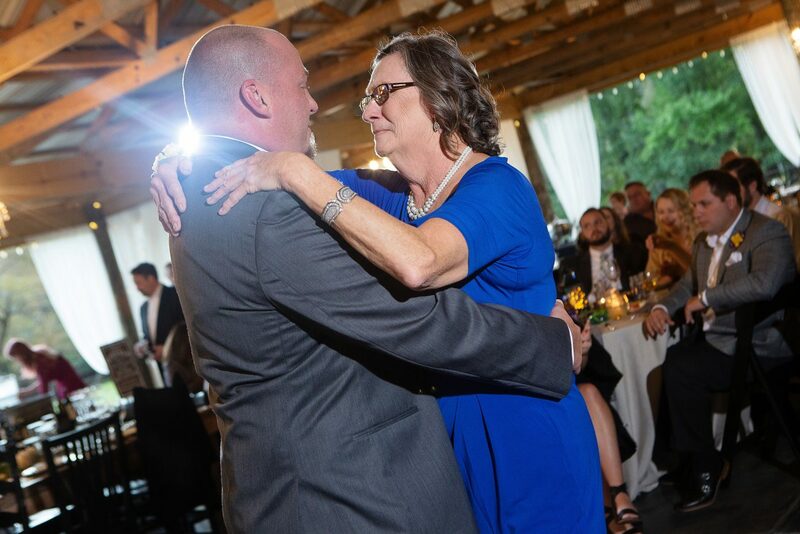 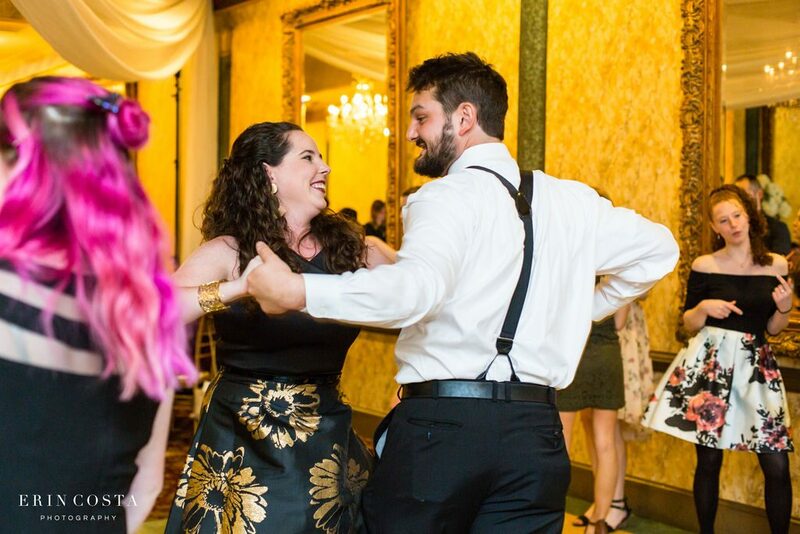 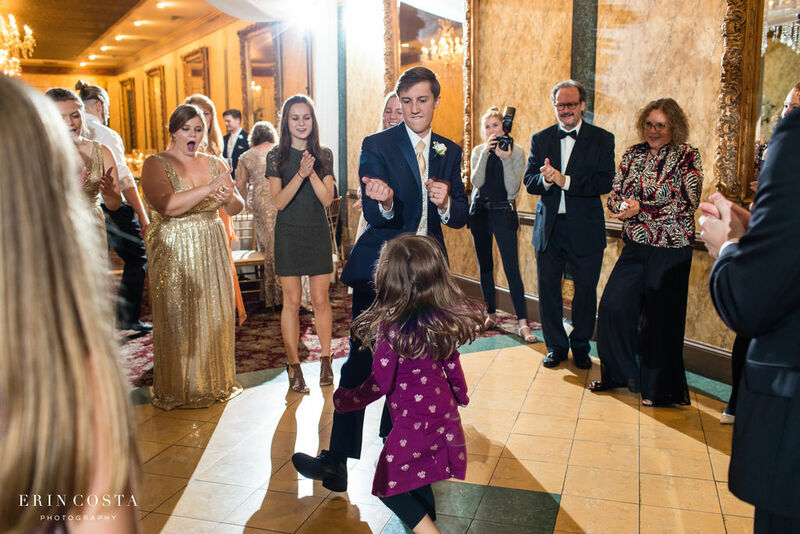 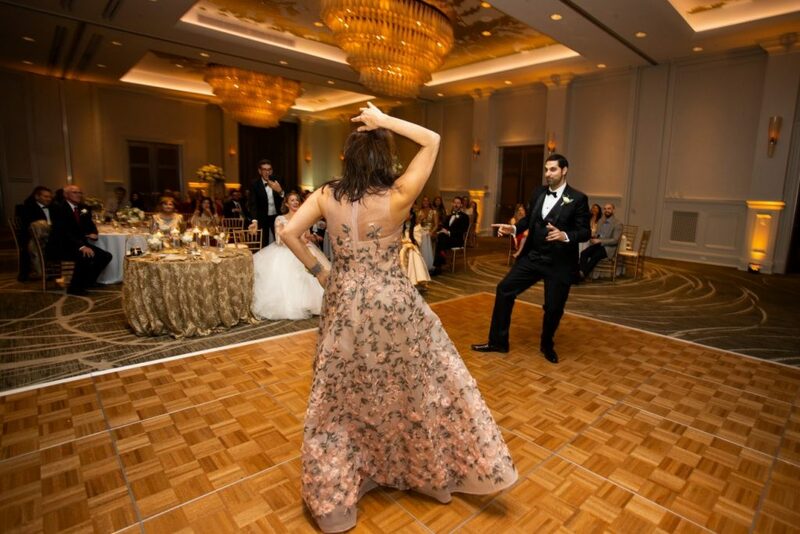 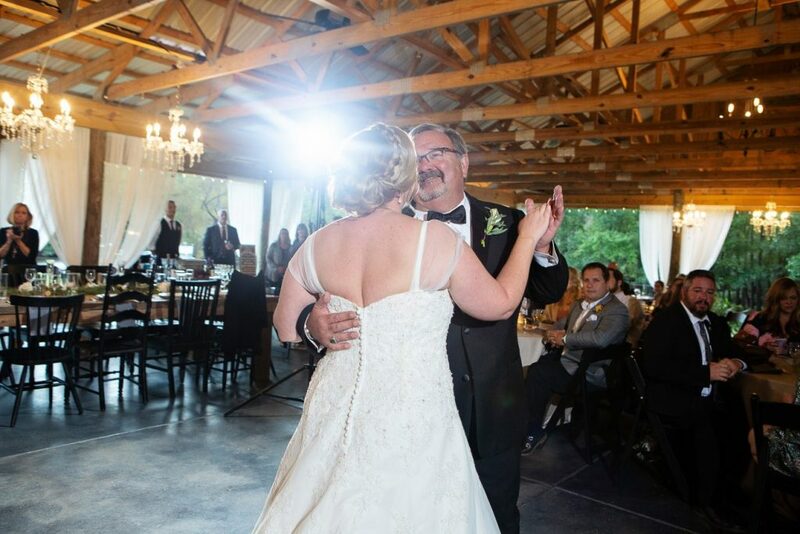 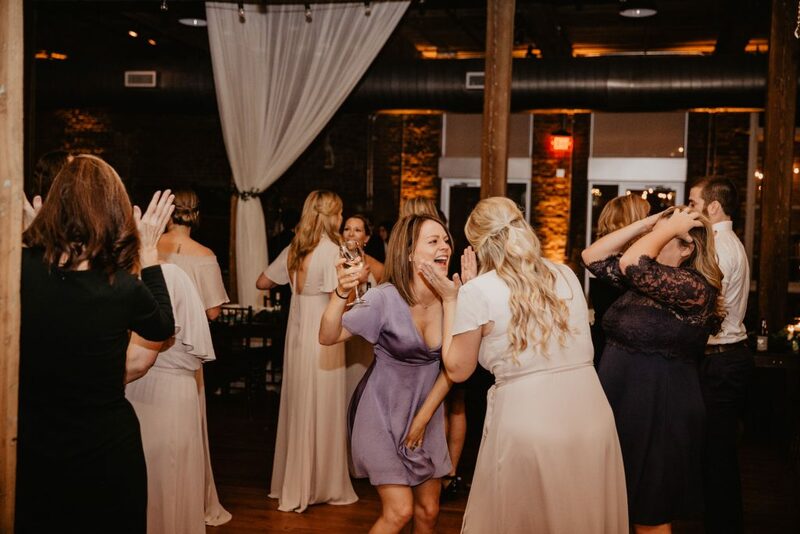 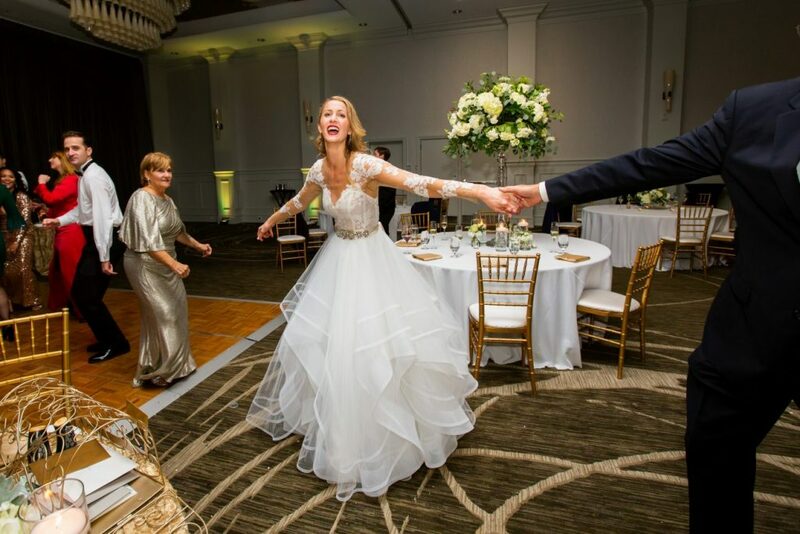 Since, they were such close-knit family focused people, most of the guests were family that had traveled a long ways so we had a super fun celebration on the dance floor from start to finish! 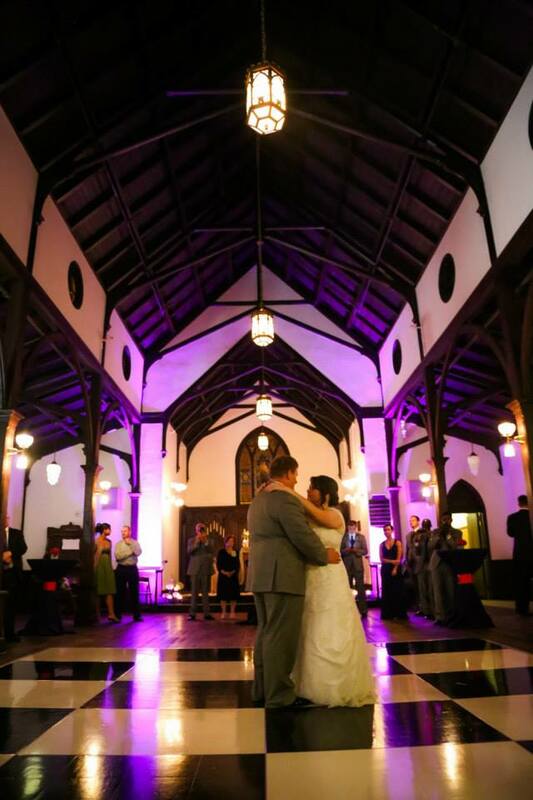 Congratulations and thank you so much Patrick & Shannon! 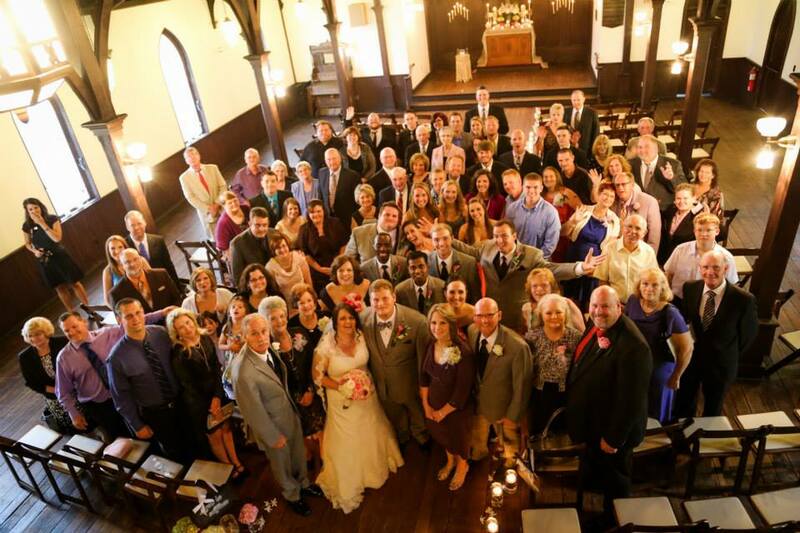 Shannon & Patrick’s Wedding Vendor Team!